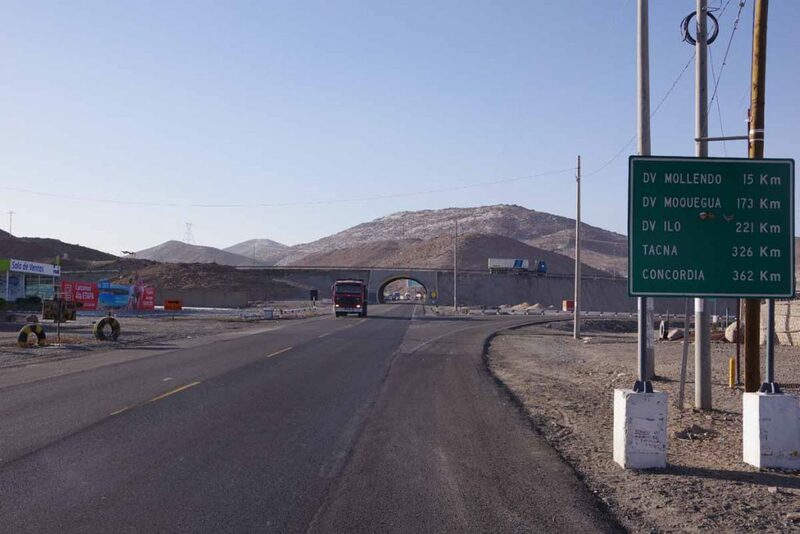 Easier than expected crossing of the border into Bolivia. 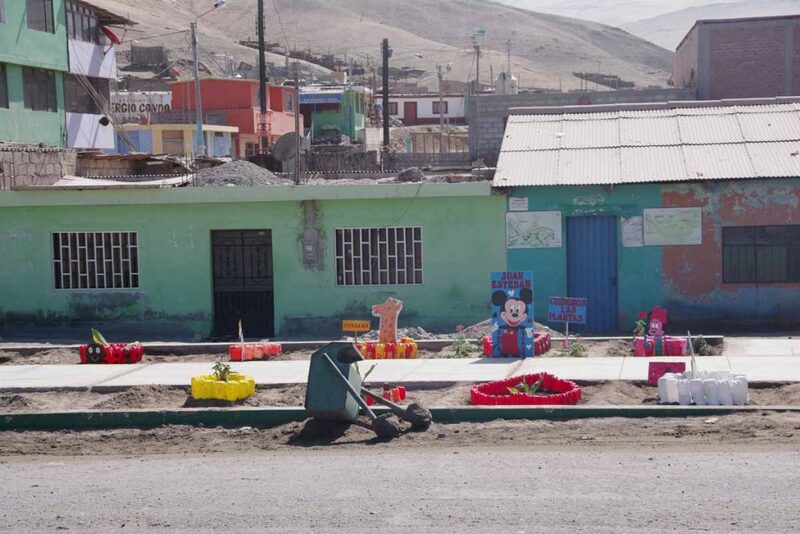 I spent some time in Puno getting the photos and copies made of what I could. I put together a rough itinerary that included roughly 16 riding days and some extra rest days so I had some margin and wouldn’t get a visa too short. Proof of accommodation was tougher, but in the end, I reserved the first night hotel (tonight) on Expedia and planned to point to my tent and list of places on the itinerary to suggest several were picked as places with hotels. Proof of departure was a bit tougher. The internet suggested one technique was to have an airline or bus ticket, print the information and then cancel. That seemed a bit strange. 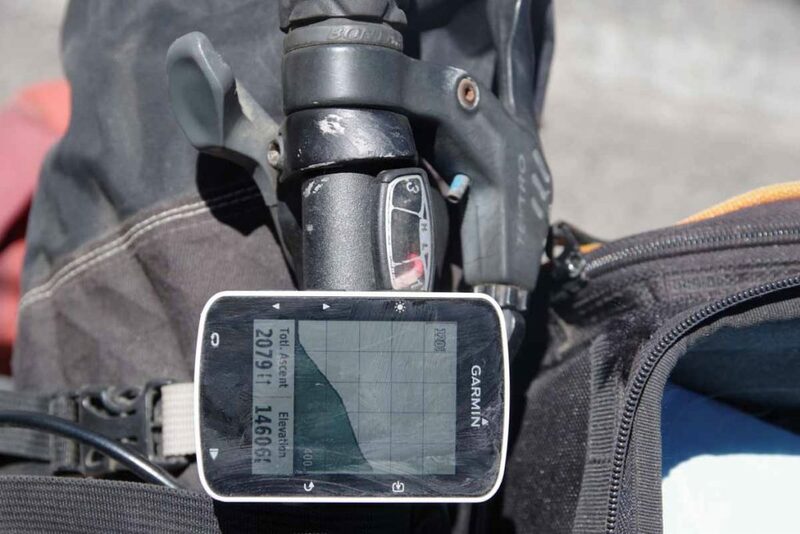 In the end, I decided to argue, if necessary, that my loaded bicycle was proof of departure and printed out a page from my web site that described the overall goal of cycling from Alaska to Argentina. When I actually got to the Bolivia immigration line, it went smoother than I expected. 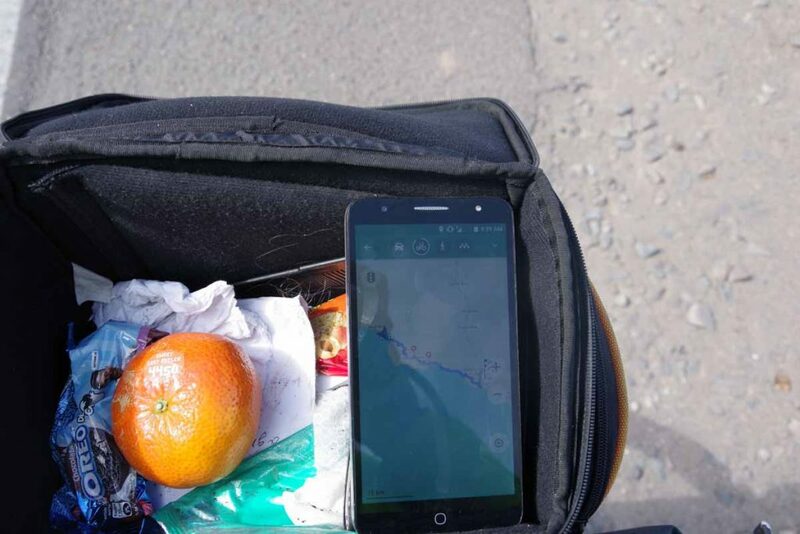 He very quickly acknowledged the documents, stapled them together with the photo and entered information into his computer system to print off the visa. I actually think the yellow fever document might have helped since he even looked a bit surprised to see it in my document stack. 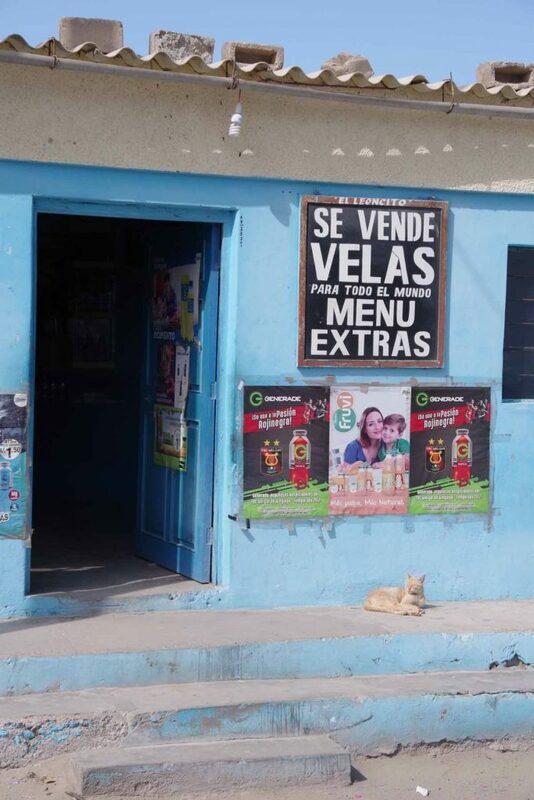 For those who don’t quite have everything together, the photo above shows a very nearby internet cafe and photo shop that one can use to quickly put together missing items. Riding today was a relatively easy ride along the lake. Some fish traps I passed. 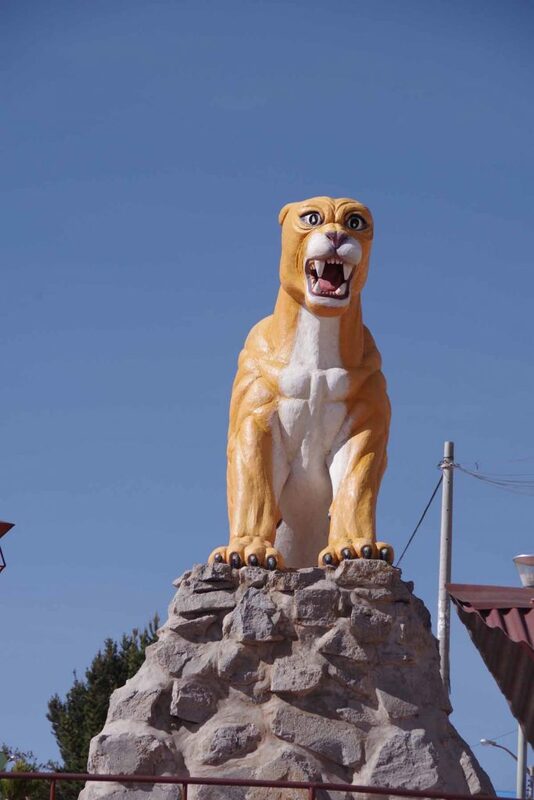 Entrance to one of the villages I passed had a large tiger. Yet a different way to describe speed bump. 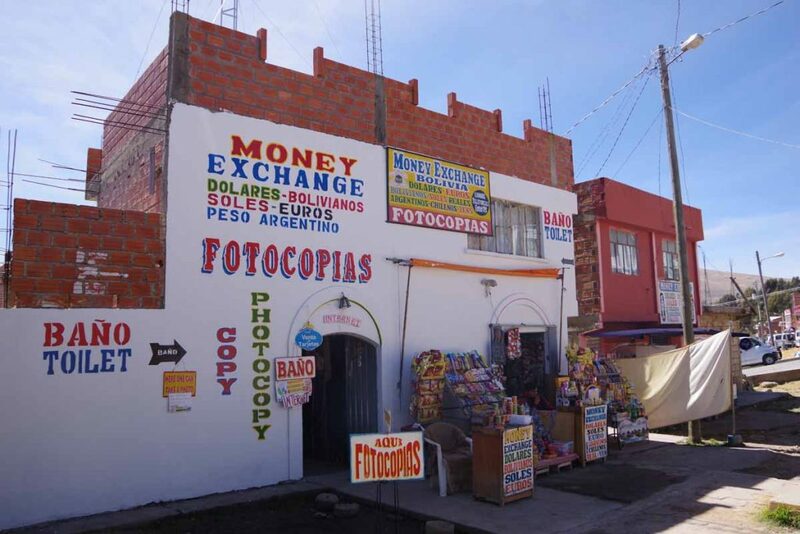 Mexico uses tope, Guatemala uses tumulus. 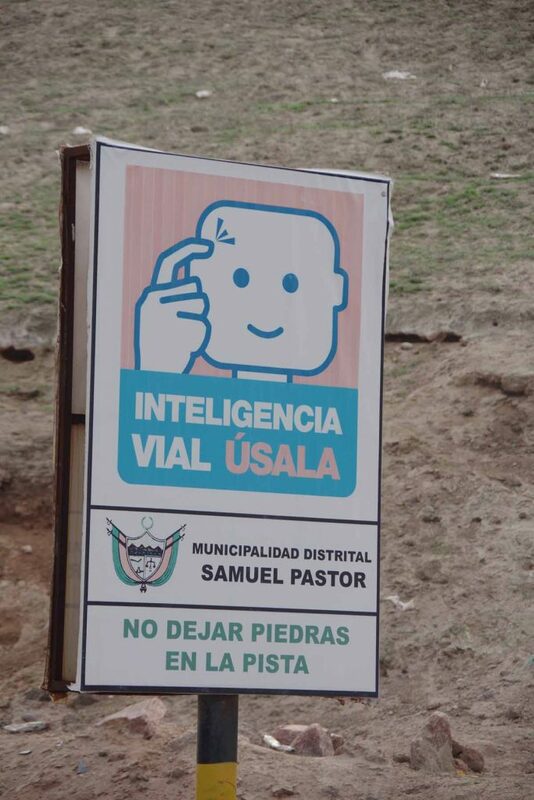 In Peru they are “reductor de velocidad”. 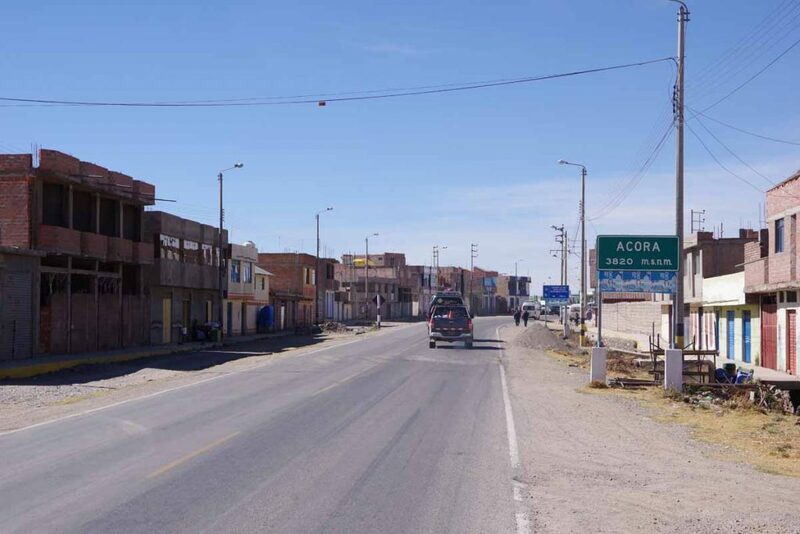 Last little town on the peruvian side. These folks were walking the last kilometer or two to the border. When I saw them later in line, one explained there was some problem with their bus, e.g. a strike or it broke down. I exchanged my remaining Peruvian Nuevo Soles to Bolivian Bolivars. I was surprised the rate offered was slightly better than my application suggested. I also went to the peruvian immigration to get my exit stamp. 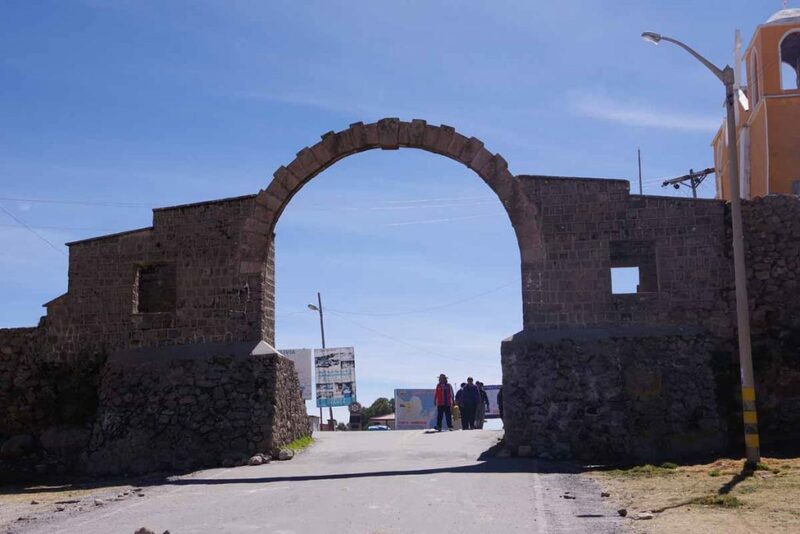 This arch marked the border to the Bolivian side. Immigration office and procedures described above were just on the other side. This is a surprisingly touristy town. There are many different hotels and hostals. Even places that will do your laundry in a few hours. I walked down and found a shop that sold me a SIM card, so I should have internet from my phone, at least where coverage exists, and make sure I don’t run out of data. 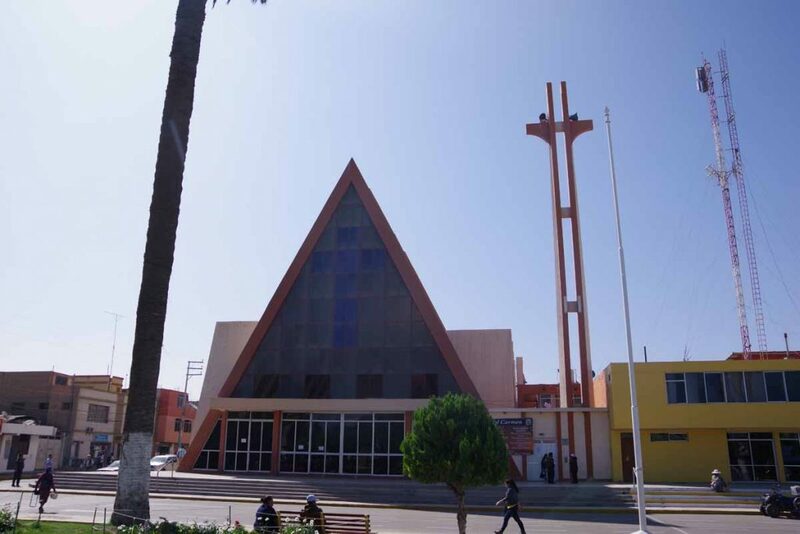 A view of the large church. 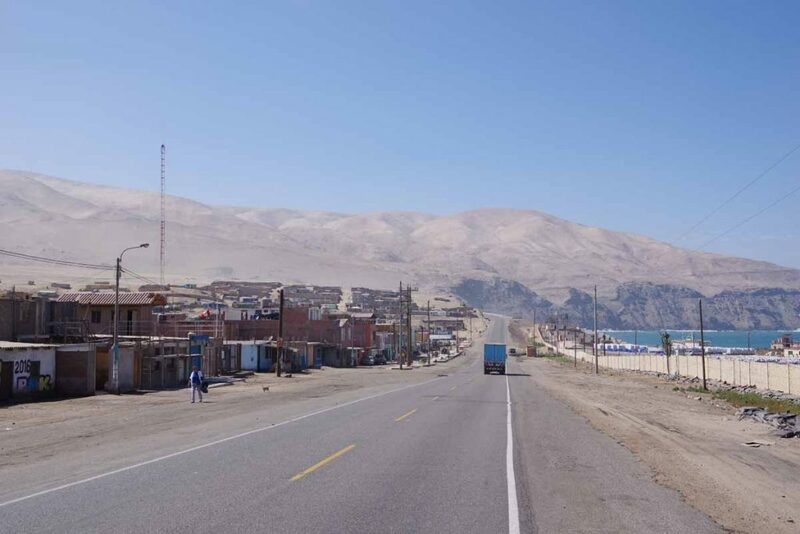 From Copacabana to Oruro, expect five or perhaps six days of riding. 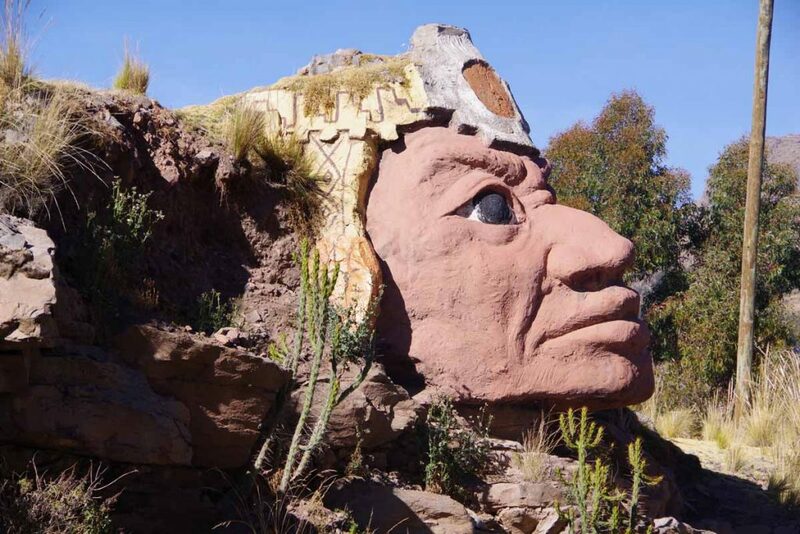 La Paz is a special case since the main city is down in a valley about 300 meters lower than El Alto where one enters and leaves. 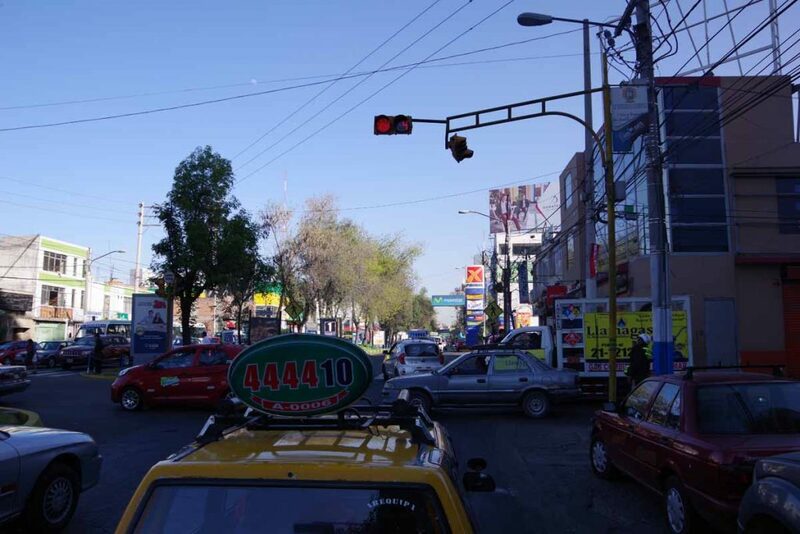 The steep hill and lots of traffic mean I might just stay up in El Alto instead of going down. 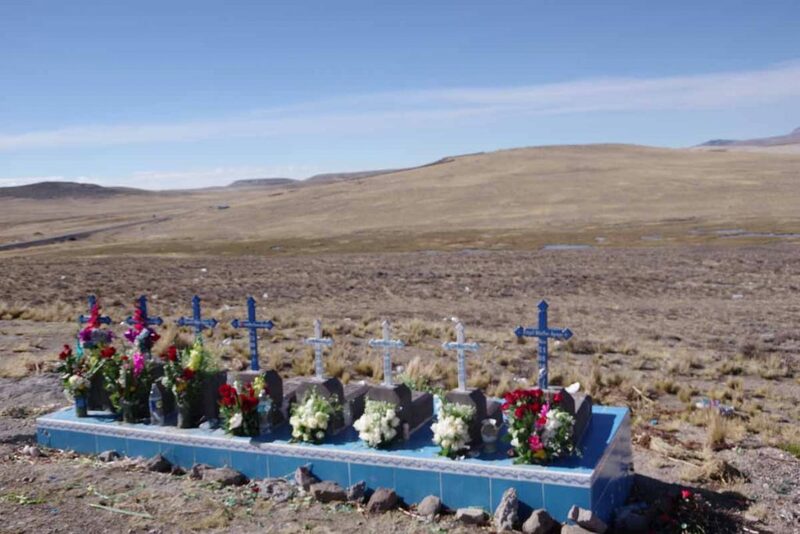 That does make it less likely to find wifi in a hotel, so these five days will be hit or miss until Oruro the next big city. 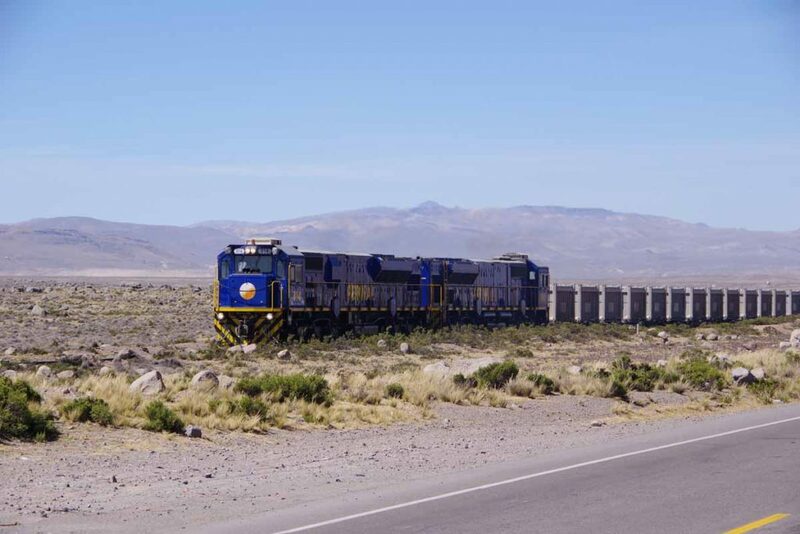 From Oruro to the salt flats (Uyuni), expect six or seven days of riding. 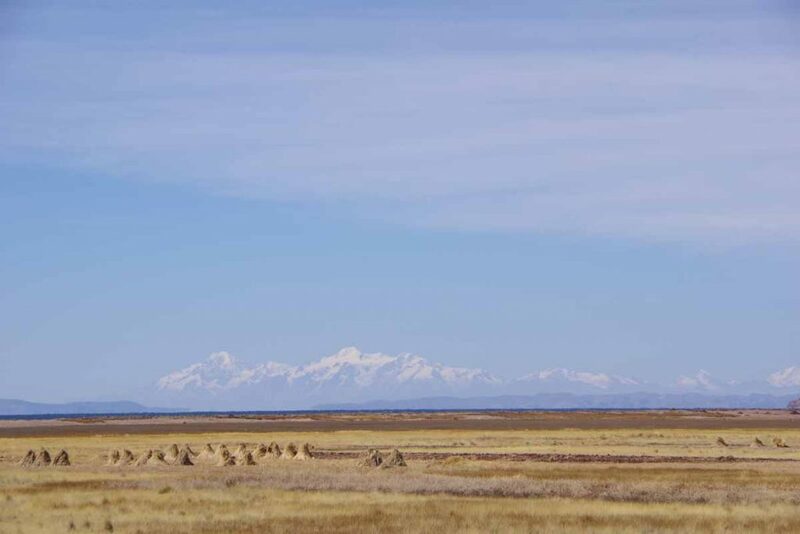 Likely some of the most remote areas, though I’m also likely to take the route that is followed when it is wet (summer) and one can’t ride on the salt. I’ll go out on the salt flats but not spend entire day and a half riding them. 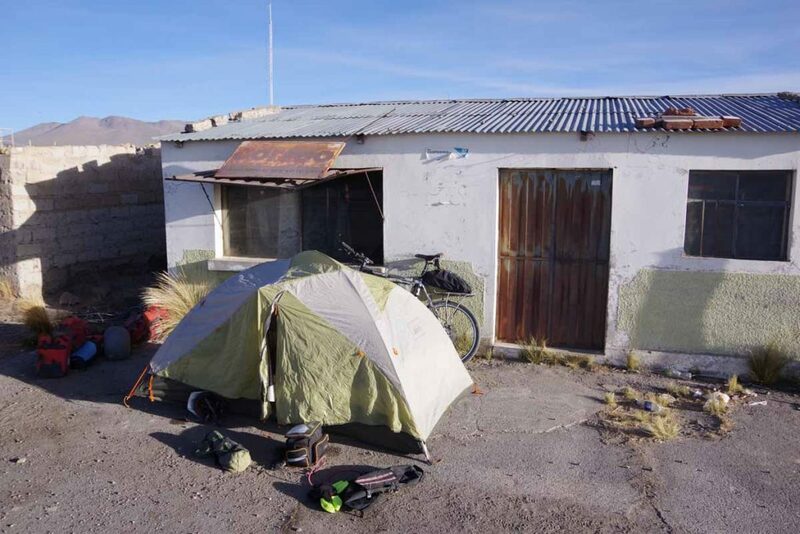 From Uyuni to the southern border (Villazon), expect four to six days of riding. Some hillier cycling here. 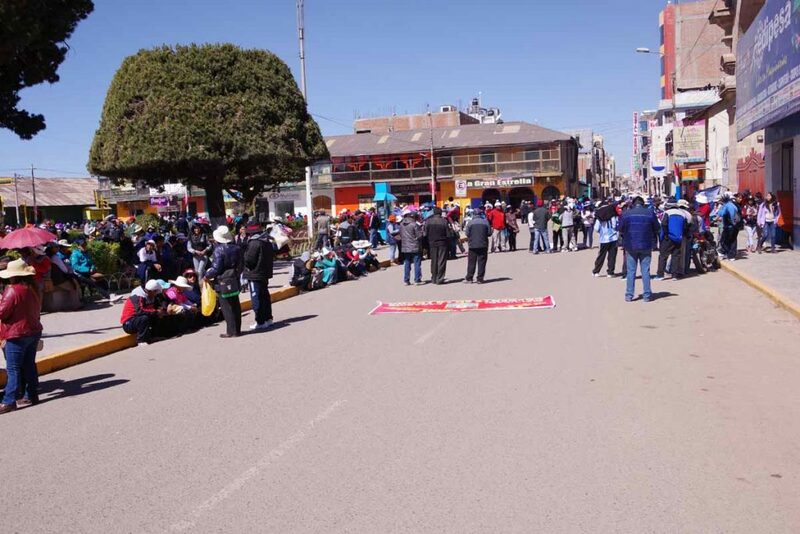 Add some rest days in Oruro and at the salt flats and roughly that is the current plan with Bolivia. Plans are plans and can change, but at least a rough idea. Relatively flat ride. 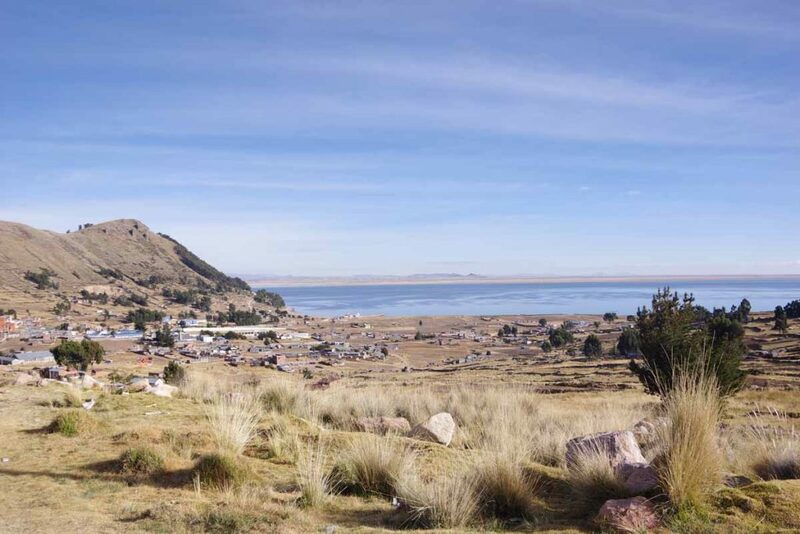 Some along Lake Titicaca and rest farm areas further inland. 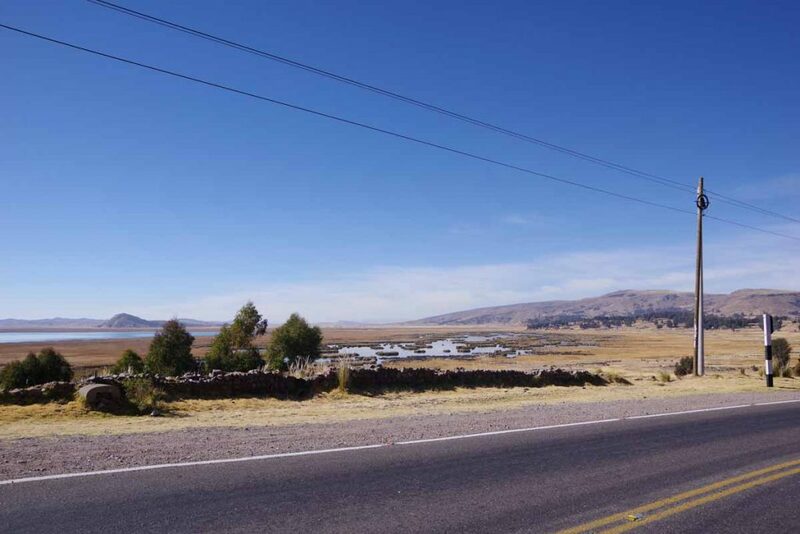 Puno was warmer than previous nights but still waited until an hour after sunrise to get on the road. First picked my way through town including past this church. 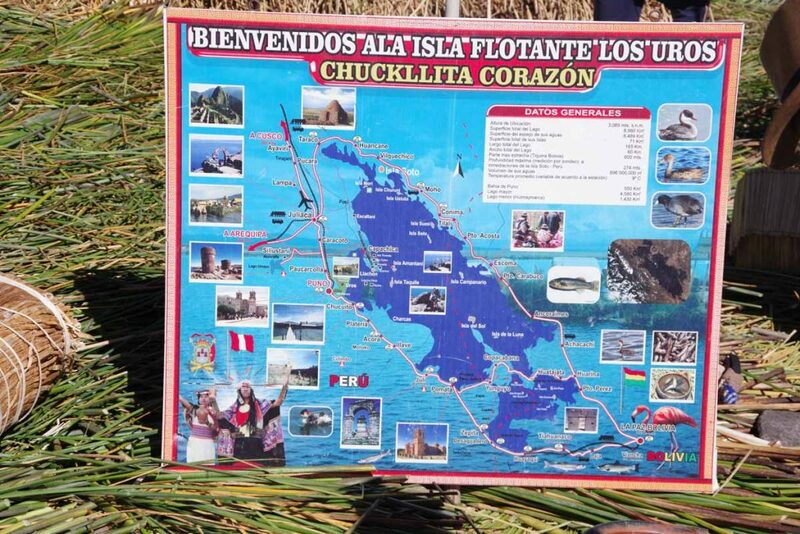 Off to the left was some shallow parts of Lake Titicaca. Not quite sure why these flanked the road. They make these little triangular haystacks here. This woman had her hands full keeping several different types of livestock on tethers. One of the little towns I passed through. Just as in Colorado, many of the towns here have their elevation on welcome signs. 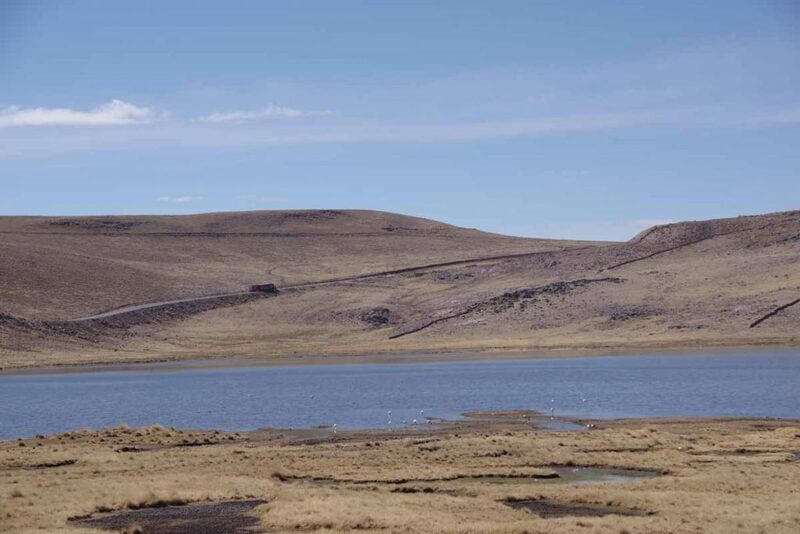 3820m is 12,530ft or close to elevation of the lake. 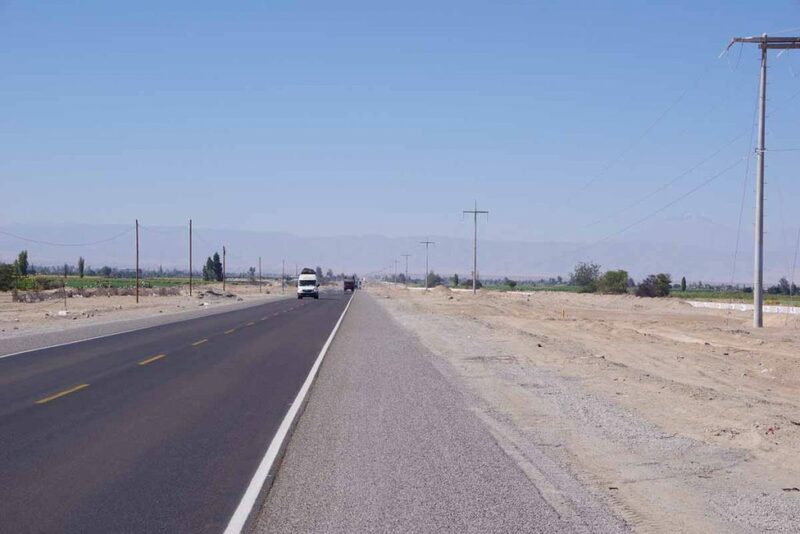 A section of fairly wide open road. I am not sure how green it gets here, but it is now winter and a drier time of year. These houses seem to be coordinated. Not sure if they are normal living spaces or only occasionally. I found the tilt in the sedementary rocks interesting. Not sure on the geology here. 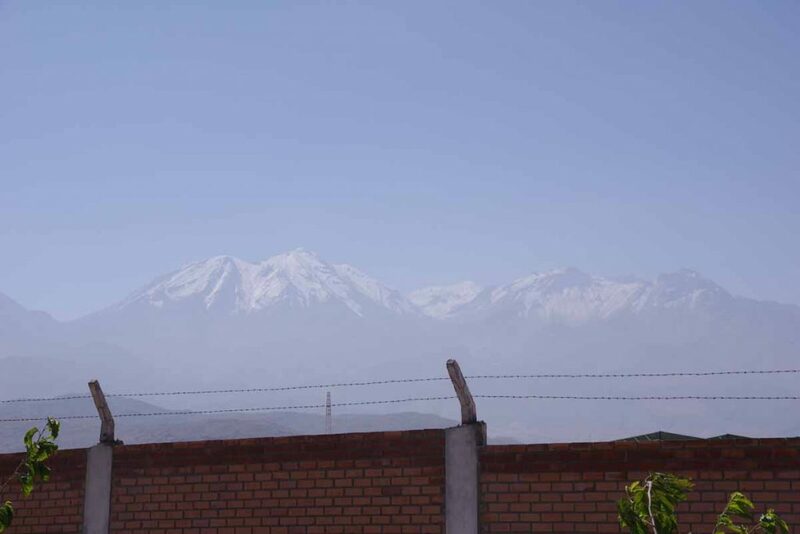 Some mountains visible on other side of the lake in Bolivia. Made my way past this entrance sign in Juli and found a hotel off the main square. There were marchers in the square. From their banners, it looks education related. A day to be a tourist and plan some additional details for Bolivia. 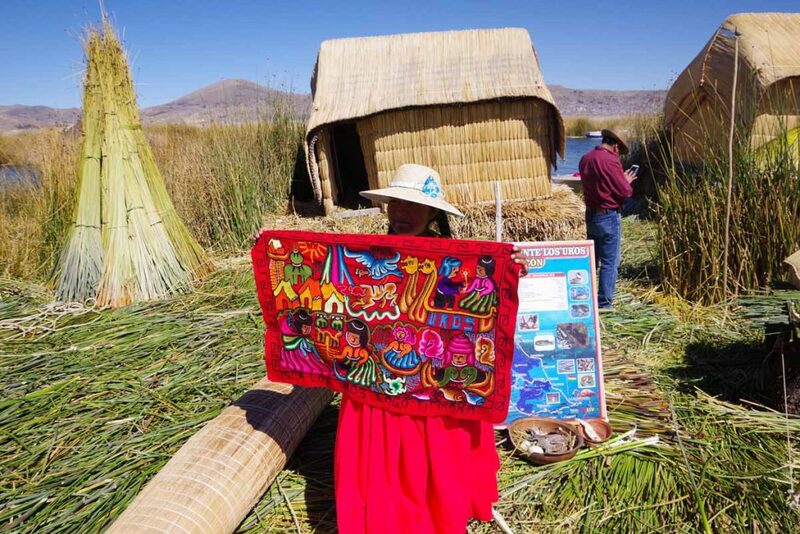 This morning I took a boat tour to the floating islands near Puno. 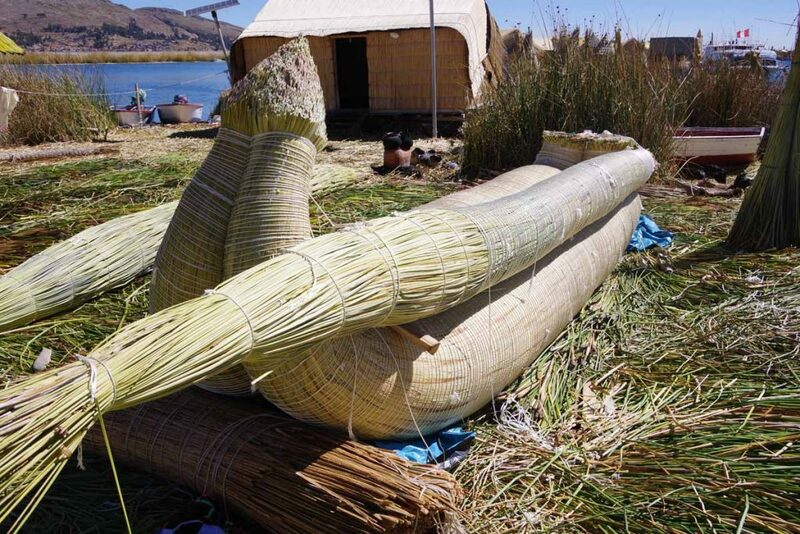 These are inhabited by Uru people and hence are also referred to as the Uros Islands. It was about half an hour slow cruising on our tour boat to reach the islands. Each island has half a dozen structures and is inhabited by five to eight families. Hence, our boat picked one of the islands and locals there provided a tour, allowed photos and otherwise hosted. It was fun. What I actually found most intriguing was feeling the ground move up and down as the island bobbed in a wake of a floating boat. The explained how the island was constructed. 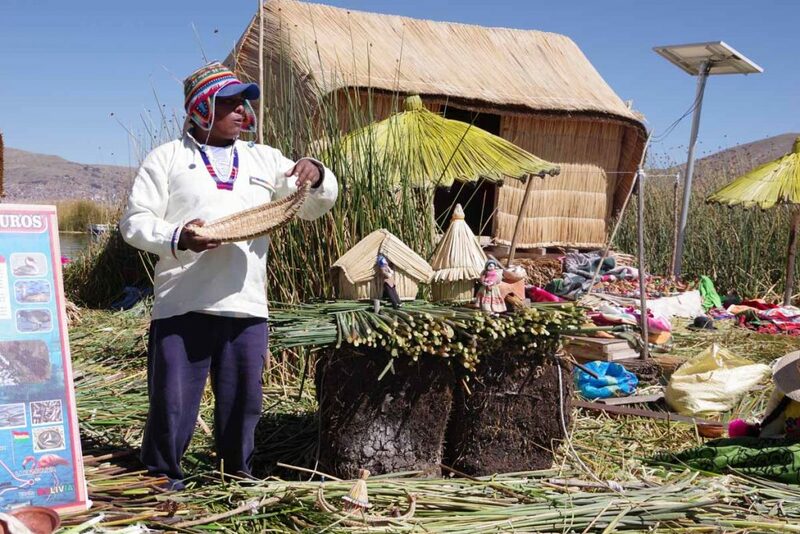 The sold and showed handicrafts. 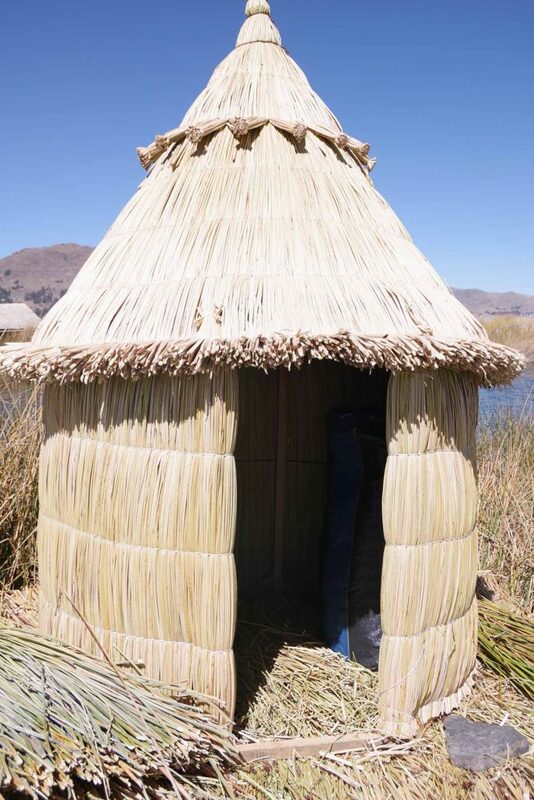 One of the huts in basic original form. 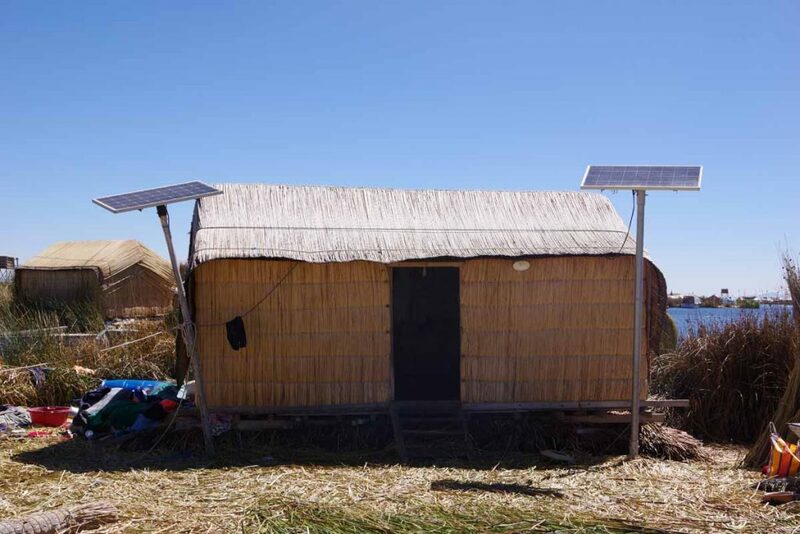 One of the huts in newer revised form. Also interesting to see the solar panels that drive electrical items including lights and televisions. 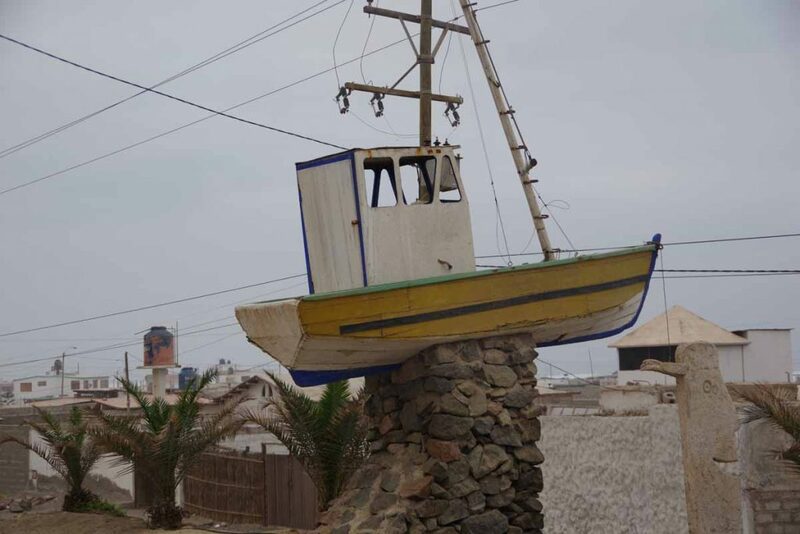 Construction of a boat. These used to last only a few months. However, newer construction methods that use both nylon line and plastic bottle materials (up to 1000 per boat) will make them last several years. Also a good overview of the lake. As a whole half day was reasonable amount of time to get a good perspective. 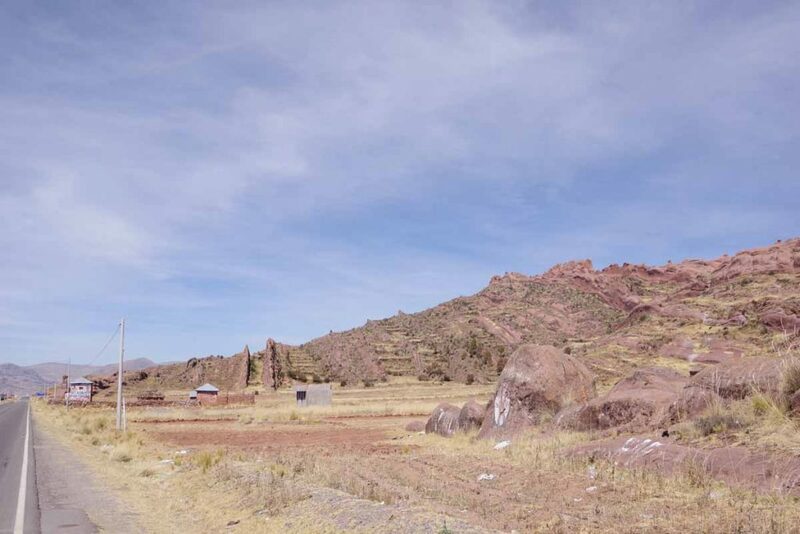 I have also been looking through blogs and planning a bit further on the ride across Bolivia. 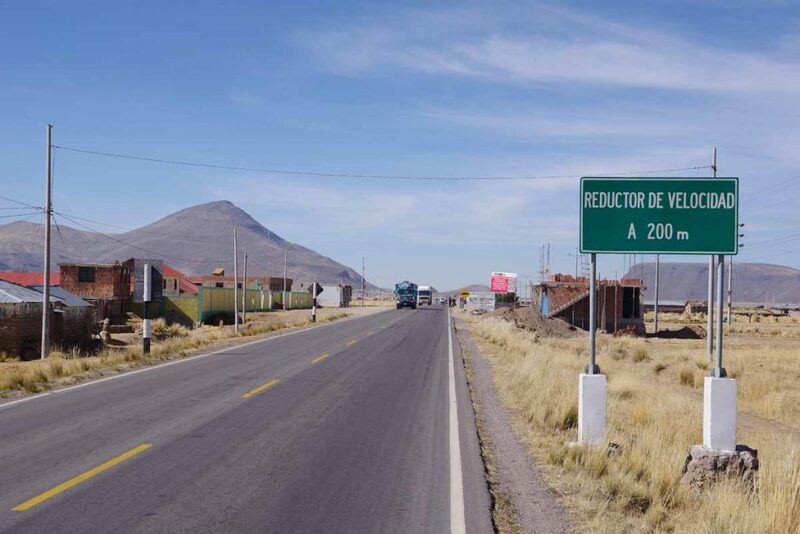 The general idea is to first go to La Paz (~300km) and then fairly directly via Oruro, the salt flats at Uyuni and cross the border at Villazon. 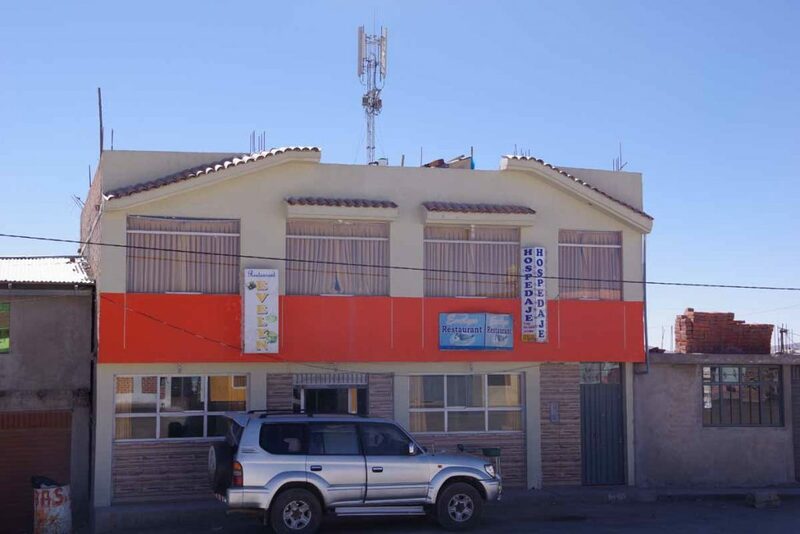 Until La Paz, there will be more towns where hotels have wifi. After that, it will be hit and miss with some larger gaps between internet service. 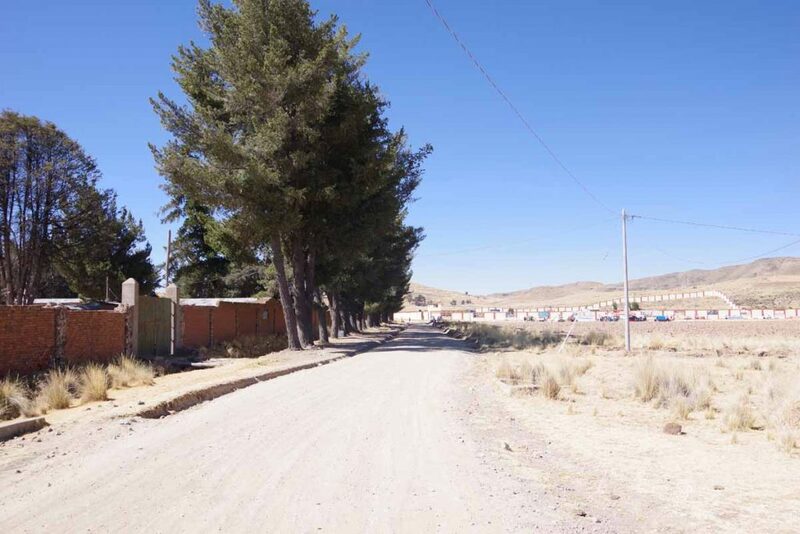 One blog I read had seven days without wifi between Oruro and Uyuni and they were making reasonably long days through harsh terrain, so I might have that or longer. 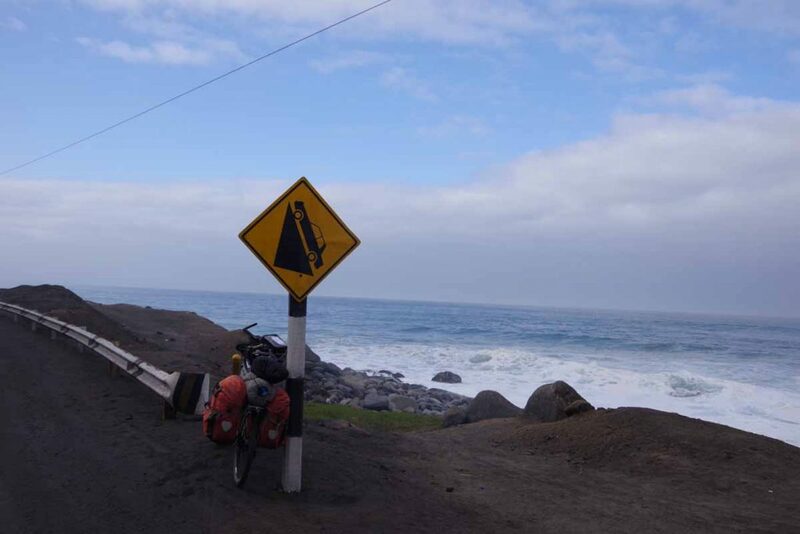 Fortunately, there are not huge amounts of climbing involved. 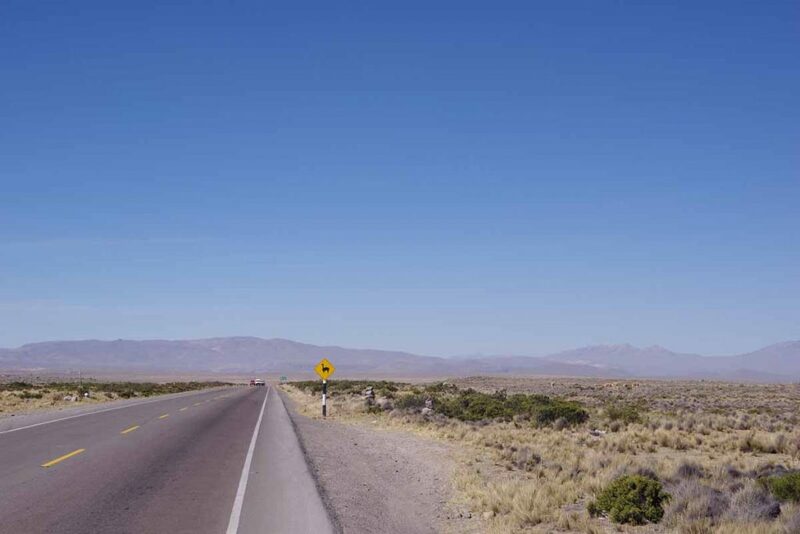 In total, expecting ~1650km until Salta through some beautiful but harsh terrain. 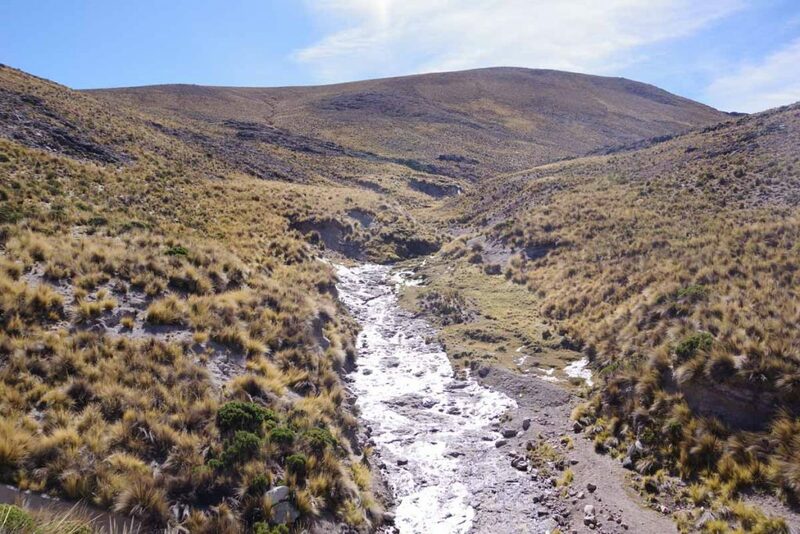 Nights will also be cold until I descend off the Altiplano. 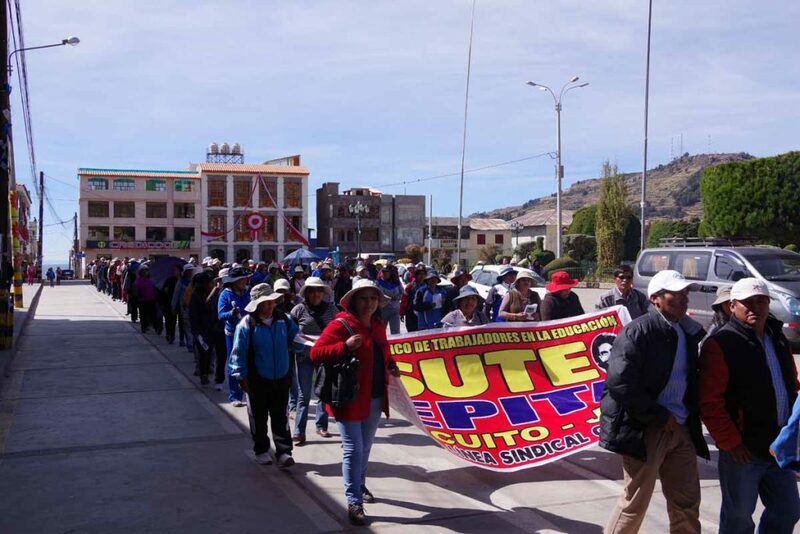 TDA expects to have a rest day in Puno on September 27th. This means I am now approximately 70 days ahead. I left Cartagena 83 days ahead of their July 9th departure. 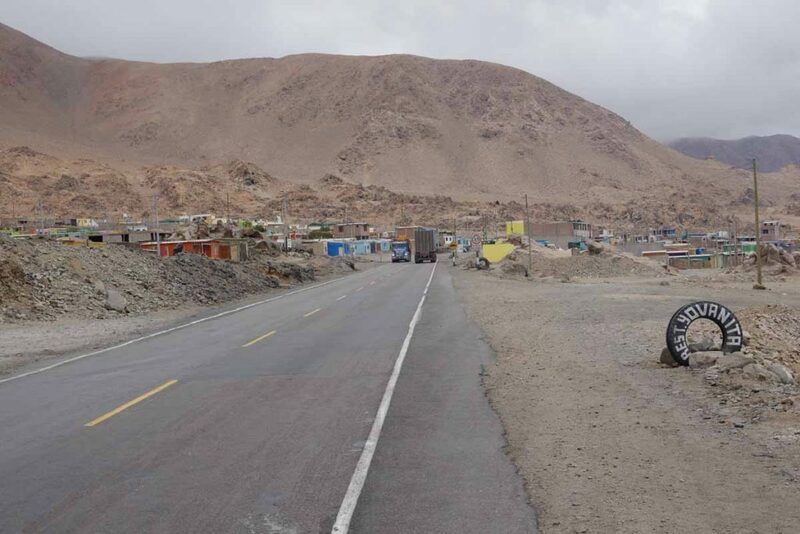 So roughly speaking, it has taken me 3 months to travel what TDA will ride in 2.5 months and they will have “caught up 13 of the original 83 days” by the time they are in Puno. Of course their route is also a little longer and with some more gravel roads and challenging riding that I bypassed. 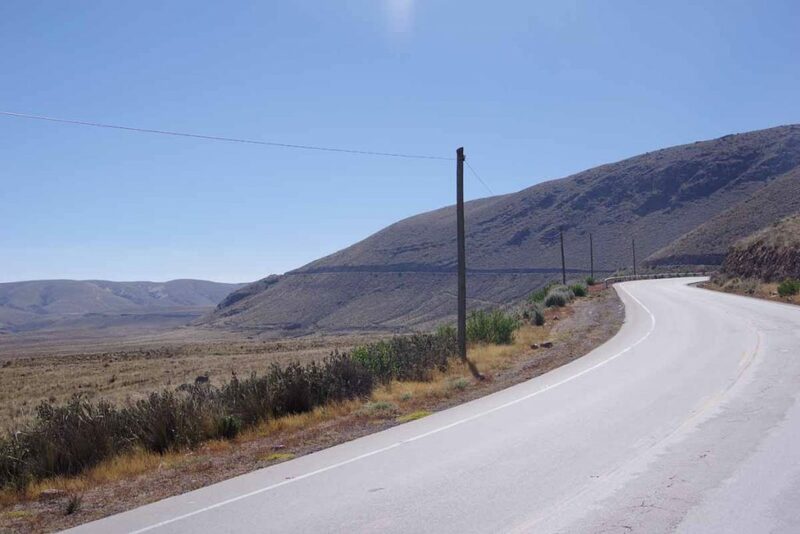 From Puno to Puerto Montt, I have approximately four months and TDA will have just slightly less than two months to ride a relatively similar distance but with TDA again occasionally picking tougher roads. 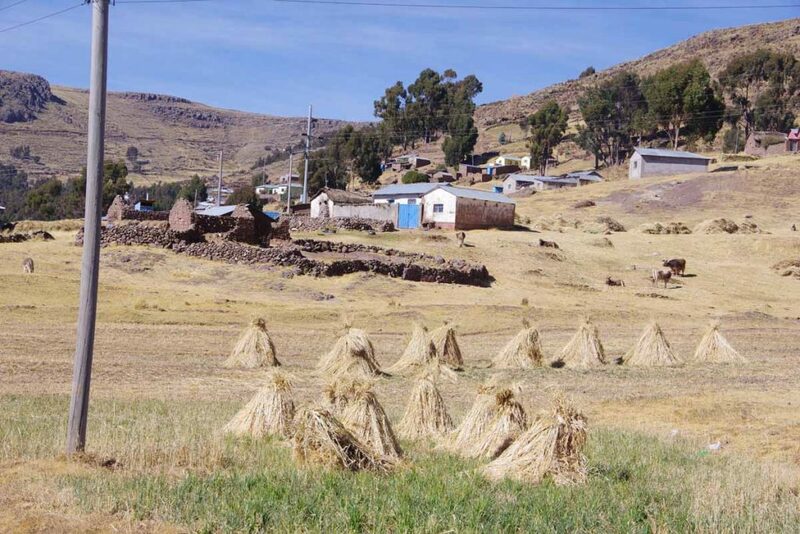 In any case, those extra 70 days will be caught up on way to Puno. An interesting blog for TDA trip can be found here. The TDA pace was to ride from Caucasia to Medellin (over the first set of hills) in three riding days. I took five days and a rest day. 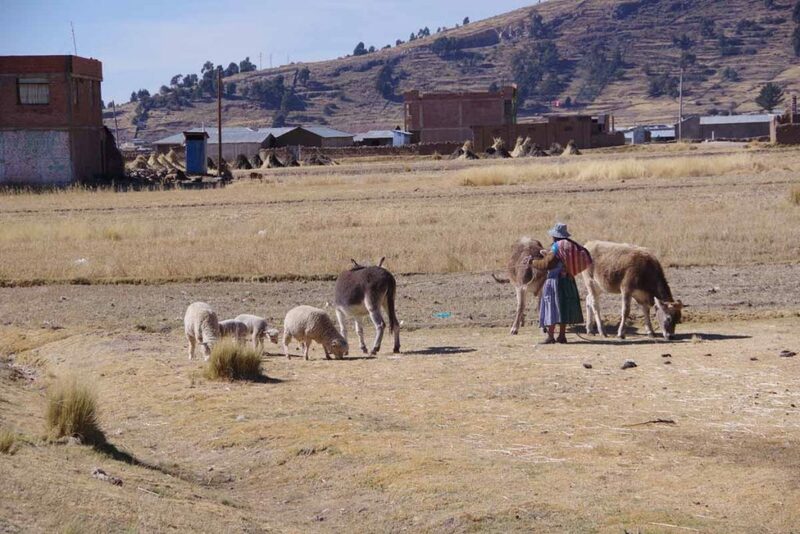 Made it to Puno. 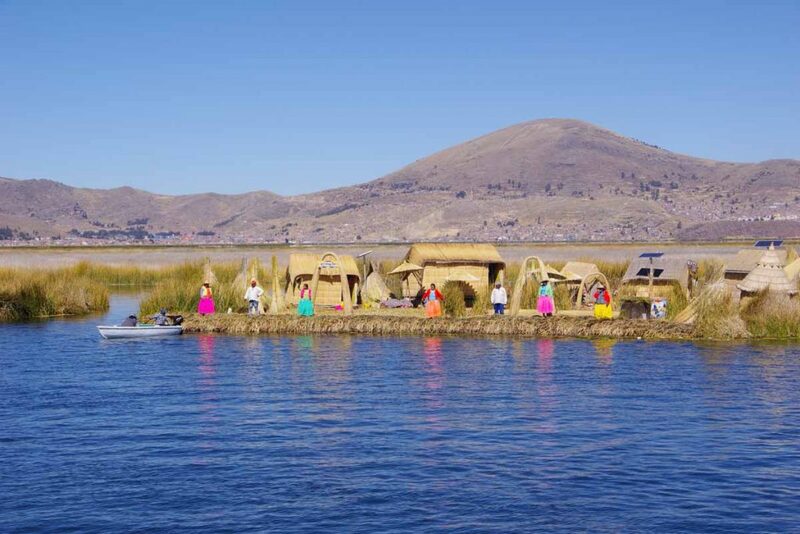 Found a hotel and booked a half-day trip to the floating islands tomorrow. Feels great to have a hot shower after five days on the road. Even had my laundry sent out. First time in South America since I normally wash the worst in the sink or shower. 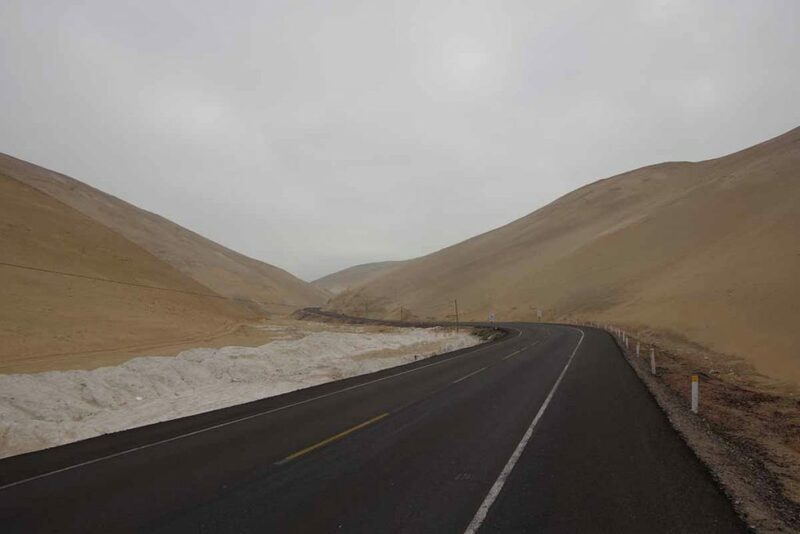 It wasn’t always graceful, but a nice ride up to and through the Altiplano. I find this area beautiful in its own way. I got doored today. All is fine, but it did delay my departure on an otherwise short day. Left after breakfast since I expected today to be a short day. Plan was either to go to Yura or have a good breakfast there and start part way up the hill. Traffic was reasonably heavy starting out. At four kilometers I was passing a parked car when unexpectedly the door swung open. My fault for riding too close to the cars and the motorists fault for not looking back before opening the door. 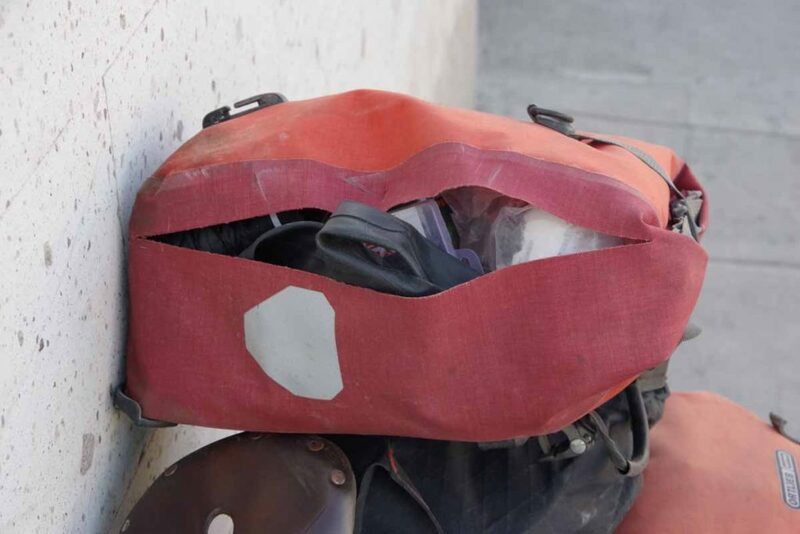 My pannier took the brunt of the impact. Not sure exactly how but bike ended on its side and I was mostly upright. No major scratches and the bike looked OK as well. The front brake pad had popped out and my bicycle bell was broken but otherwise, the bike looked fine. The pannier was split wide open. After assessing the situation, I decided to walk back to the bike shop and see what I might do about the pannier as well as put the brake pad back in. 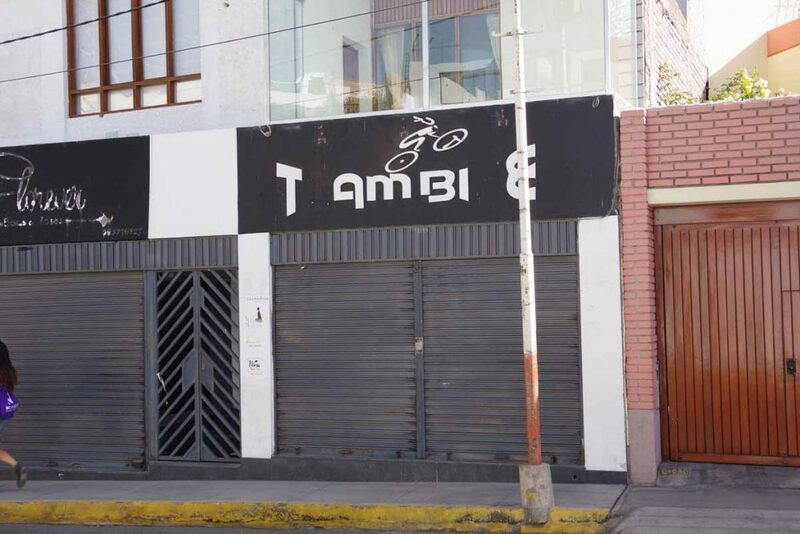 They didn’t have any panniers and said that wasn’t really something used in Arequipa. However, they did know a repair shop that fixed shoes, luggage, and other things and might be able to help. Found the repair shop and left my pannier. Found an internet café and two hours later, went back to have a fixed pannier. Packed the bike up and left for the second time. 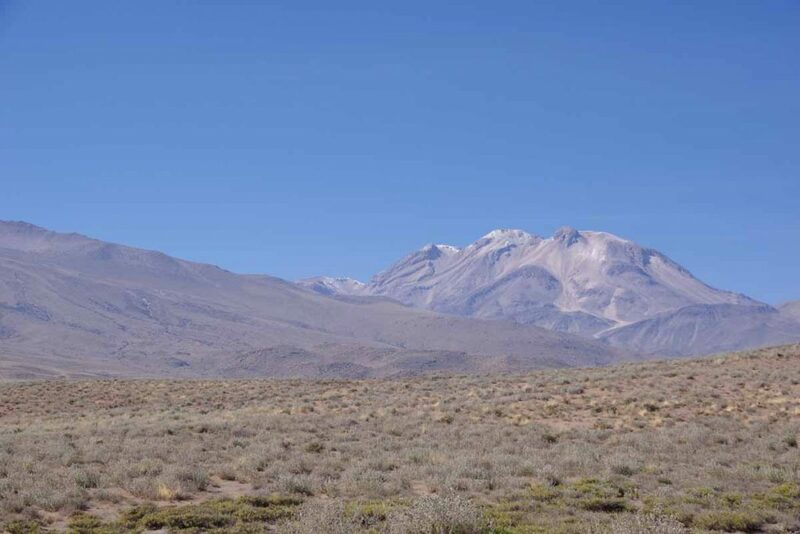 To the right was one of the volcanoes near Arequipa. I believe I’ll cycle around this one. This route also is roughly the route taken by the railroad. I figured that might help keep the climbing/descending in check. 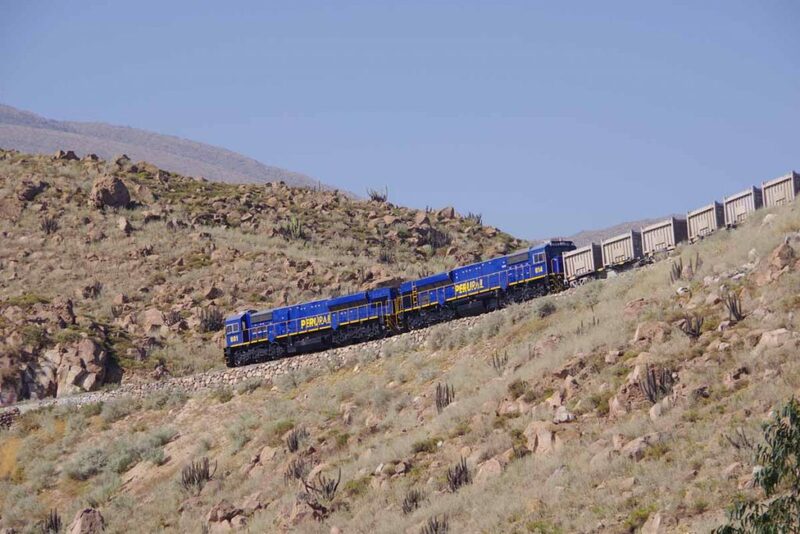 I even saw a train a while later. 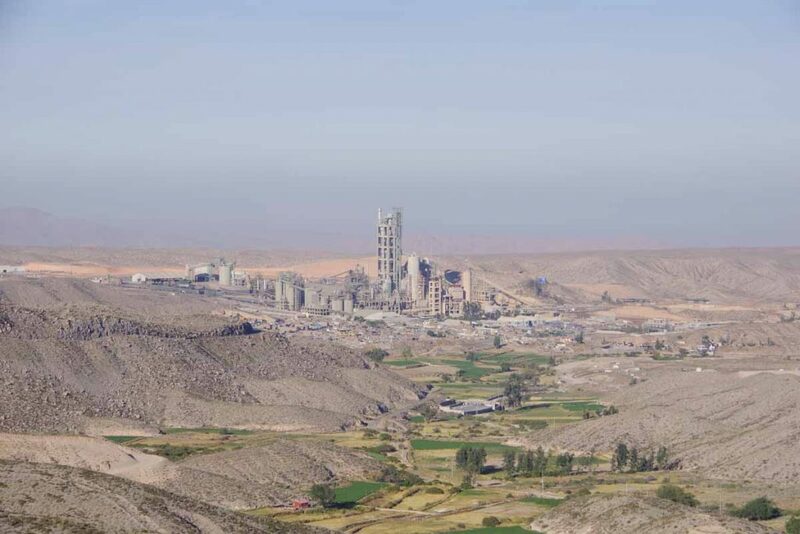 Made my way into Yura which seems to be dominated by a large cement plant. I went downhill a bit to where I knew there were both thermal baths and a hotel. I missed the hotel but found a nearby guest house that seemed as well, once I could convince them to let me put my bike in the garage. Otherwise still not a long day and gave me some time to relax and otherwise get ready for next day of climbing. As expected, no internet here at the guest house. 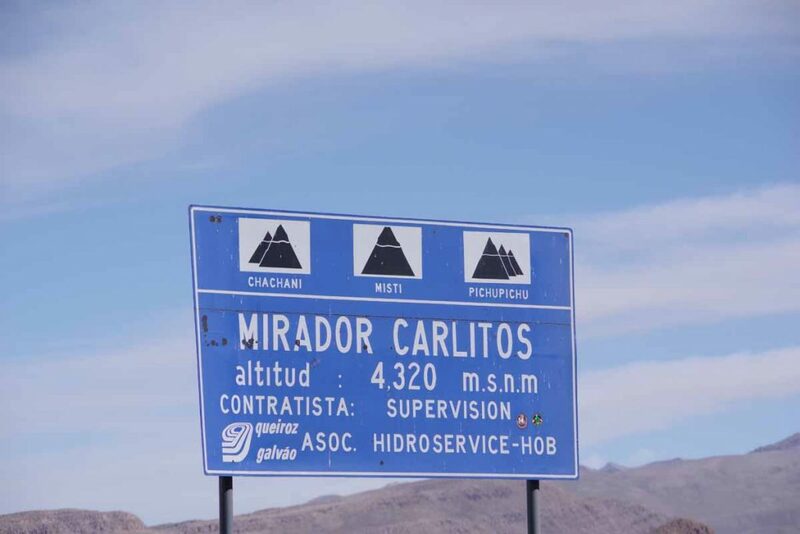 Today a climb up the hill to 4000m/13,200ft. I debated a bit on how to best adjust to the altitude. 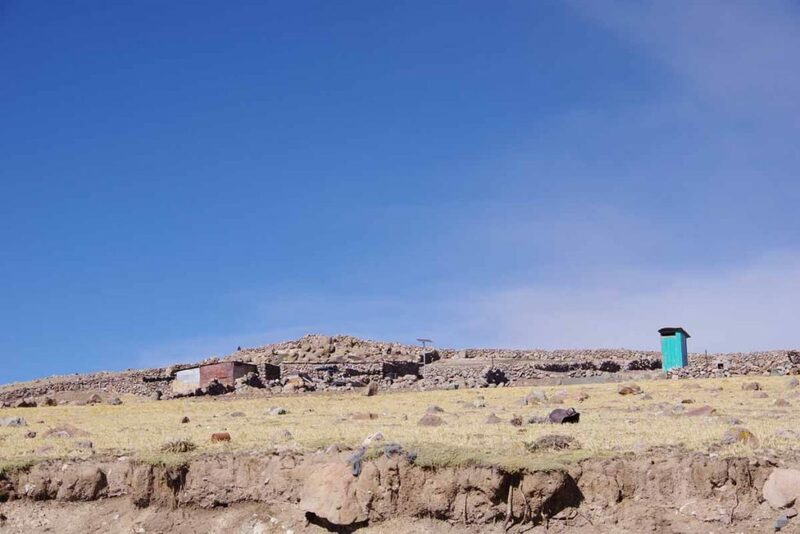 One guideline suggests “climb high/sleep low” but sleeping only 300m/1000ft higher each night. 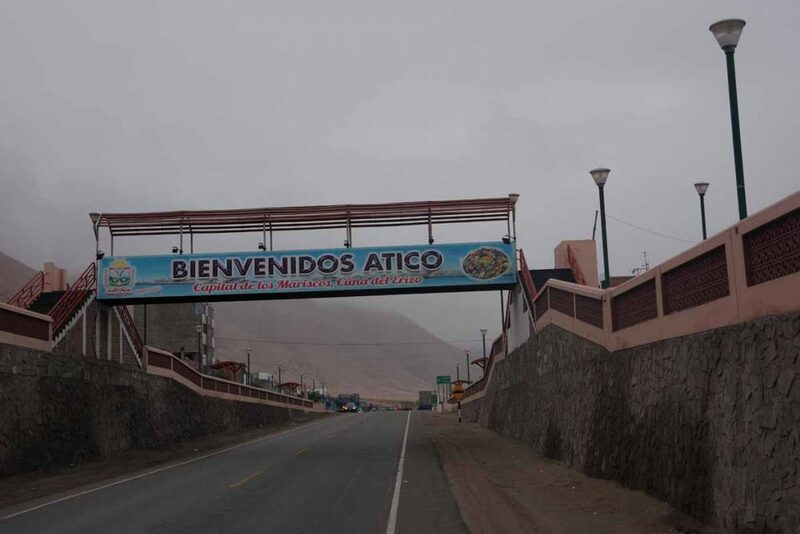 Imata was the highest point at 4450m and the toll booth at 4050m some 50 kilometers before was a good early point. However, should I go to the toll booth directly or camp once before. 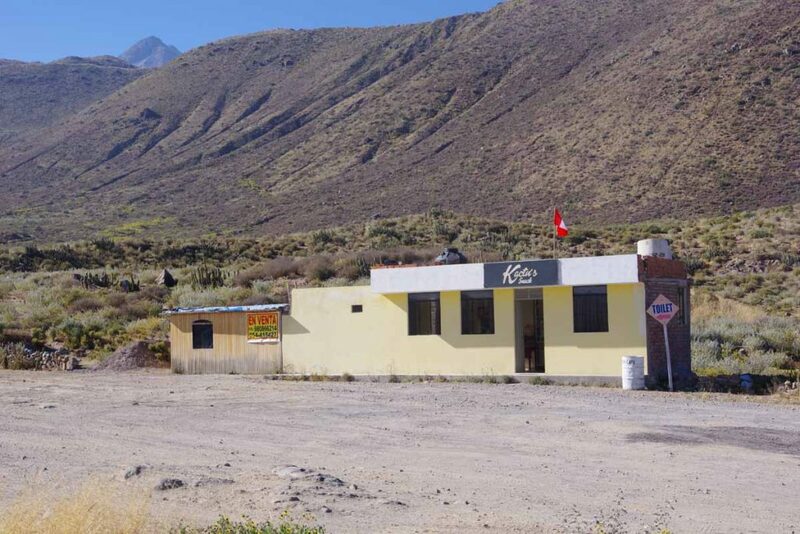 I wasn’t sure if 4050m was too high to start but an advantage of going to the toll booth is there would be roadside restaurants in sort of truck-stop fashion. I decided to go up the hill and see where I ended. 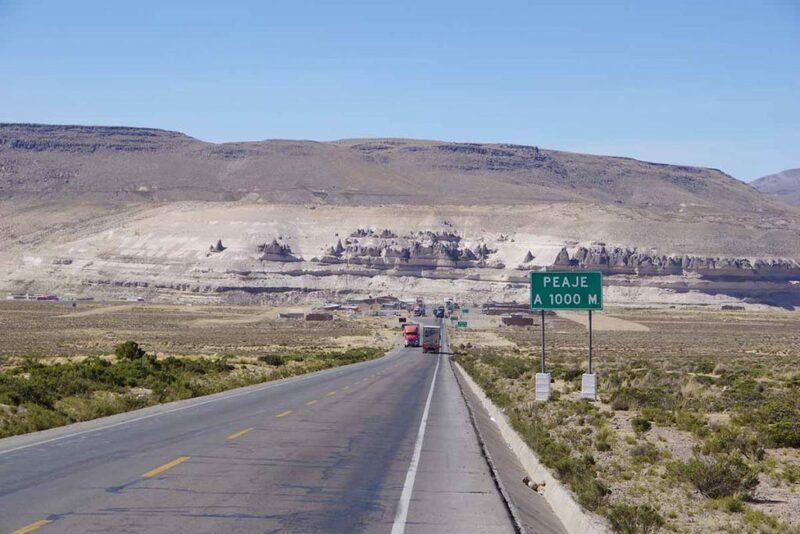 In hindsight, made it all the way to the toll booth and other than being more easily winded climbing 7% hills, seems like that worked OK for altitude. Left Yura hostal around 7 am. It was 5C (40F) and likely as warm as I’ll have at that time of day for a while. 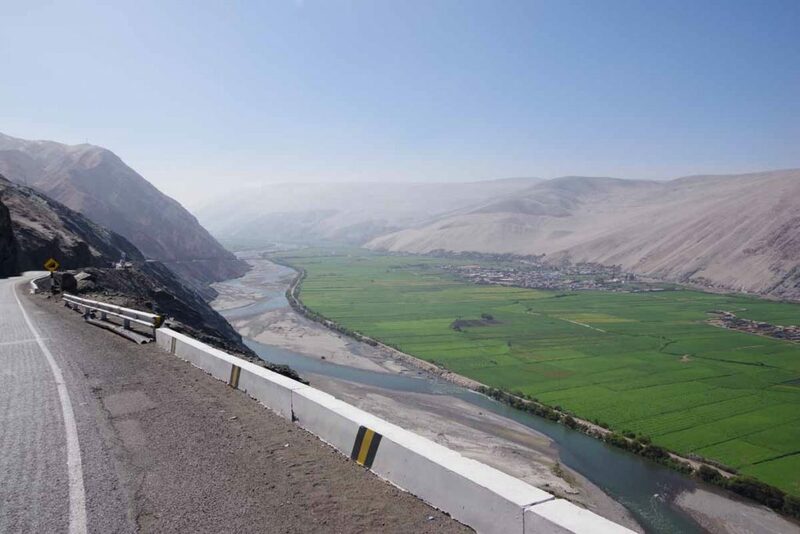 Two kilometers brought me back to Yura and the highway as well as the cement plant. From here the next 41 kilometers were a steady climb. It got as steep as 7% but more typically in the 3-4% range with one or two spots of mostly flat for a kilometer or two. The sun was out and almost no clouds in the sky. There was a little store at 15km. 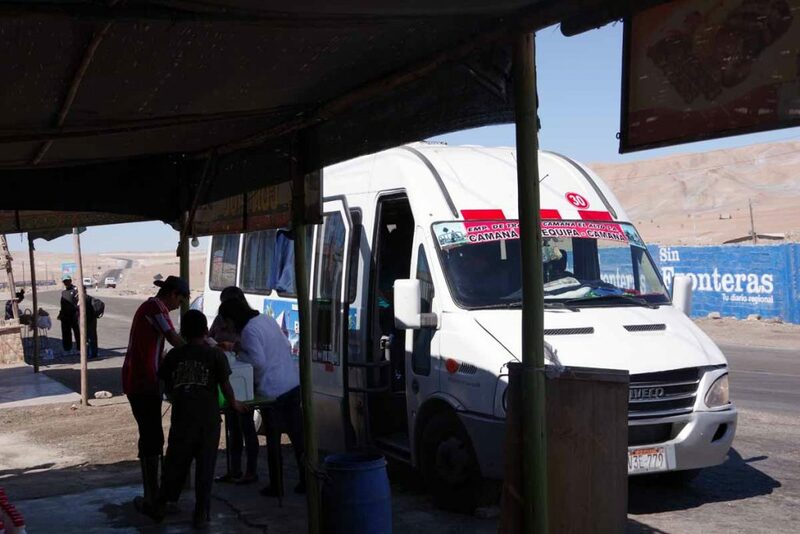 In addition to snacks, it also sold medicine based on coca for altitude sickness. 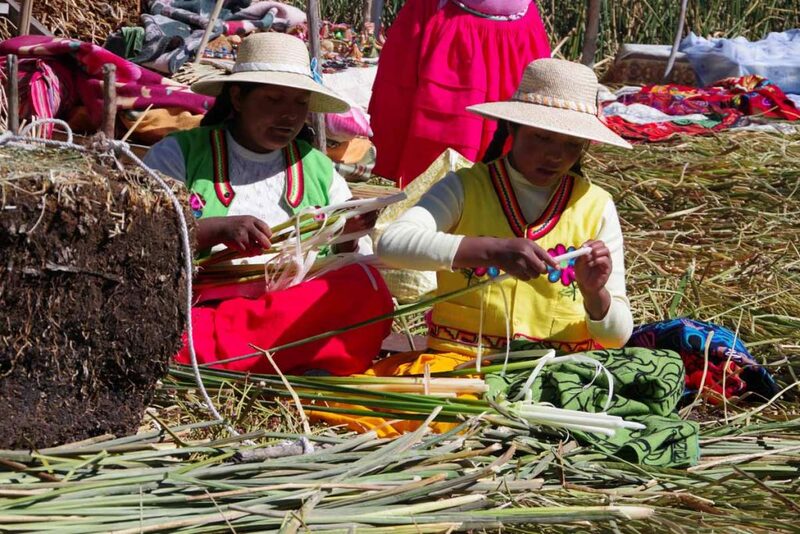 I already had some I had bought in Arequipa. 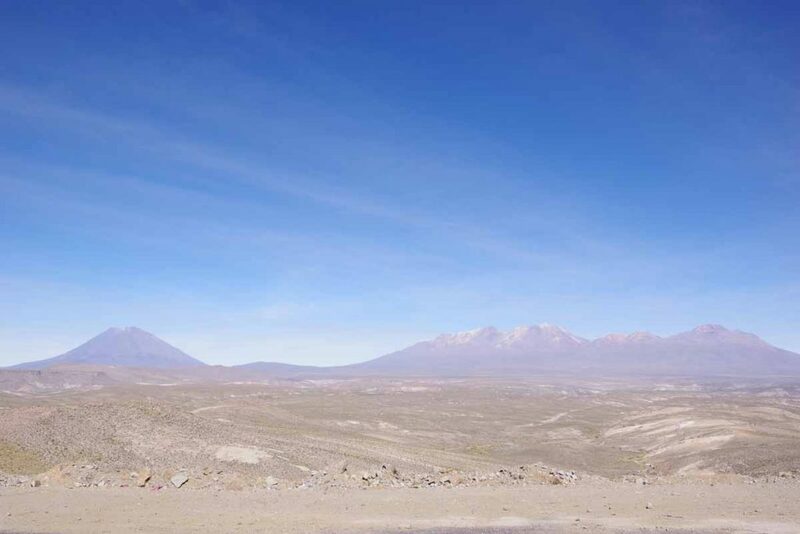 One of the volcanoes. 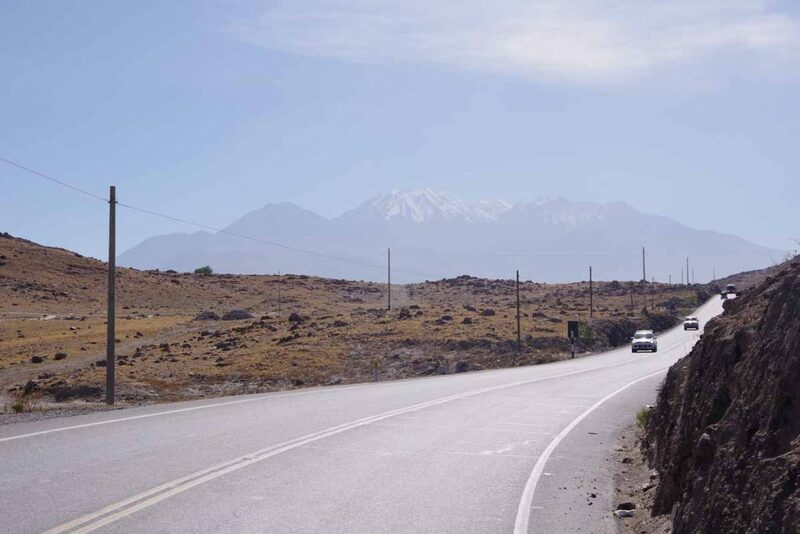 The main road went mostly around the volcano from the point I left Arequipa until the end of today. An example of the gradual climbing. After a while, the area was designated as a park. 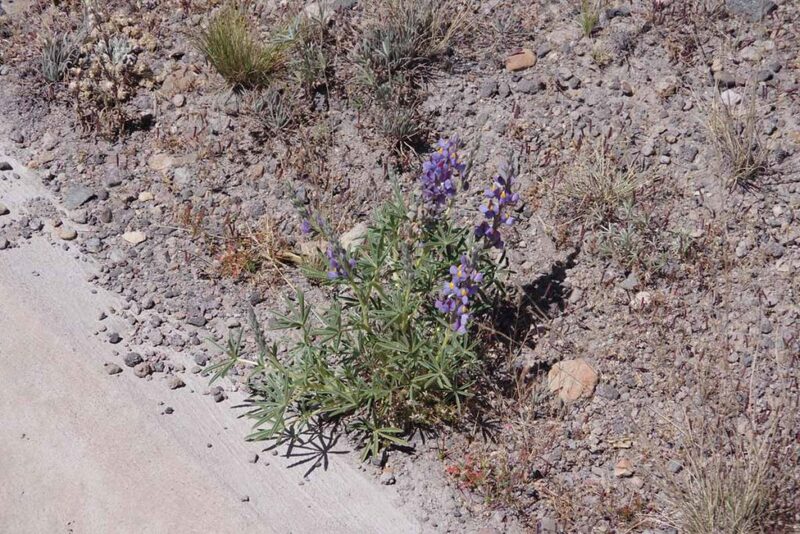 A lupine along the way. 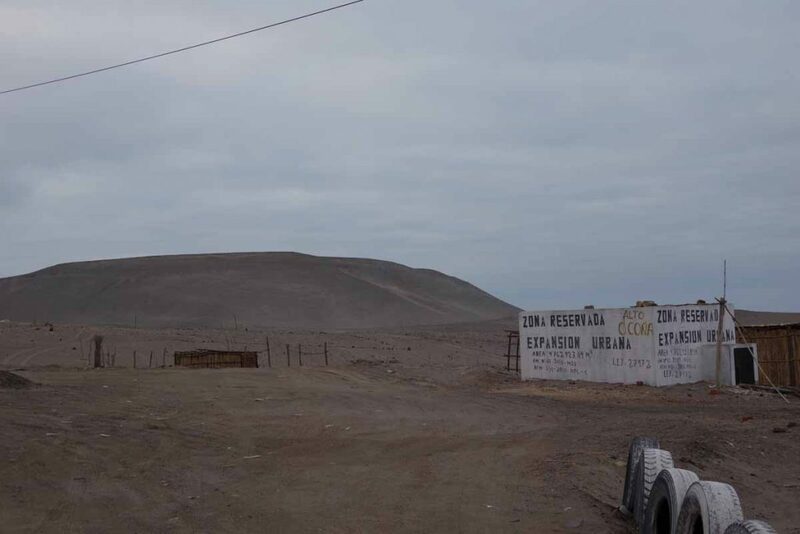 Once I reached 41km, I was mostly on the top with flatter roads as well as signs for vicuna. 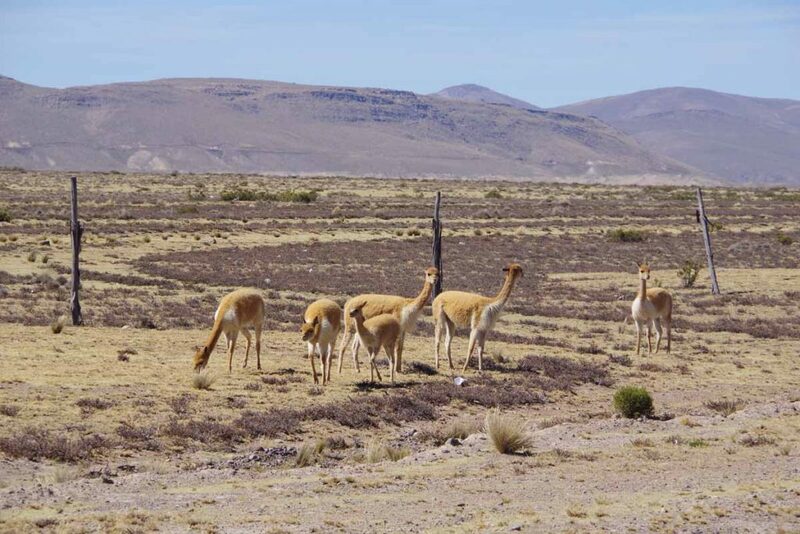 At their assigned spots near the signs, I saw vicuna. 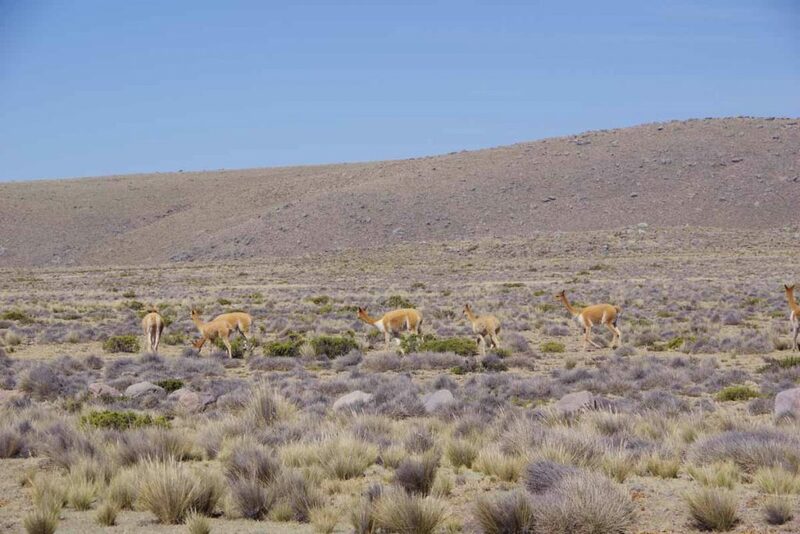 More vicuna. They were not as easily spooked as antelope on the great plains. Welcome sight to see the toll booth coming up. I stopped and got lunch here. I asked at the police station if they might have extra space/bed (other bloggers had been successful) but nope, so found a spot close by for my tent. Last night camping was a bit of a mess, though also comedic in hindsight. 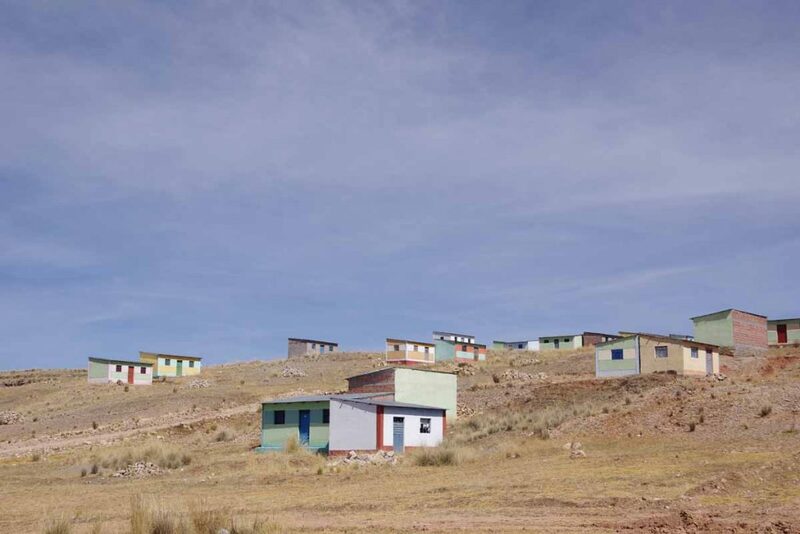 When camping near small settlements, there are often two choices: one is to try to hide and camp someplace out of the way, another is to realize locals will probably notice so camp in more public spot. I opted for the latter though perhaps overly so. 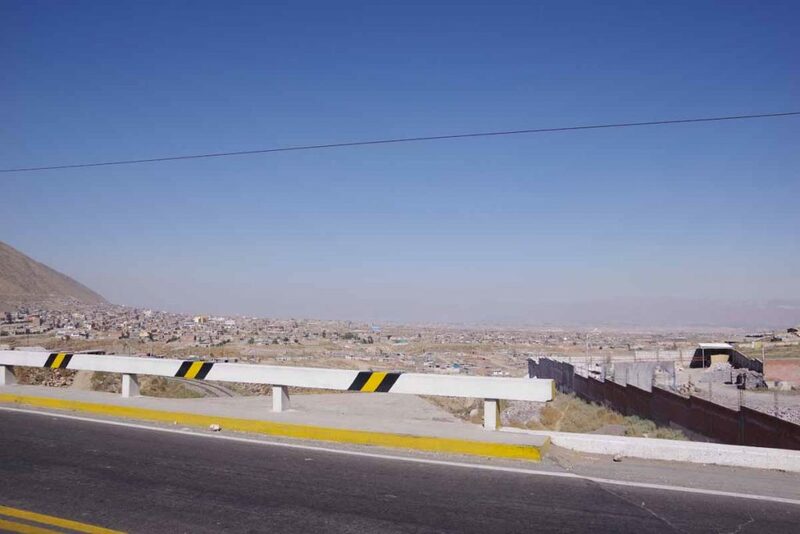 Not far from the toll booth there was also a control point where they were controlling traffic headed to Arequipa. For produce or something else, I’m not quite sure. 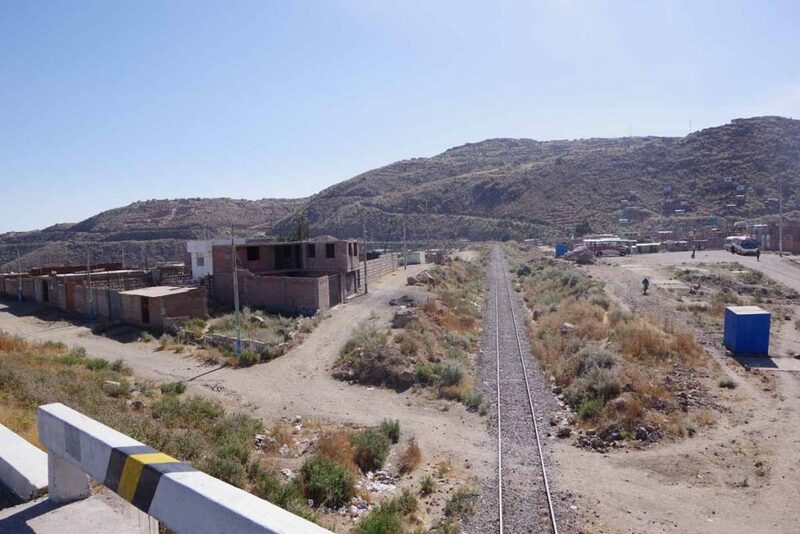 There were a few buildings here, though it was getting to edge of town. One looked fenced off and otherwise shut down and I asked the neighbors if I might camp in front of that stall. They said it wasn’t theirs but otherwise seemed OK. I set up my tent with some attention from a few children in the area but otherwise nobody paid attention. I set everything up inside and was in the tent until around sunset. Most of the businesses were quickly closing down but I managed to find a bite to eat. It was already getting cold. It got dark quickly and not much later one could see a wonderful array of stars including milky way. Overnight it got to around -5C. My double sleeping bag worked well, though every three hours or so, it would start to feel cold from underneath as the thermarest pad lost just enough air to not insulate as well. I’d roll off and blow it up. I was also out once or twice to take care of business. The combination meant I didn’t really get an uninterrupted sleep. At 2am, suddenly lights shining on the tent and car horns honking. Not sure what was going on but I got out of the tent. Owners of the business I had camped in front had arrived! They didn’t seem to car too much about me being there, but it was a bit of a drama to sort everything out. After that, back to napping in short spurts. As best I could tell, it wasn’t so much altitude as traffic noise and cold that kept waking up. Around 6:15am the sun came up. It was cold, though with sun shining seemed to start warming fairly rapidly. I was able to get a bowl of warm soup and pack everything up and get on the road a little past 8am. My odometer still read -2C (29F) but it warmed not long after on the road. Photo above is the tent in the morning when I’ve already taken most stuff out and am getting ready to pack up. 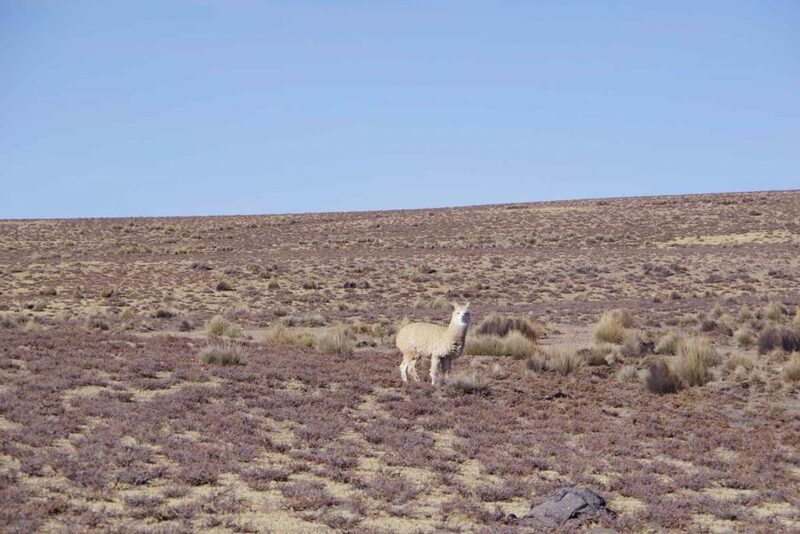 More of these vicunas today. 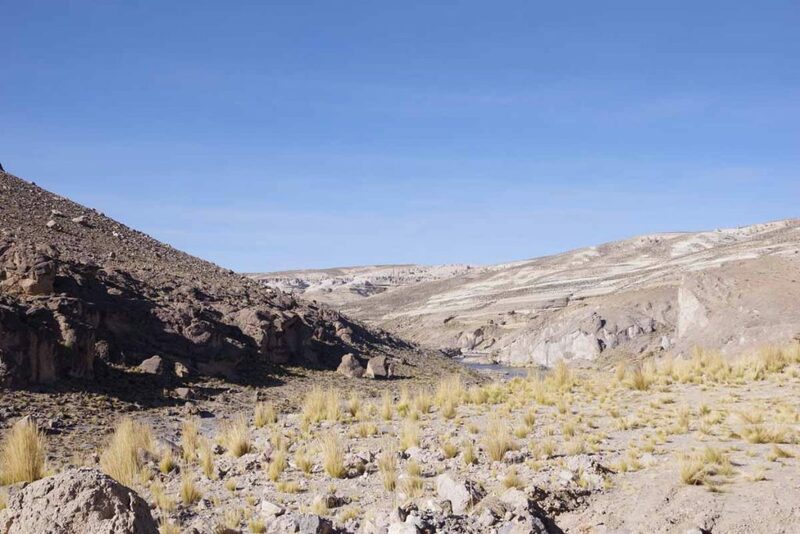 At 6.5 kilometers I came across this canyon and low point for the day, ~3900m/12900 ft. From here there was a reasonably steady climb. Crossed this valley and looked like there was mix of ice and some water. My water bottles and camelbak both froze last night, but not completely solid. Up on the plain there was a great view back of a few of the volcanoes. 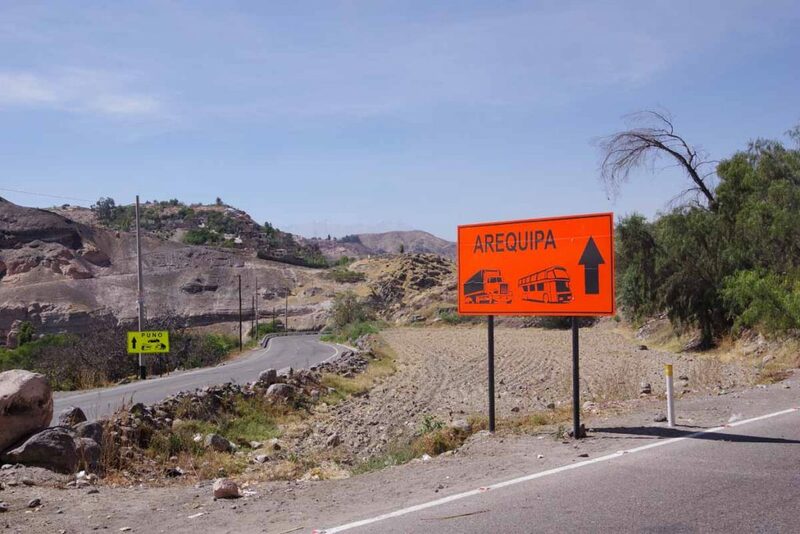 Arequipa is behind them on the other side. The viewpoint was at 4320m/14250ft, as high as Longs Peak in Colorado and still more to climb. I got up to somewhere around 14,600ft today. After that it leveled out and became more open as I was riding to largest village in the area, Imata. Nice to reach outskirts of the village. I was surprised to find a hostal here. Immediately stopped and asked for a room. Nice follow up from my camping debacle from last night. Also since I am ~400m higher than last night it may get colder. Surprisingly there was also a hostal across the street, though it looked closed up. 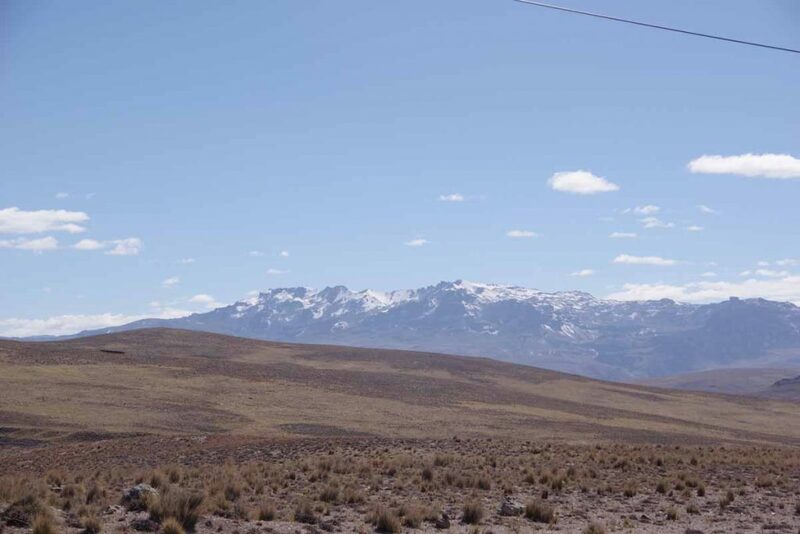 Over the top (4528m/14856ft) today and back closer to 4000m. My body seemed to adjust ok to being at 14,600ft though I noticed a slight headache that would come and go when I slept. I also find myself a little more easily winded climbing a 7% hill than I would lower down. 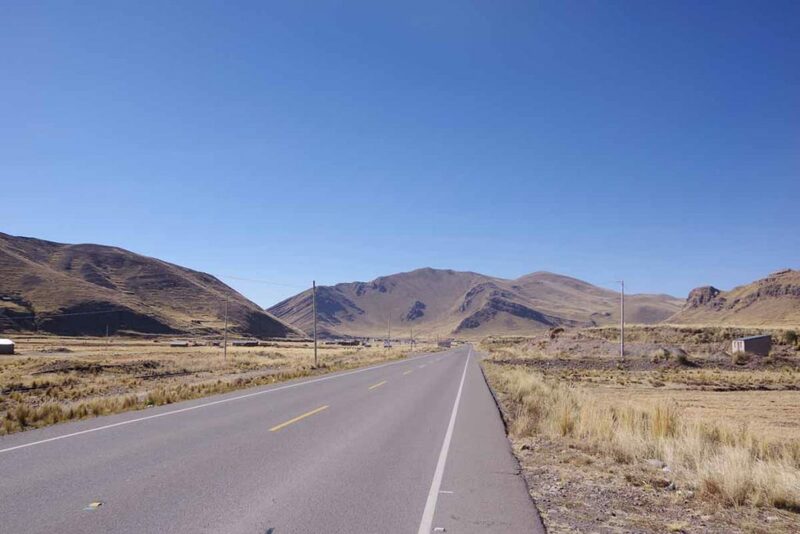 However as a whole, the strategy of spending that first night at 4000m and second one at 4400m worked ok.
Today was a pretty ride with a few hills but more downhill than uphill. I was on the road at 8am just a little before temperatures got above freezing. Last night the hostal listed hot water on the sign, but there wasn’t water at all. Instead, a toilet block out back where one would throw in a bucket of water. In the morning, the barrel for water had a good layer of ice on it. 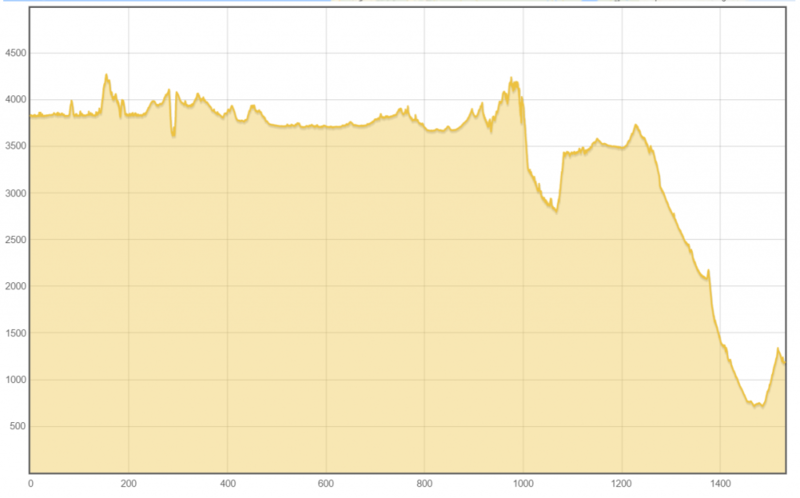 The first 10km were almost flat but with a slight crosswind. I then came along the valley shown in photo above. There were some gentle hills here including one that had this memorial posted. Looks like it happened almost a year ago. 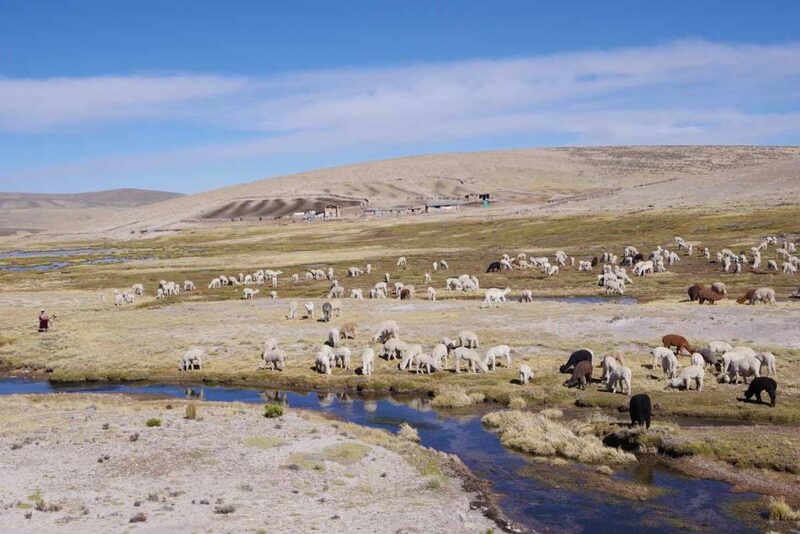 Several spots with herders bringing their vicuna herds out to the fields. These rocky buildings looked a bit like their homes. 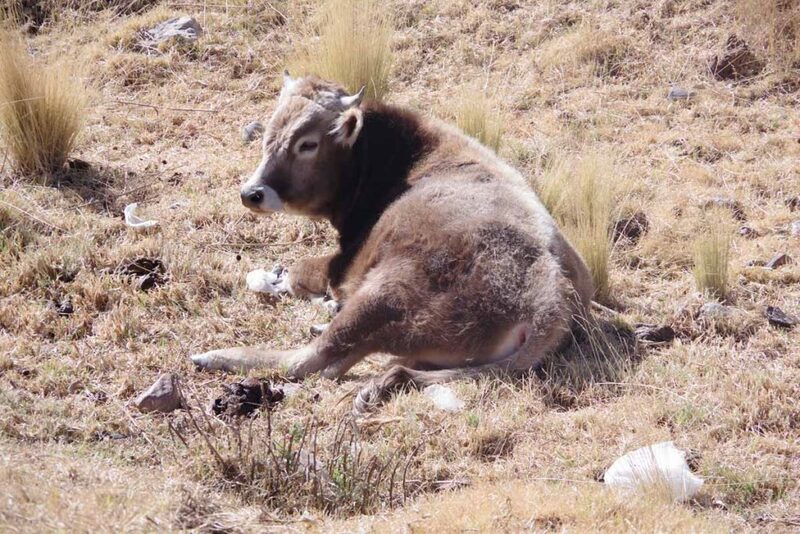 It would be a cold and tough life up here on the altiplano. After a few false starts, I came past the high point, 4528m. The longest climbs for the day were actually after this sign. Several lakes. This one had flamingos though it is tough to see from this far away. The first gradual hill was on the other side and over the ridge. 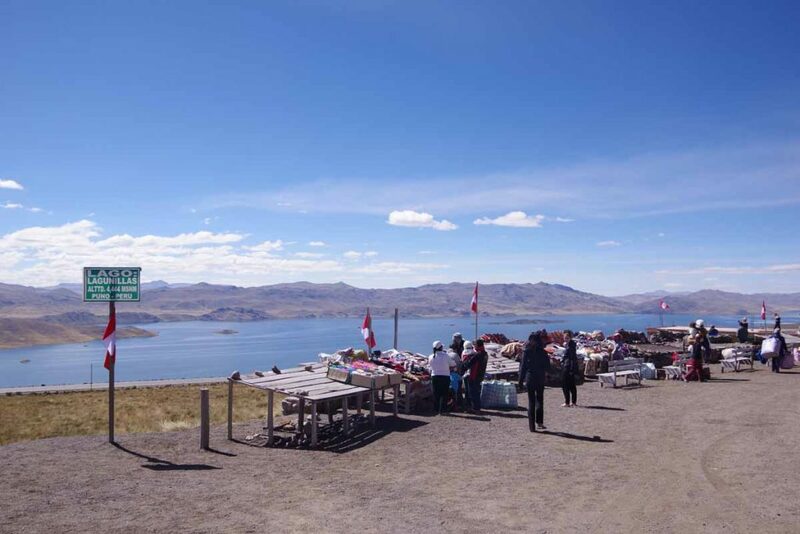 As I came past the top, I came to this stop with restrooms and tourist items for sale. A large bus had just stopped so they had good business. The lake was behind. I descended the road on the left down to the lake. 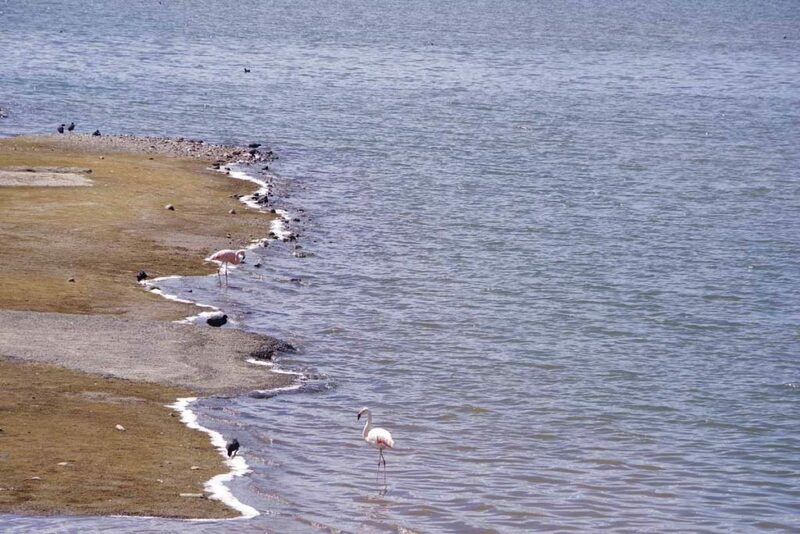 There were also flamingos here. The longer climb for the day was on other side. It wasn’t particularly long, but had a few 7% sections that definitely tired me out. On the other side, the last 20km for the day were mostly downhill following a valley. Great views to the side. This brought me to Santa Lucia. Only a few roadside businesses but I found the hostal. They said they weren’t open but directly me to another place in town. It took some discussion but found a spot for my bike and place for me inside. I walked out and found what looked like an OK place to eat. Meat was extremely tough and had some oversized corn chunks. Wasn’t the best food I’ve had but hopefully will fuel me on the road ahead. A longer ride but almost completely flat and hence quicker average speed than I have ridden in a while. It was warmer last night in Santa Lucia than the previous two nights. I left around 8am and in hindsight, could have left even earlier. The hostal was busy last night, I believe with construction workers. The route today started by following a low valley on a very slight downhill. 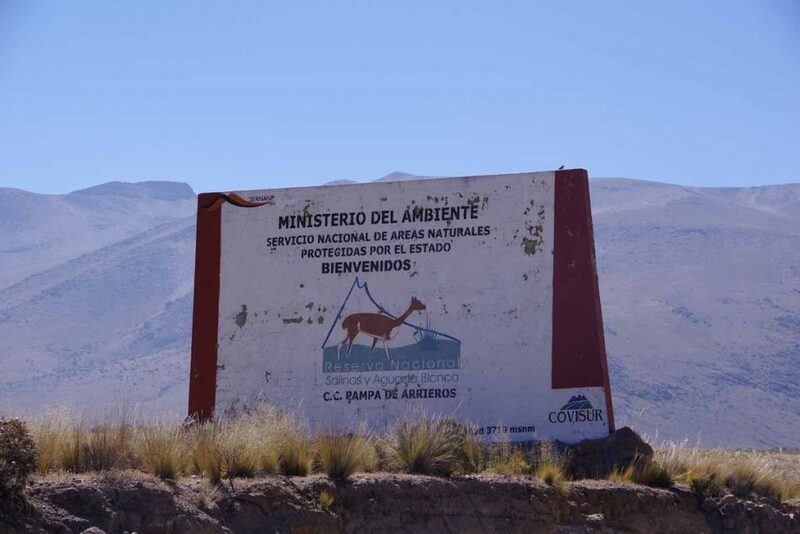 I’ve been seeing more cattle, pigs and sheep in addition to vicuna. Rather than fences, they will frequently tie them to stakes on the ground. Small church on the way. 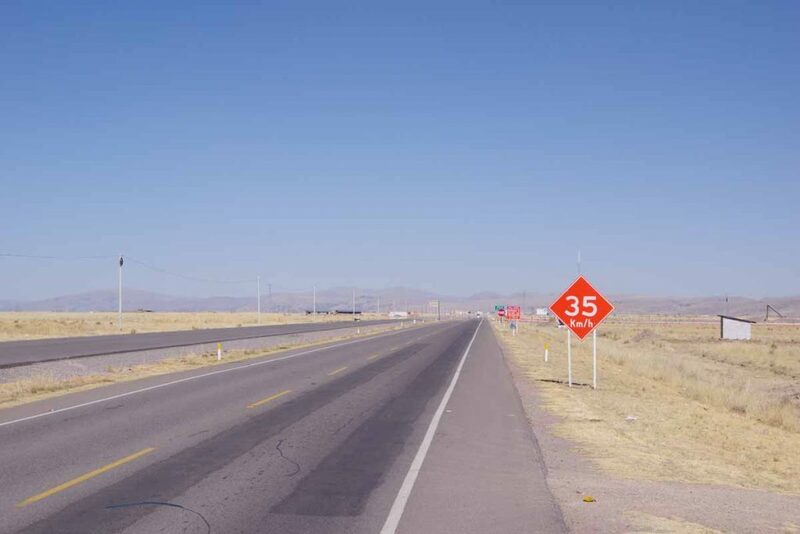 At 34 kilometer mark, the small town had closed the main highway and directed all traffic around the town on this rather bumpy road. 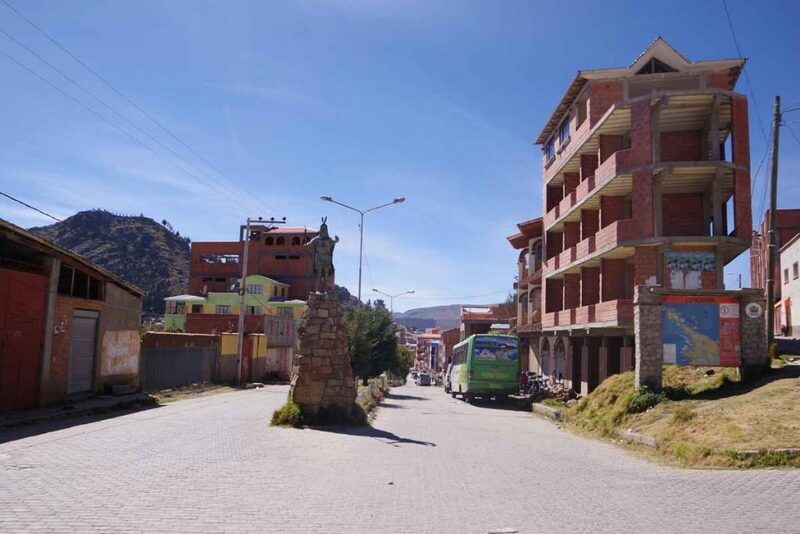 I had barely passed the town when I came to the short cut road to Puno. 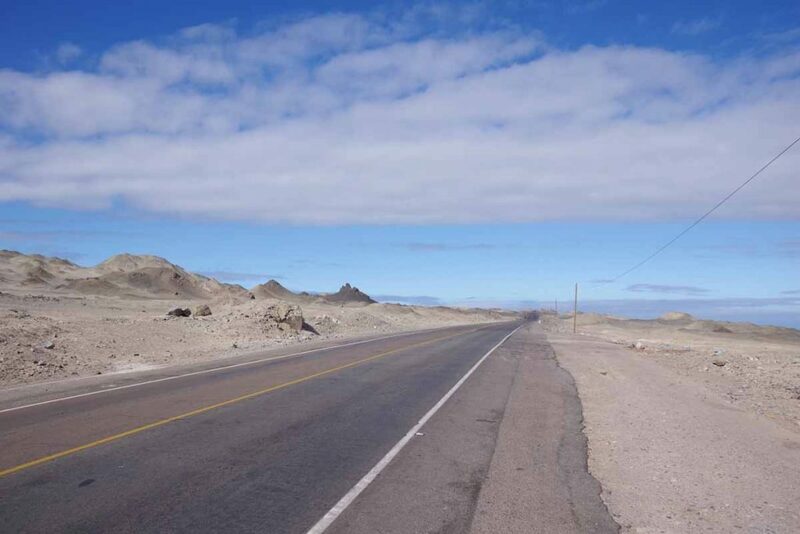 The paved route was 52 kilometers via Julianca and the short cut was only 35 kilometers. It however turned out to start as gravel. I cycled up this road for a kilometer but it didn’t get better and so decided I would go back and take the faster route on pavement. Julianca started with a nice wide street. 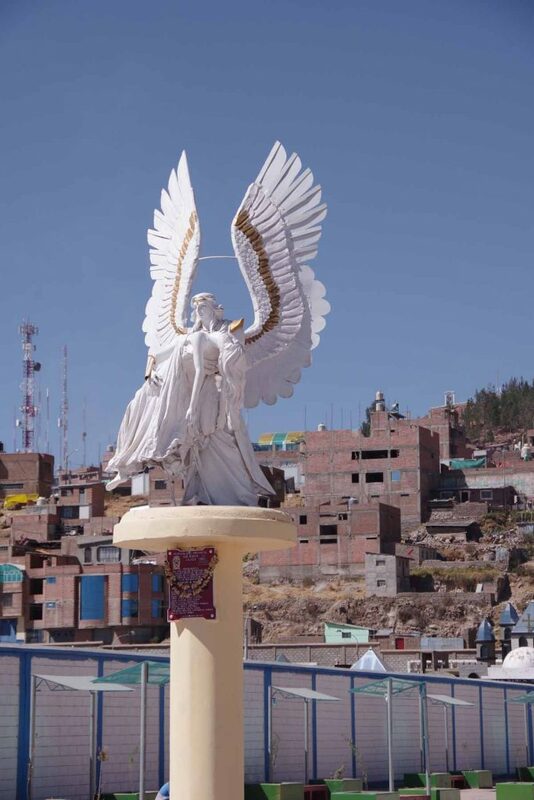 This statue was on the way. Once I got to the middle of town, everything was completely stopped up. As best I could tell, there was some sort of protest or march being organized. I got off the bike and walked it as a pedestrian past the largest jams. After that I came to sections like this where it looked like banners were being arranged on the street and then the marchers might go find their banner. 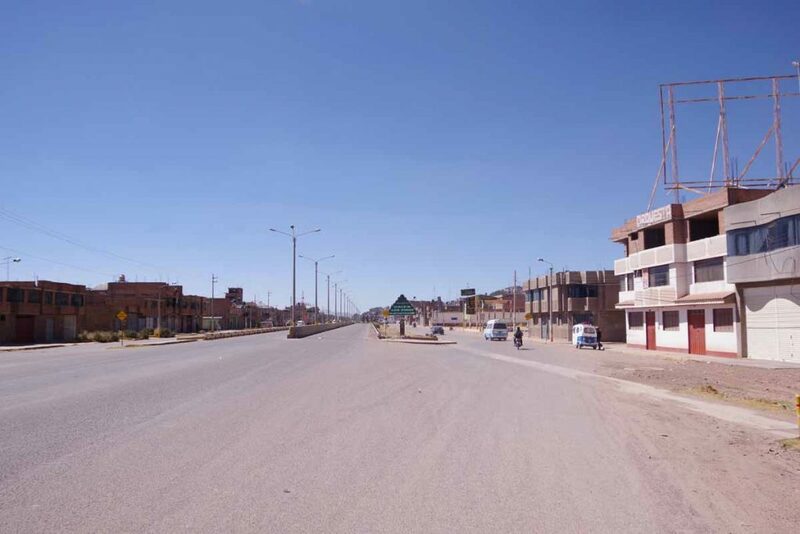 Julianca was a reasonably large town, and after getting through the chaos in the middle I was back on the main road. 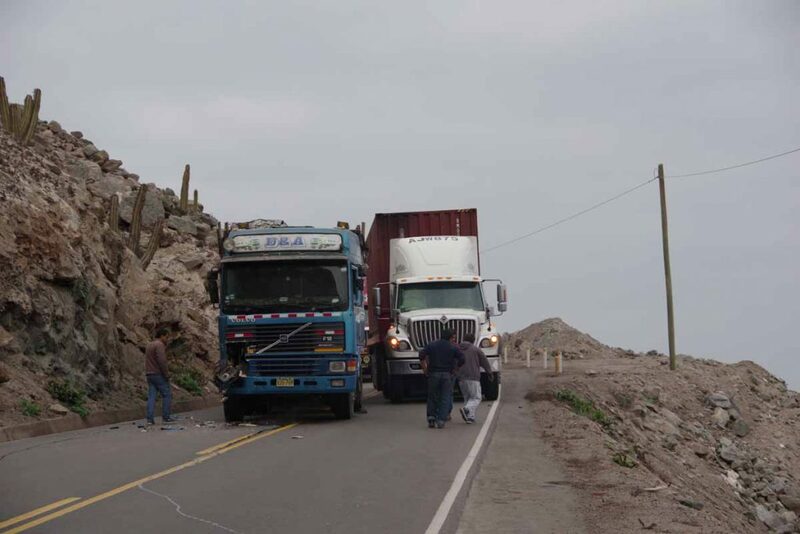 This route now joined the road from Cusco and had more traffic. 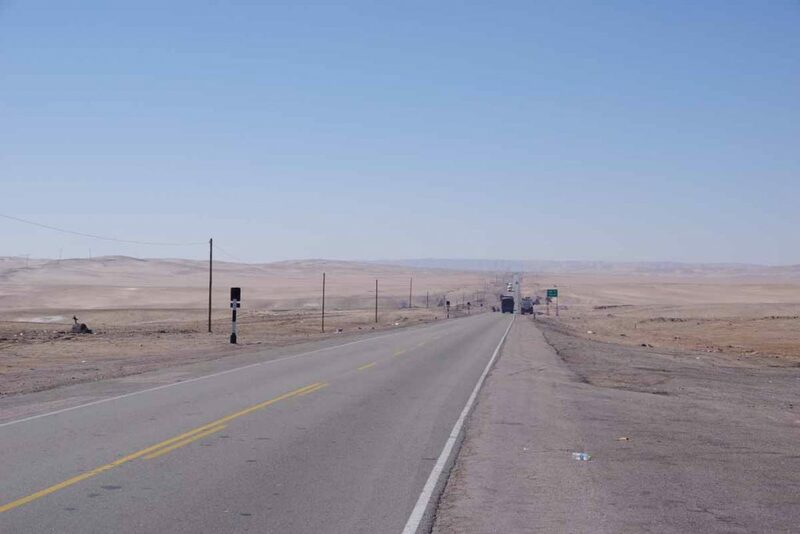 However, still very flat. The left lanes in this photo are under construction and not yet open to traffic. 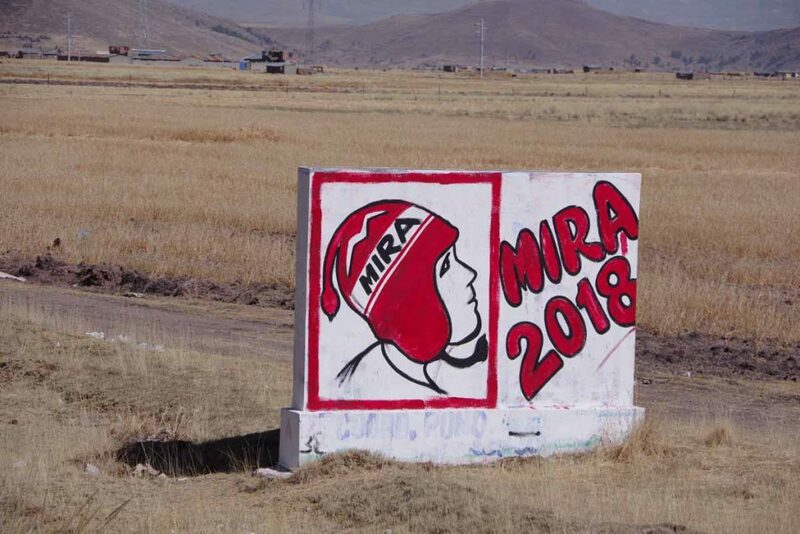 Mira must be a local candidate for 2018 since I notice the hat for the cold. Toll booth and first once since Colombia that explictly mentions bicycles. This was the other end of the short cut road. It was paved here. 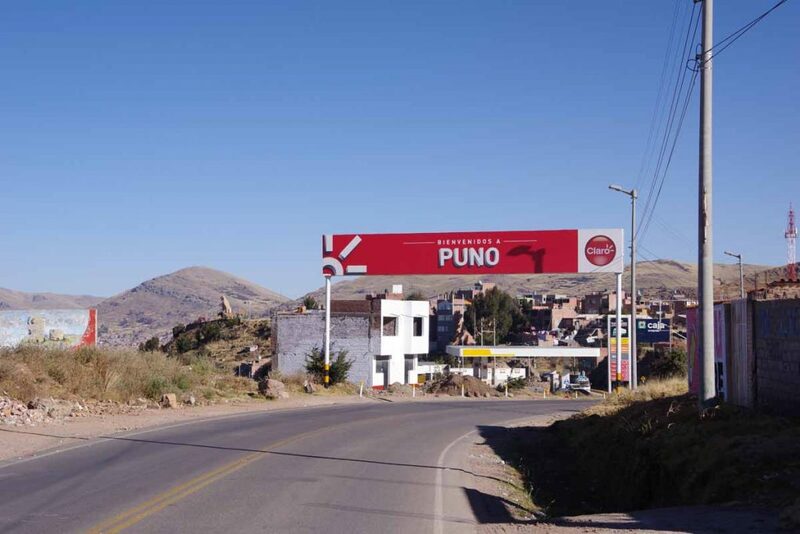 Up over the largest hill for the day and on the other side was a welcome for Puno. 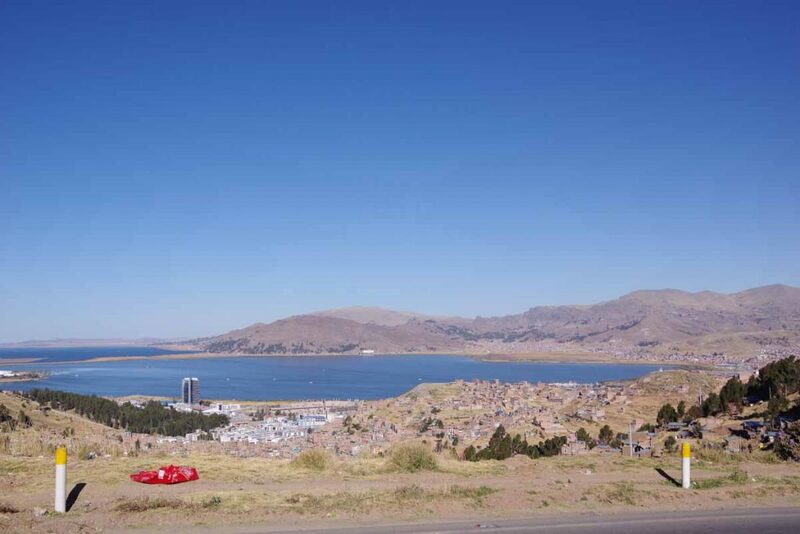 Down looking at Puno as I descend into the town. Found a nice hotel close to downtown. Got a shower, sent my laundry, updated this blog. 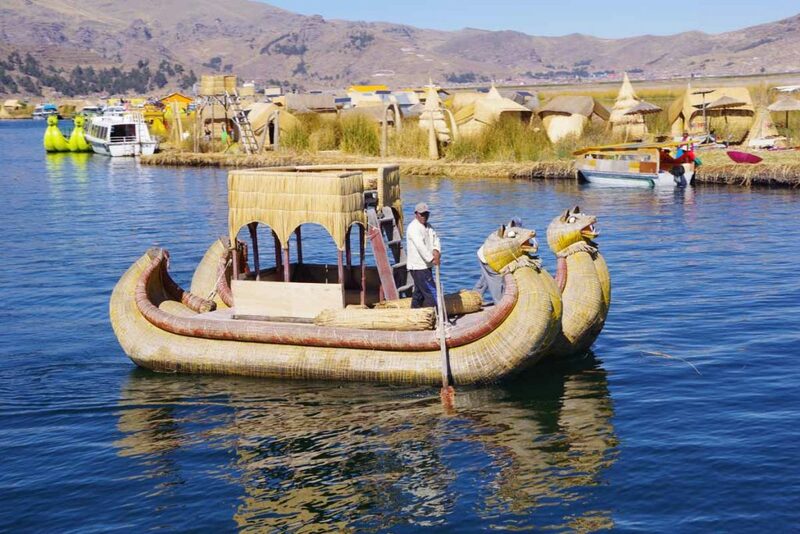 I haven’t looked around further yet, but tomorrow is a half day tour of the floating islands and then chance to look around town. Also time to plot out the next days. 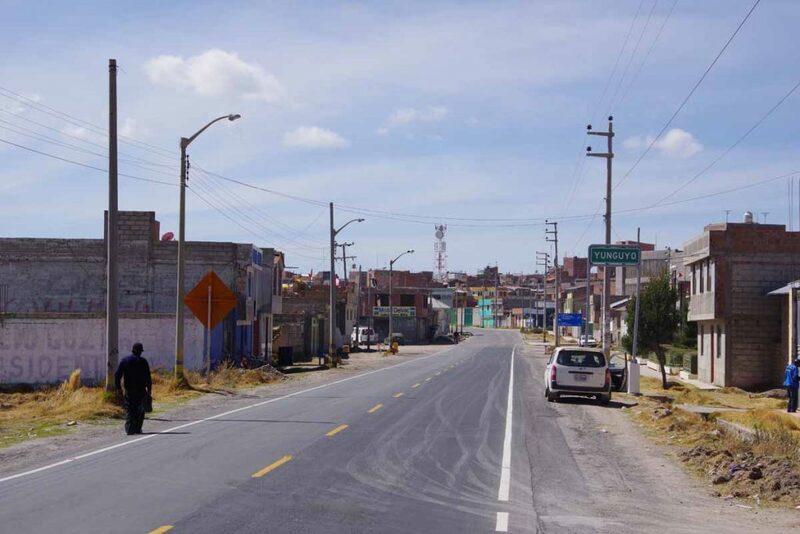 I expect from here to La Paz will have more occasional towns. 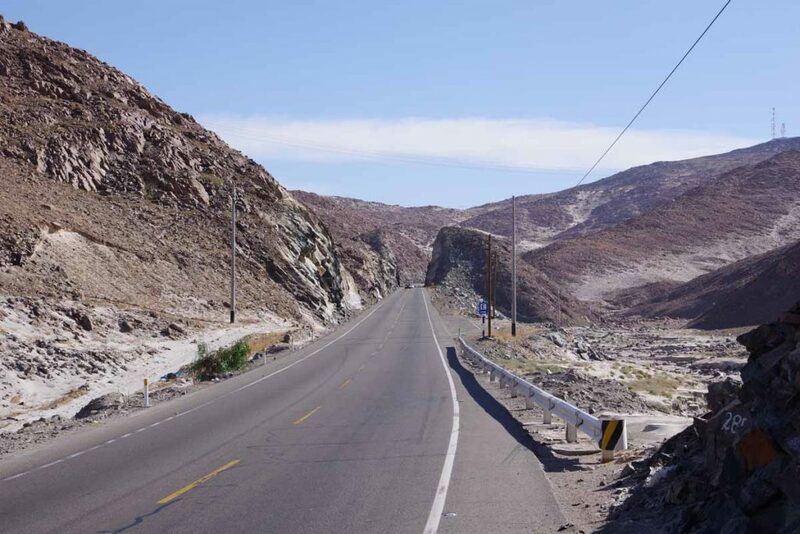 After that in Bolivia will be some larger gaps, even than this five day section I just finished. 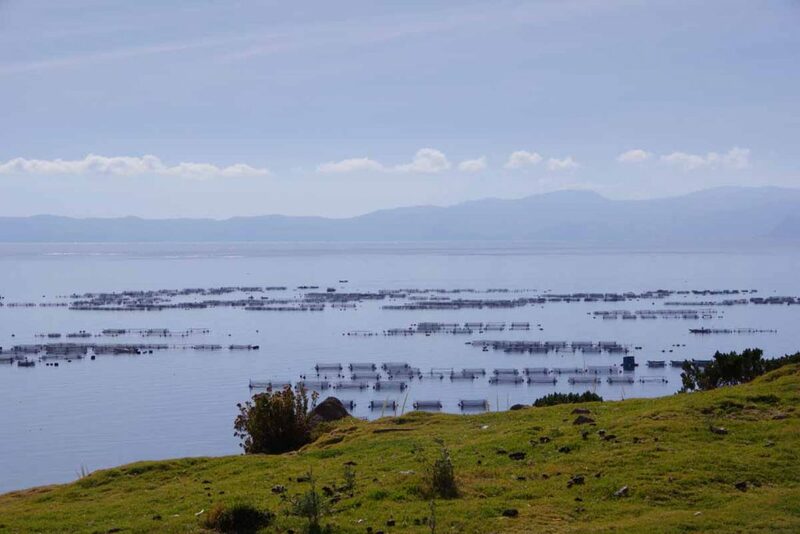 Nice to be in Puno. 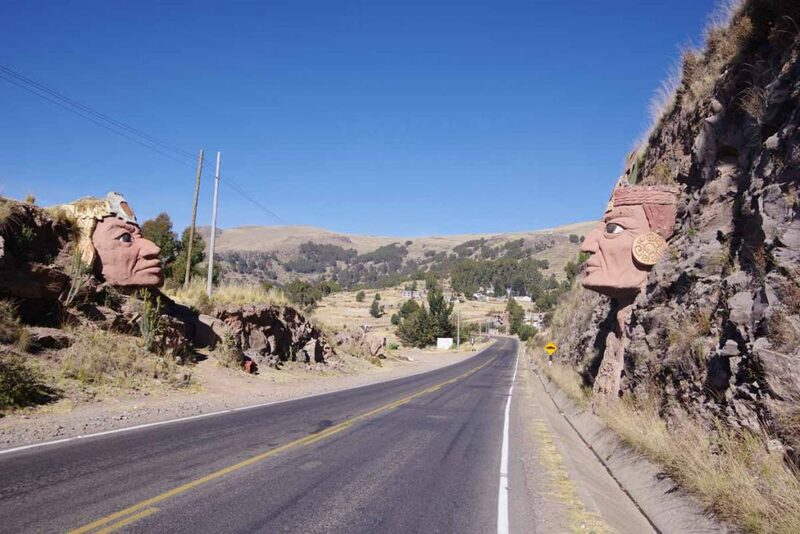 I have been looking at the elevation profile on way to Puno as well as likely places to stop along the way. 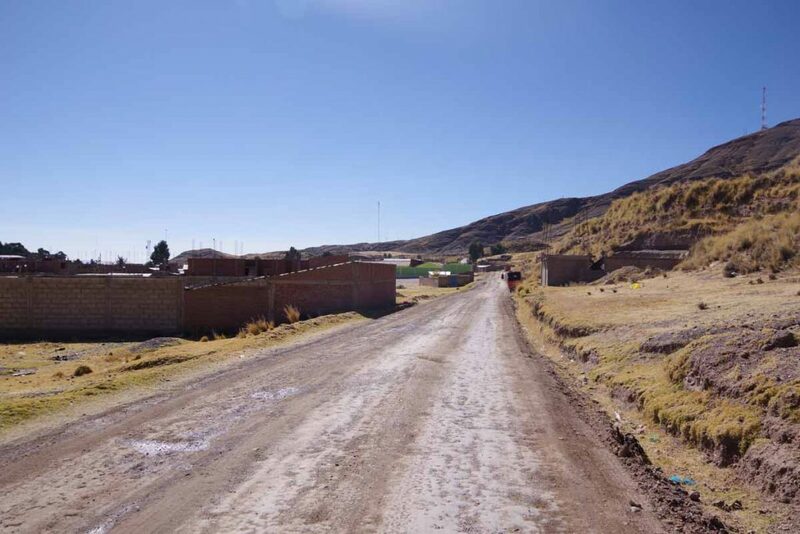 Around 25 kilometers down the road is Yura, elevation 2590m/8500ft. This is last place with a hotel for a while. 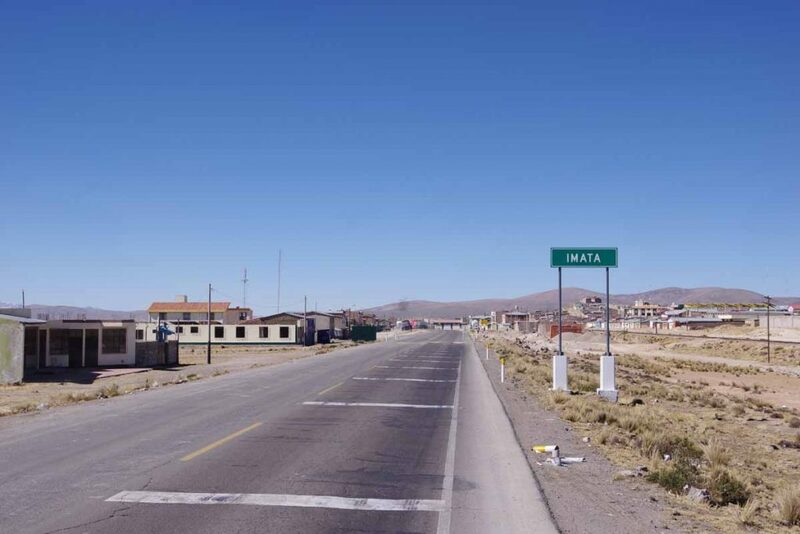 Around 130 kilometers is Imata, next medium sized town at elevation 4451m/14,603ft. Weather forecasts for Imata seem to have high temperatures around 15C (59F) and lows around -5C (23F) with it warming rapidly after the sun comes up. 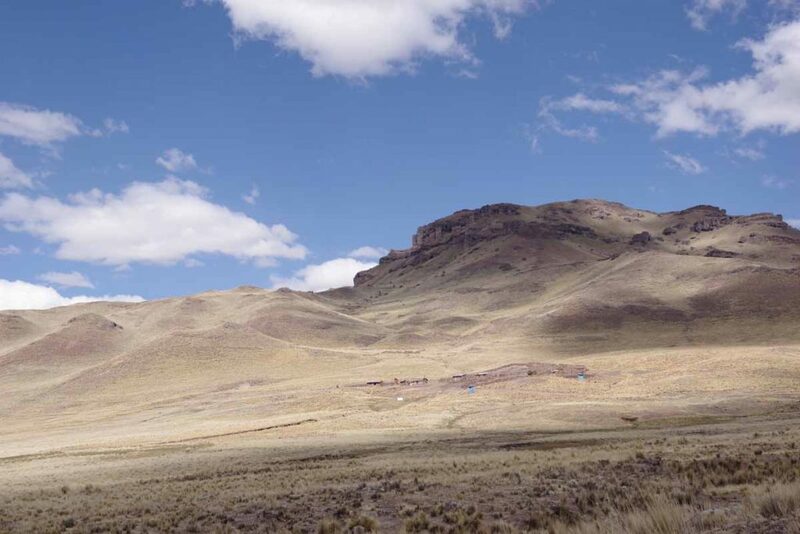 It looks like there is also a village around the 80-kilometer mark at that little dip below 4000m/13,100ft on the elevation profile. Following is a summary of key elevations along the route. 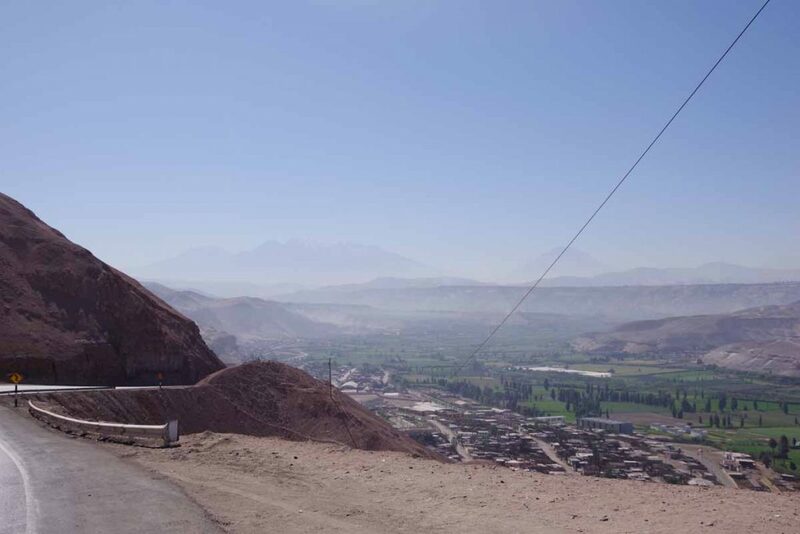 It is not *that* much more than I’ve been before, but the trick is to avoid climbing too quickly and give my body some time to adjust to the altitude – while also covering these gaps between villages so I don’t have to carry too much food/water. 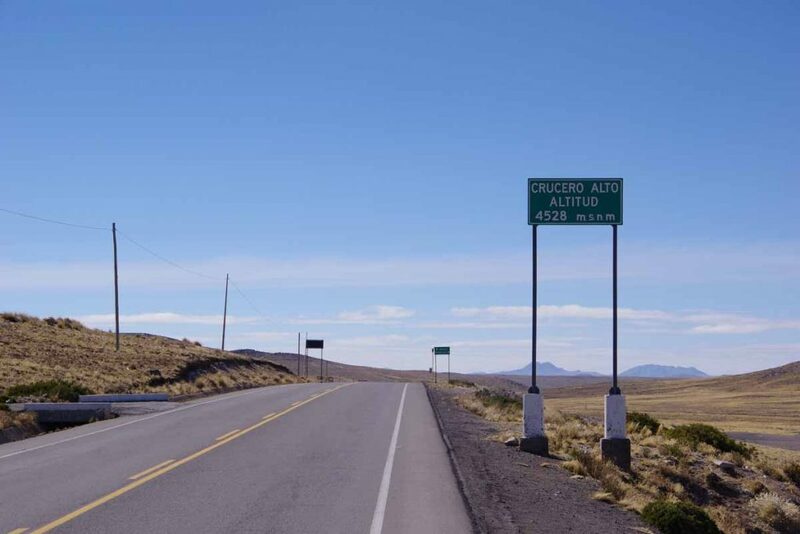 It is right around 100 kilometers where the road is above the 4000 meter mark and I’ll be camping somewhere once or twice in this gap. 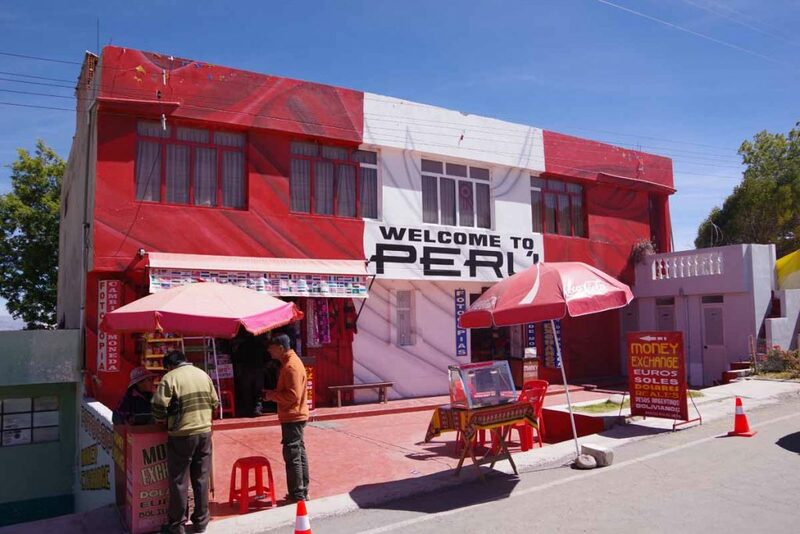 Quick, name Peru’s second largest city! Six months ago, I wouldn’t have had a clue. 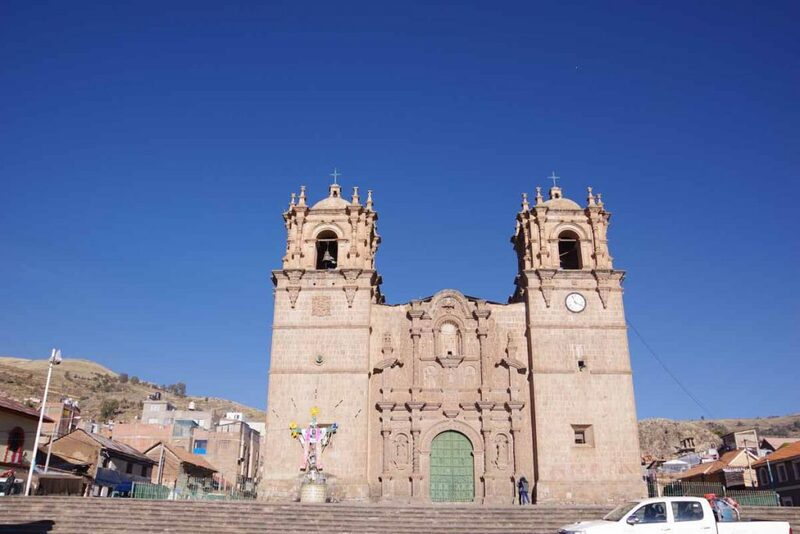 Even last month as I was cycling through Trujillo, Peru’s third-largest city, I was thinking, “when I come through Cusco I’ll have visited the three biggest cities in Peru.” Well, I am not riding through Cusco and but did reach Arequipa today. 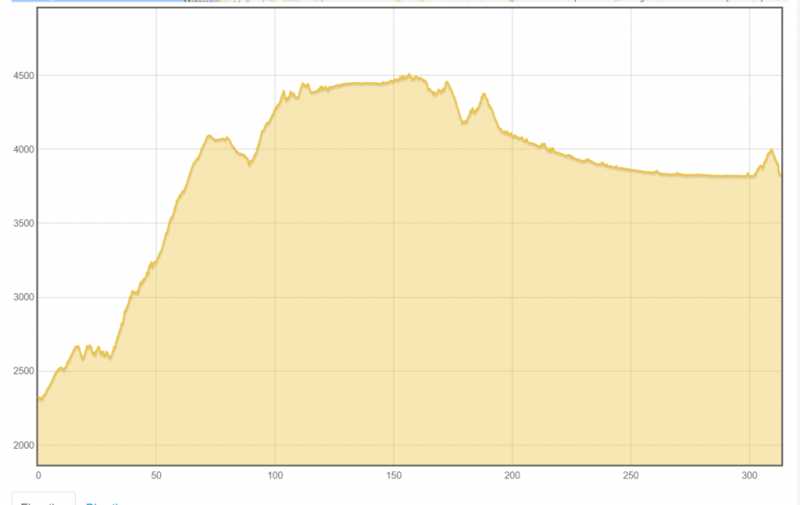 Not an extremely difficult ride, with only 50 kilometers and a little over 1100m (3500ft) of climbing. 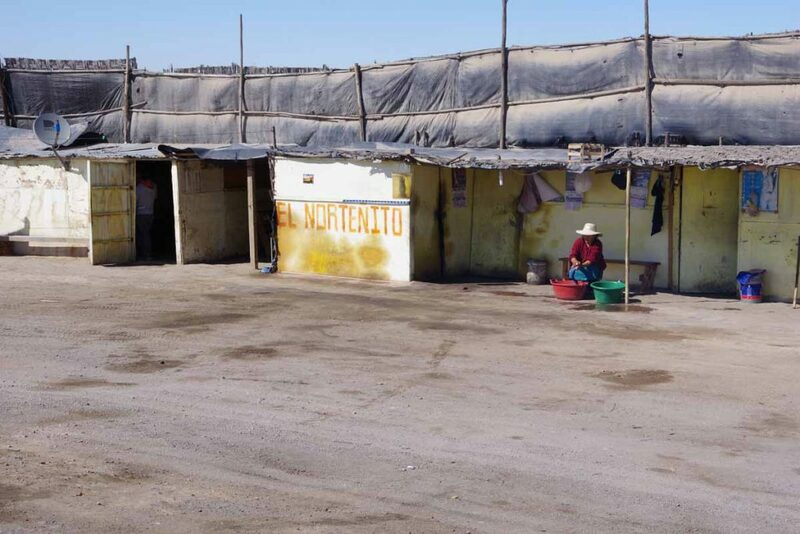 On the outskirts of El Cruce, there was a cactus farm. 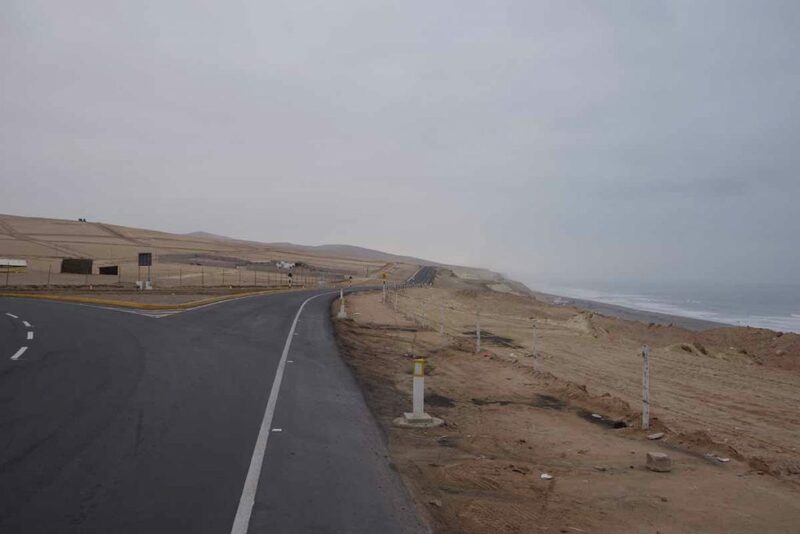 A short while later, the road split and Pan American Highway continues south to Tacna. I took the left road up and over the hill. 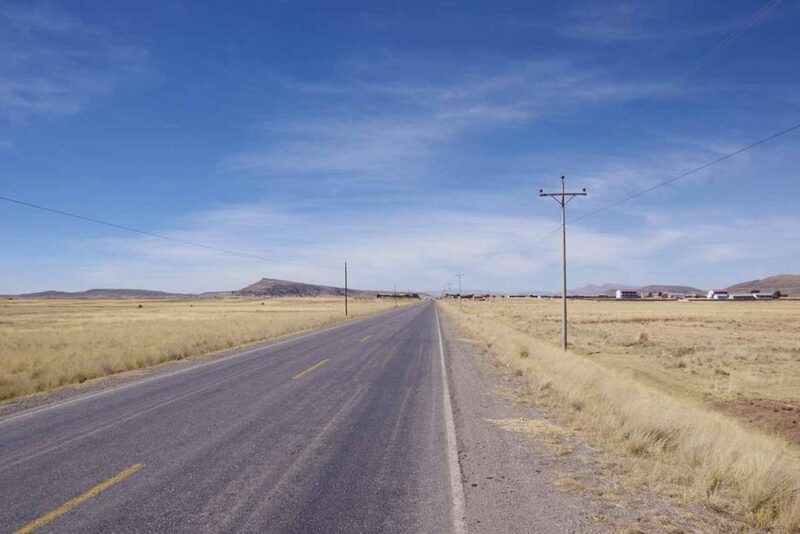 It was a nice road with not as much traffic as one might expect approaching a city of nearly a million people. 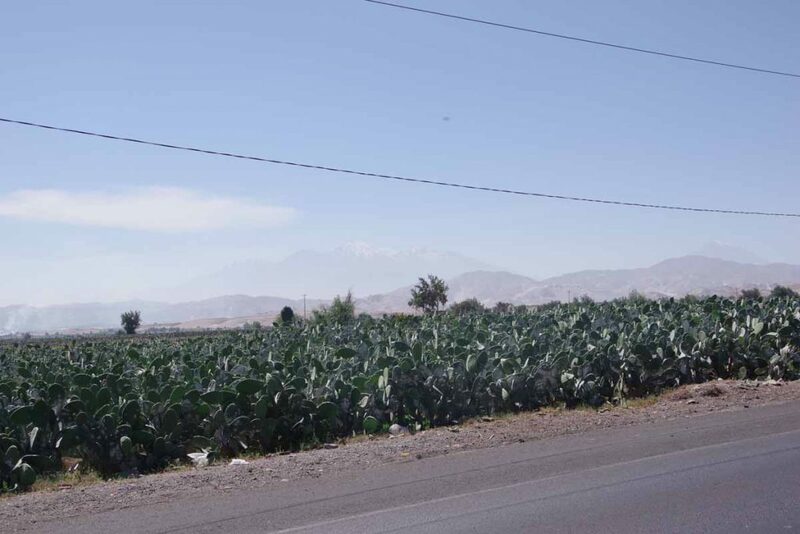 As I got closer, I could see one of the volcanos that loom over Arequipa. There were several weird splits in the road. I would get out my Android map application and sort out the best choice. Nice to reach the city outskirts itself! 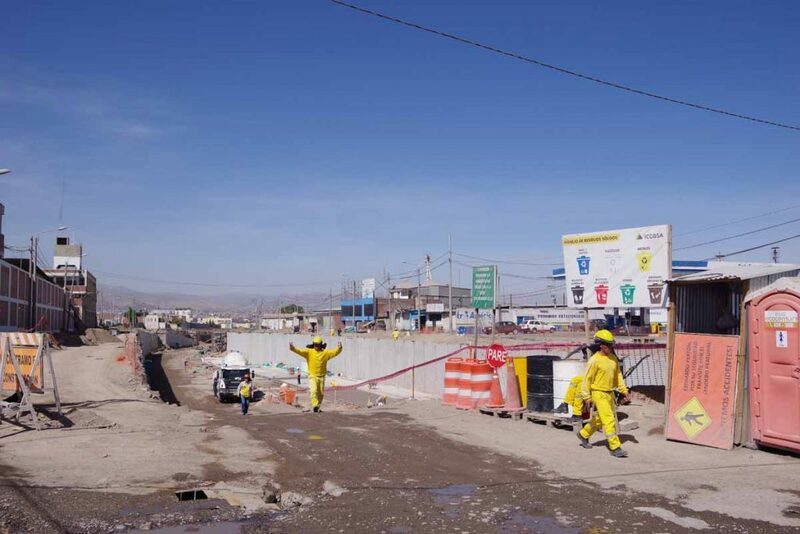 The main road turned out to be a construction mess. I walked past parts of this construction and slowly found myself to middle of the city. Another nice hotel recommendation from my Uncle Gerard. Right downtown and not too expensive. 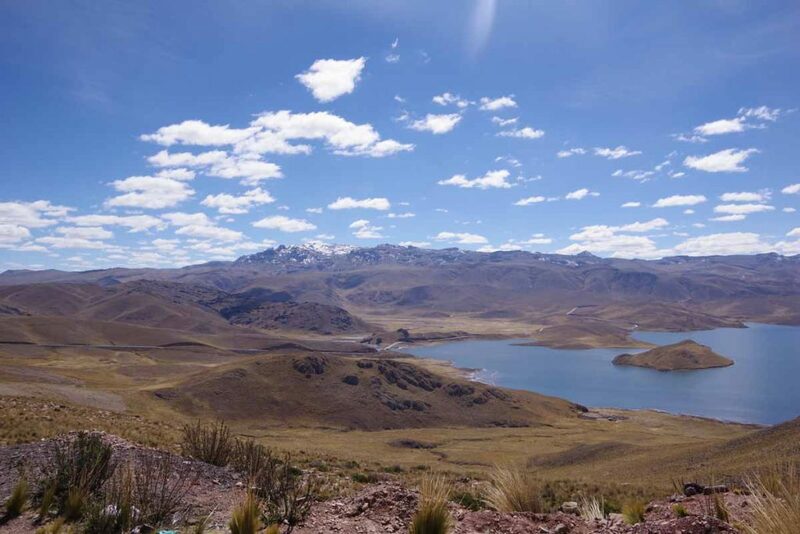 Plan is to spend a rest day or two here and make sure all is in top shape for the climb from here (2300m, 7500ft) up to the Altiplano (4500m, 14,800ft pass and about 500m lower for the plateau). I first went looking for a bike shop, since figure it can be good to get a service. 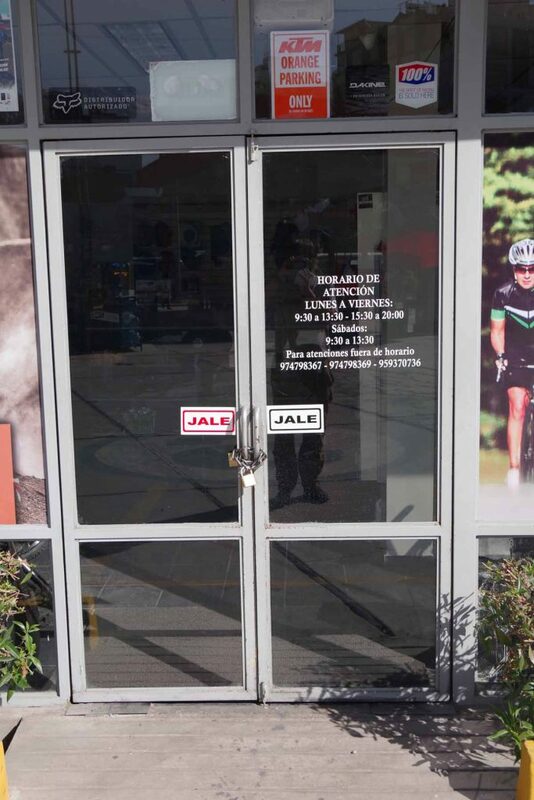 The Specialized shop was closed for afternoon siesta. The other one nearby was also closed. Went to nearby mall. 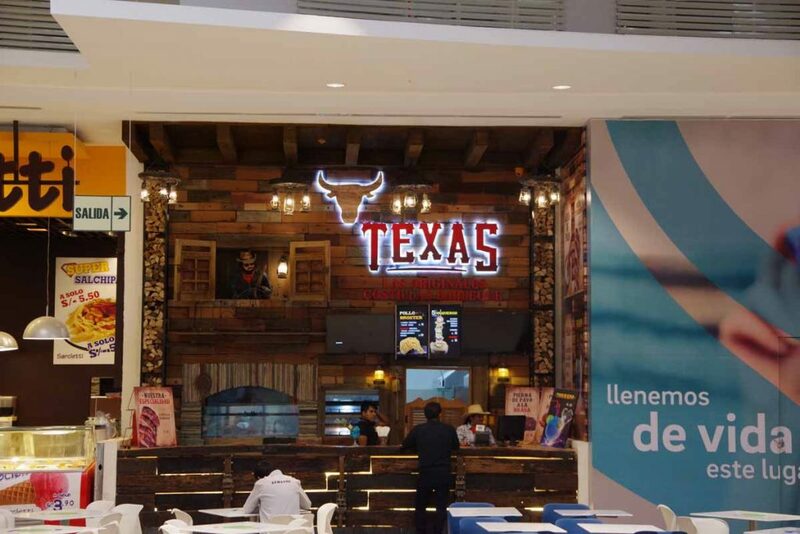 The food court had a “Texas” restaurant. After lunch (not at Texas), I went back and investigated the Specialized shop and then brought my bike there for service. Otherwise plan is to visit an outdoor shop or two. I think I have all the camping and cold-weather gear I need but doesn’t hurt to browse and see what else is there. 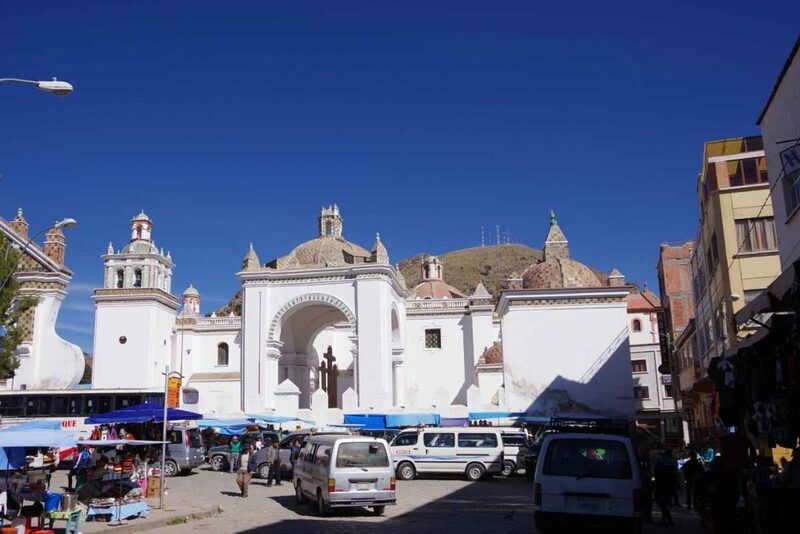 Arequipa is otherwise a touristy place with many “Tourist Info” shops selling bus tours and trekking tours in nearby areas. 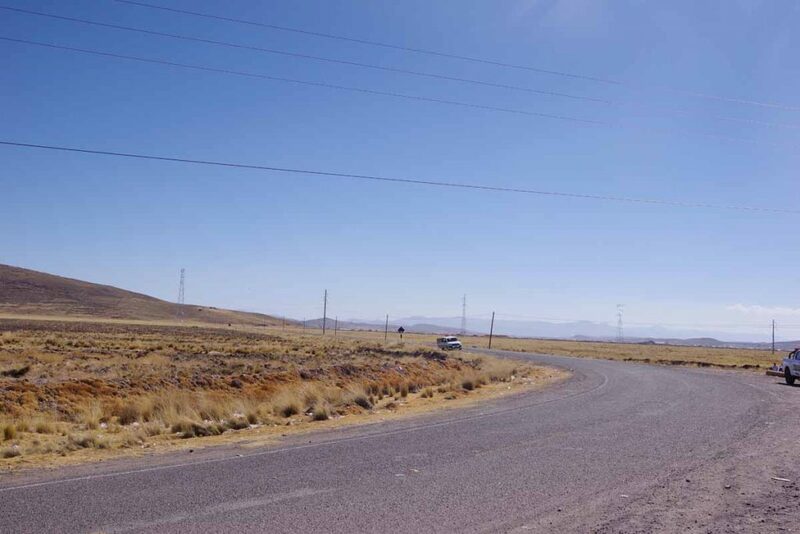 Otherwise a nice comfortable place to get everything set up for ~2000km riding from here up and over the Altiplano. 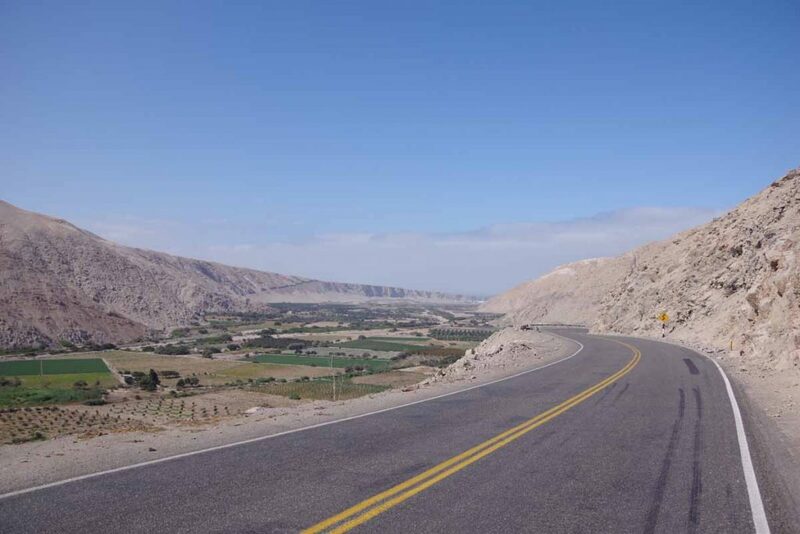 Shorter ride today as I split the remaining distance to Arequipa into two days and stayed in one town in between with hotels. 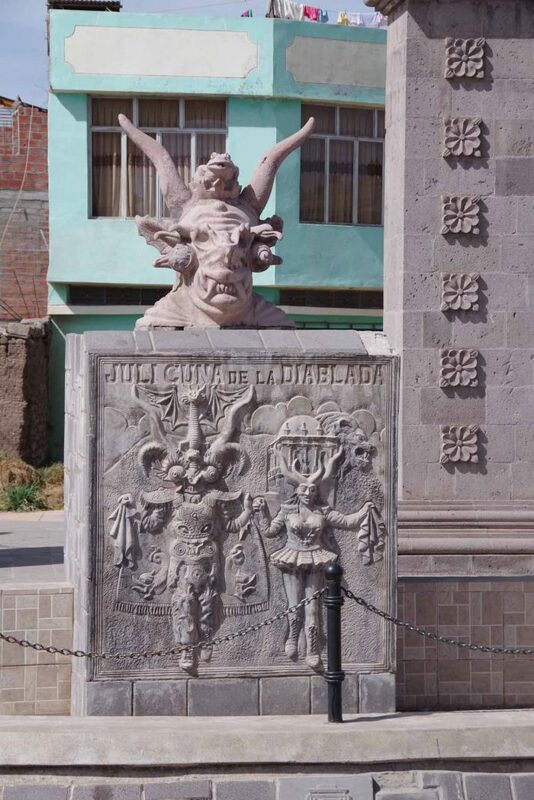 El Pedregal was nice little town to stay yesterday. 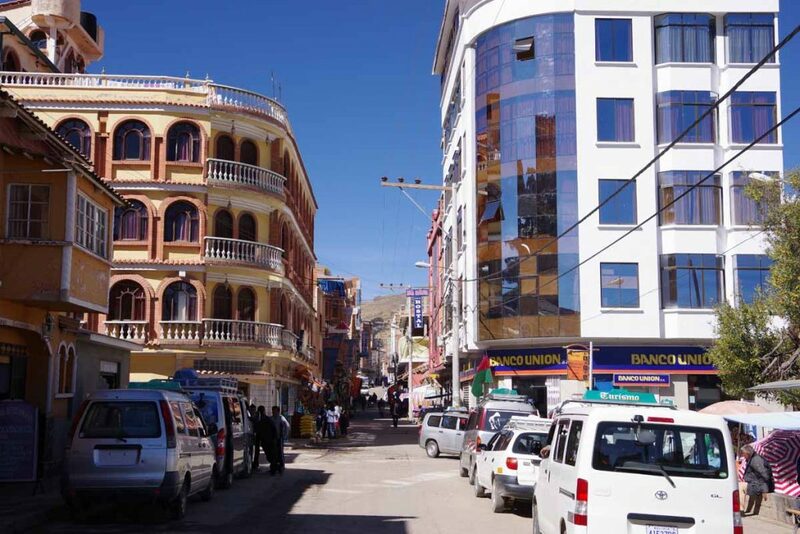 Lively market and busy downtown streets. 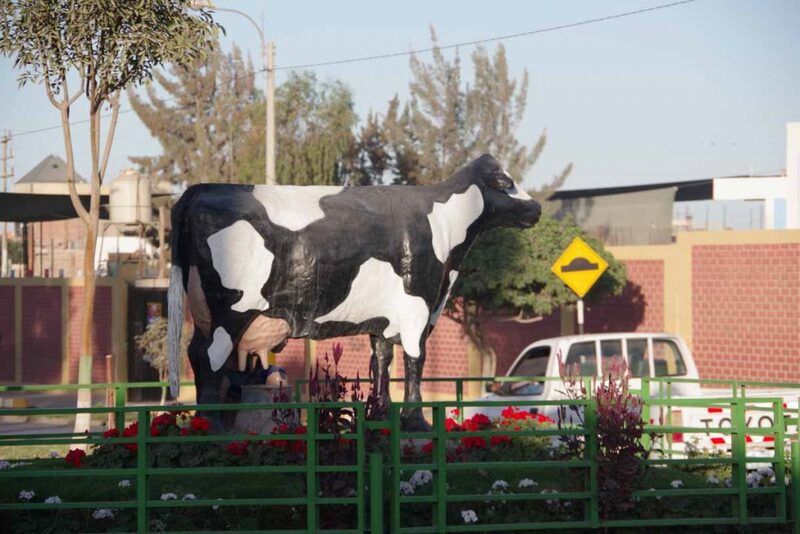 This morning passed the dairy statue on way back to the Pan American highway. Two descents today both between 100m and 200m and otherwise a good stretch of level and some gradual climbing. Once again some wide open spaces with not much growing. This photo taken just before going down into the second valley. 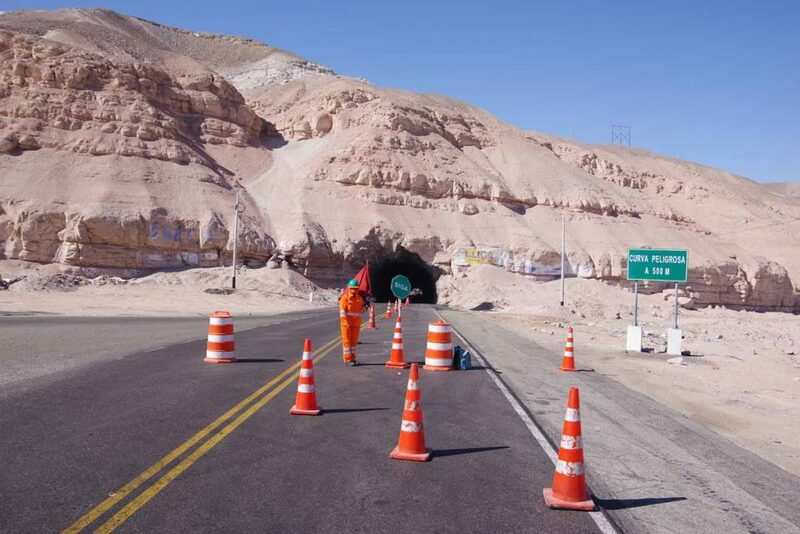 There was a tunnel at the bottom and it was only one lane at a time. I cycled on the closed parts this time. After this another valley to cross and then a start of a long gradual climb. In total this climb will be ~1600m (5000ft) but split between today and tomorrow. 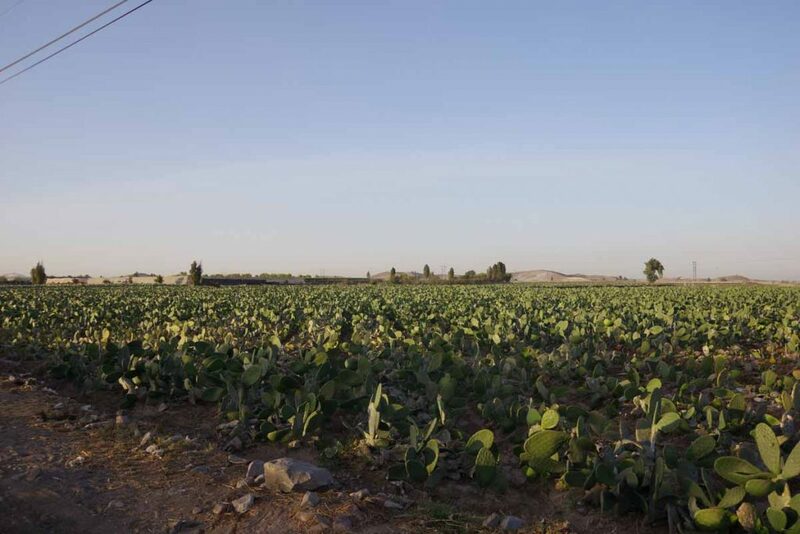 Cactus is one of the crops grown here. 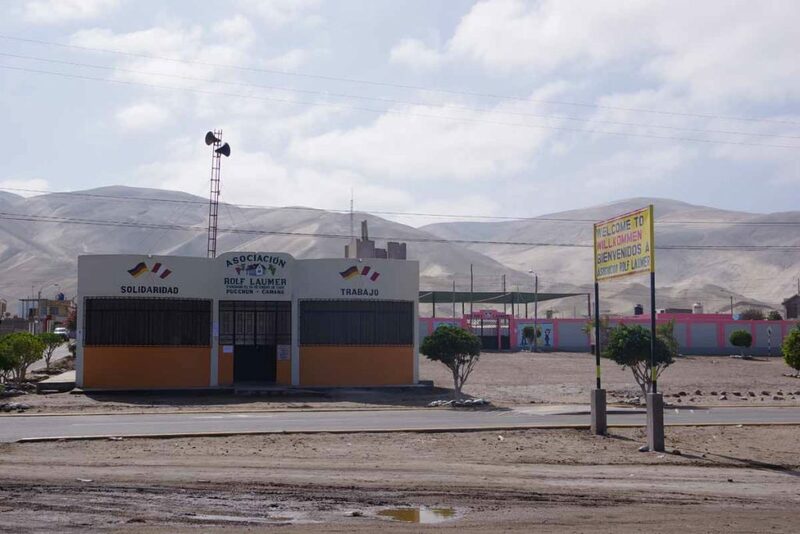 El Cruce is a longer town where businesses seem to be strung along the highway. Several hotels to pick from. Otherwise shorter day before planned ride into the big city. Away from the coast and start up the hill. Today I climbed to 1375m (4500ft) as I started away from the coast. 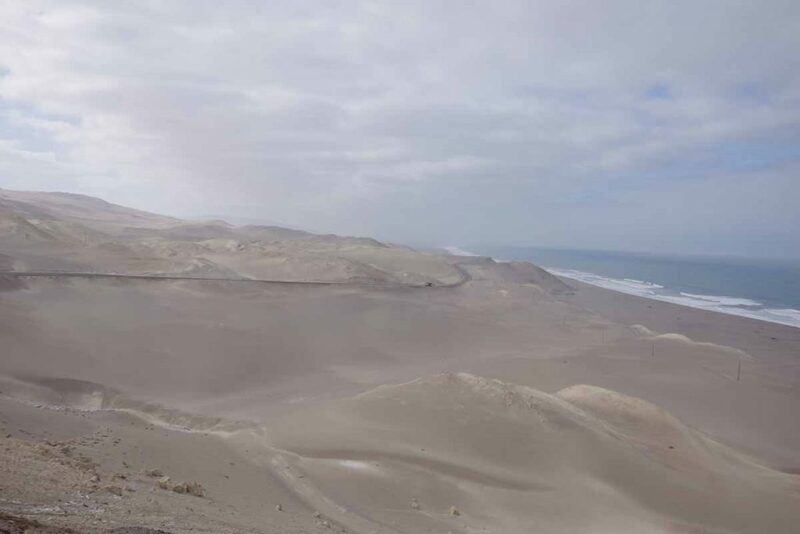 The first 10 kilometers were very flat and came along several beach resorts. 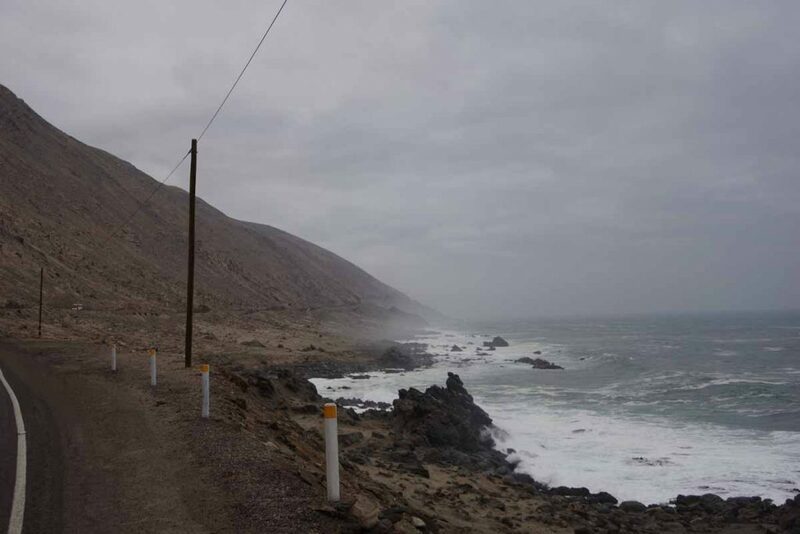 Here there was a roundabout and one road that continued along the coast. I took the other road. For the next 18 kilometers, it led up the hill to climb to 1000m. 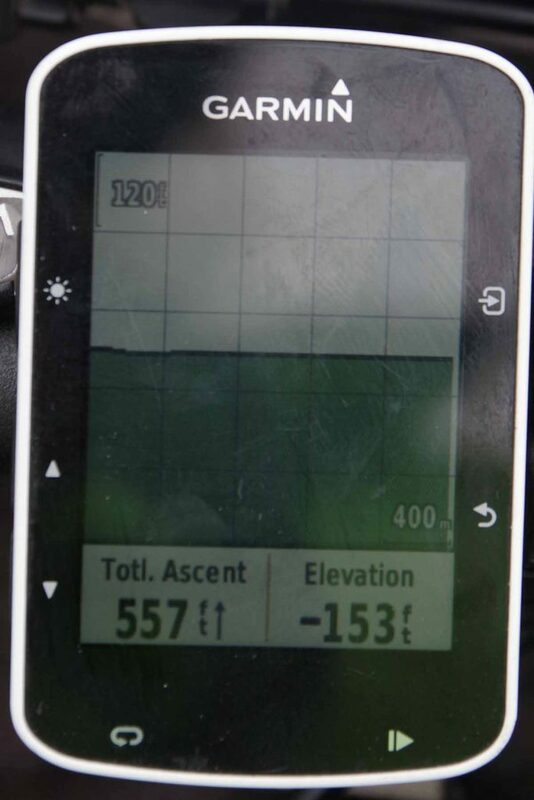 It was a consistent climb and never much more than 8%. There still wasn’t much vegetation here. One of my favorite signs about using your road intelligence, along with the tagline of “don’t leave rocks in the road”. Hooray! It was nice to get to the top. The terrain opened up. The next 15km were mostly rolling but keeping at the same elevation. After that a gradual climb again. In contrast with riding along the coast, there wasn’t a headwind. More often cross wind or even slight tail wind. A woman working at one of the places along the way. 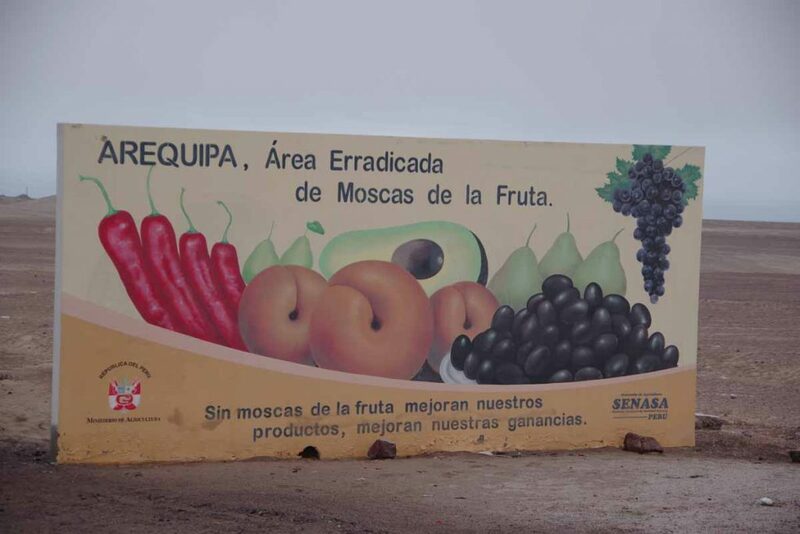 I came past a citrus orchard and then at 60km there was a road junction along with a small store. It was a good execuse to sit and take a break. As I was sitting there, the local bus came past. People came out and the store owners sold them some prepared food. 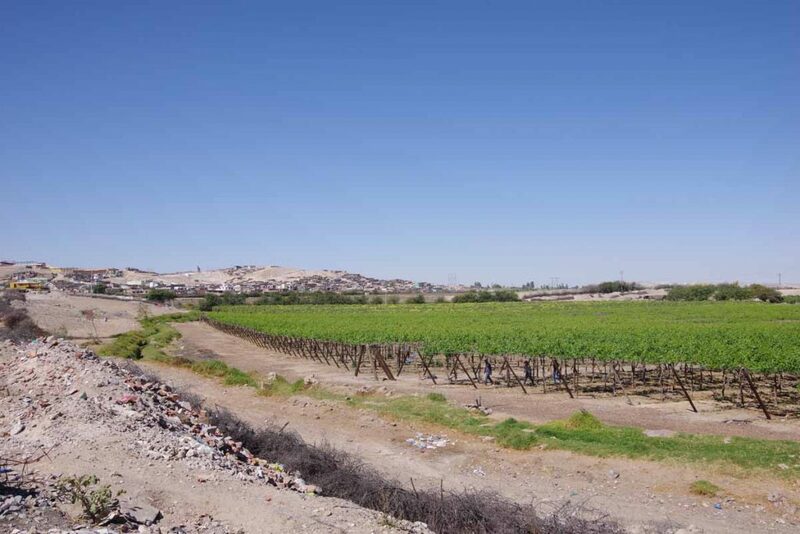 After this, the area near El Pedregal had more agriculture. I took the turnoff into town and had several hostals to pick from. Found a reasonable one and walked around town. 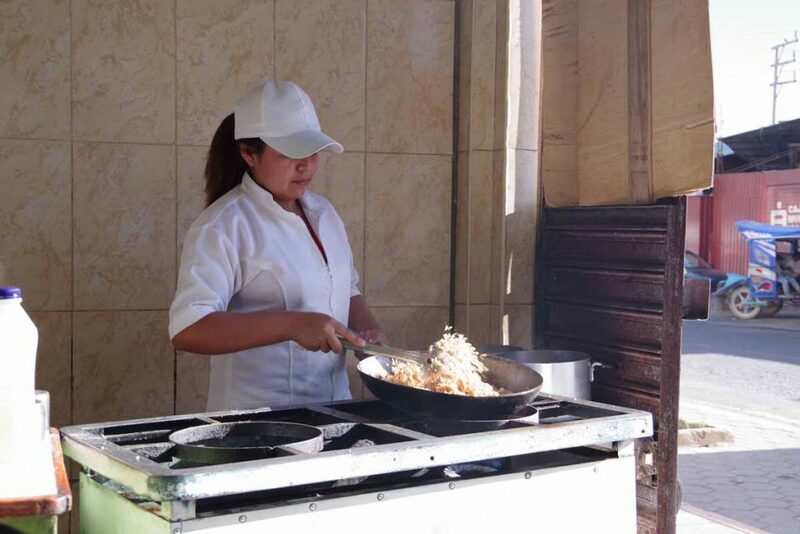 One of my common lunch items (chicken-fried rice) being prepared. 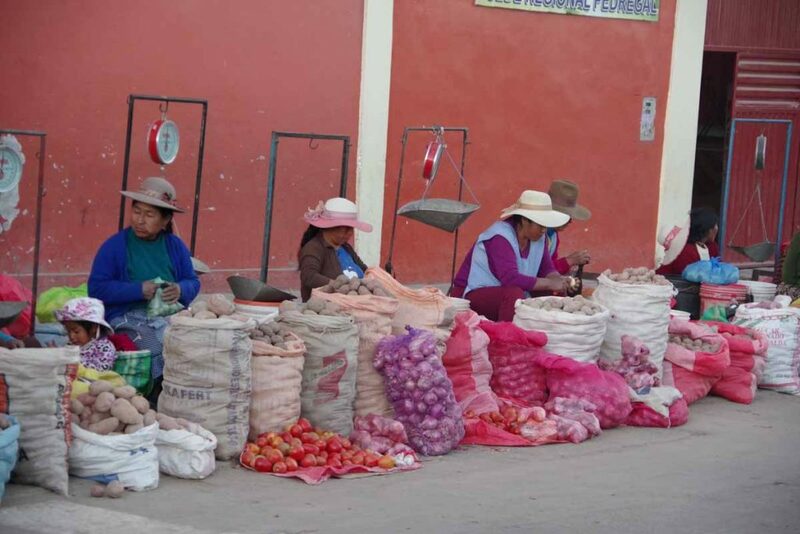 A number of women here selling and some peeling potatoes. Must be one of the crops in the area. Today TDA was scheduled to depart Cartagena. 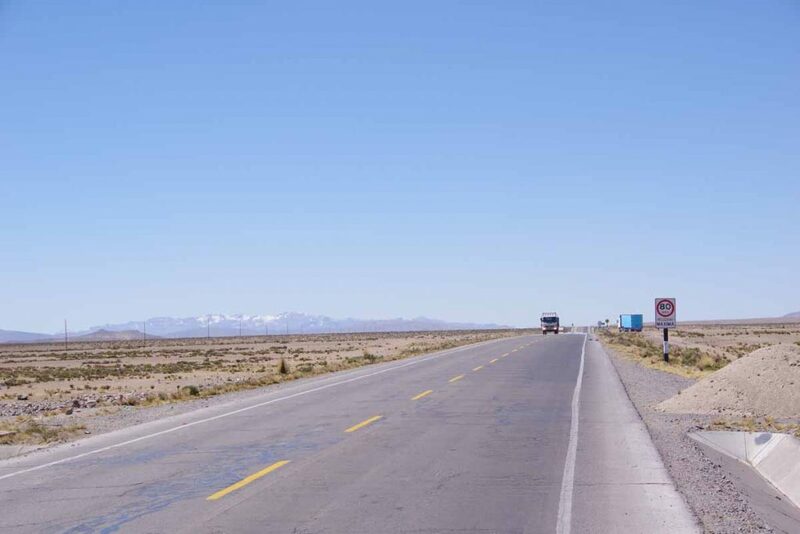 My calculation says they have somewhere near 11,200 kilometers on their route to Puerto Montt. My distance is closer to 5,000 kilometers. So it will be an exercise of the tortoise (me) staying ahead of the hare (TDA) on our respective journeys to Puerto Montt. Wow! Really liked the scenery today as the road went along the rocky shore with waves crashing and creating white foam. There was a fair amount of climbing, though less wind. Nice rest day in Atico. I expected today to be tough with a lot of climbing, though it ended up being easier than anticipated and with less wind. 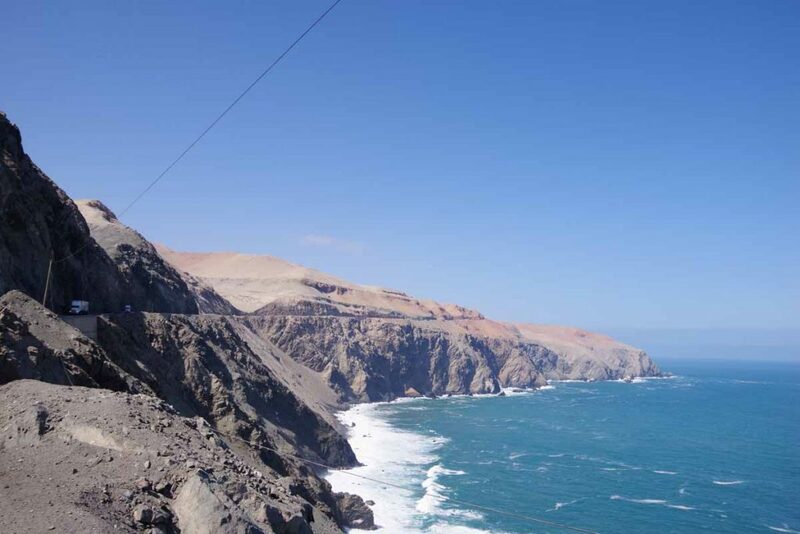 This part of the coast had steeper cliffs with the road cut right in. 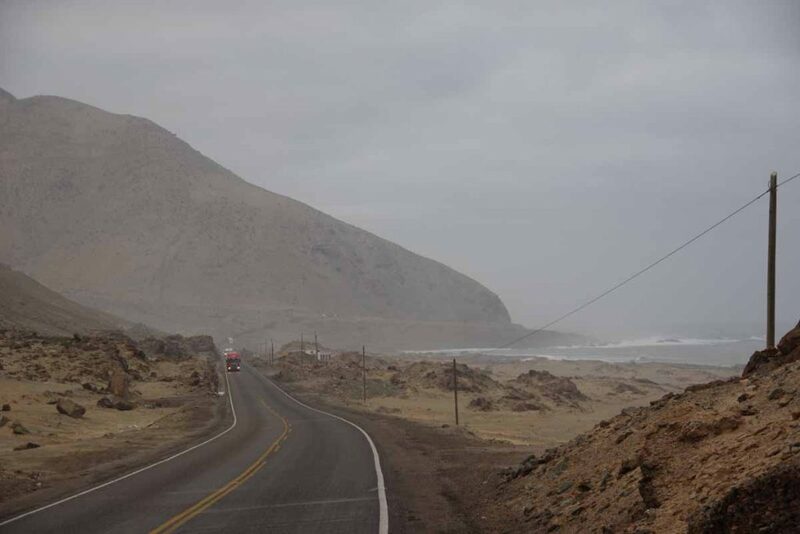 Imagine the Big Sur coast in California in a desert without trees and with 18-wheelers on the road. My photos don’t quite do it justice, but ocean brought a lot of white foam. At the day went on it became sunnier. Heard a crash as I was cycling. The truck at left had just come into some collision that knocked out the right headlight. He had stopped and now the truck at right was trying to inch past. There was a backlog already building behind. Also shows that a bicycle needs to take some care since the lanes aren’t much wider than truck widths. Fortunately, most of the trucks were traveling slowly. The hills weren’t quite this steep, but there was definitely some climbing today. By mid-morning the overcast was lifting and it was becoming sunnier. My handlebar bag. The cell phone app is giving me distance to Ocono. The mandarin Orange has a UPC code of 4450, same as it would have in a supermarket in the USA. 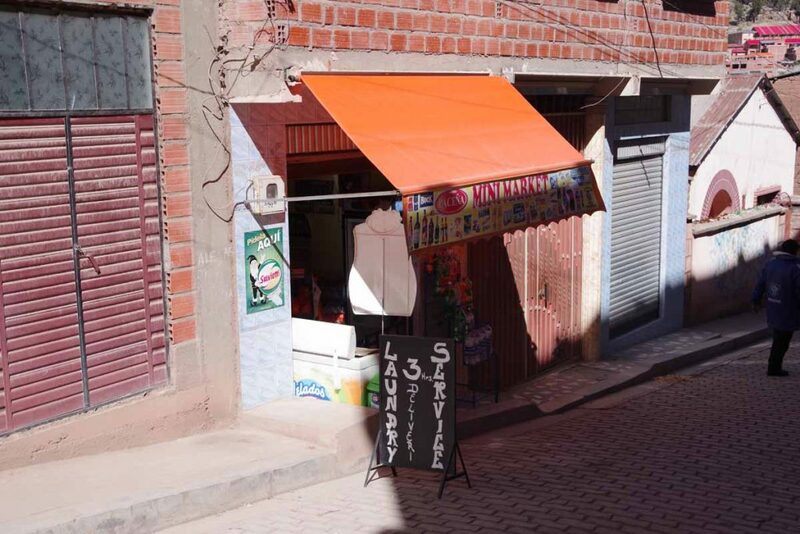 This suggests to me that some of the oranges in Peru are grown for an export market. Not necessarily the USA but otherwise you wouldn’t put a UPC code and “sweet easy peeler” on the sticker. One of the shops I stopped at. The cat was out sunning itself. The route crossed over the hills and then across this low valley. Met this pilgrim on the way. You can see his cross he carries in the shadow. It has a wheel in the back. 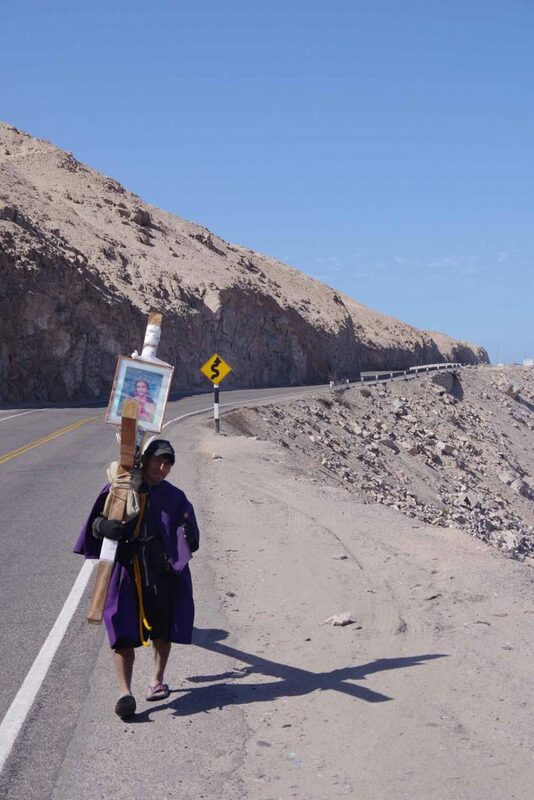 After talking with him, I think they are heading from Tacna to Piura. 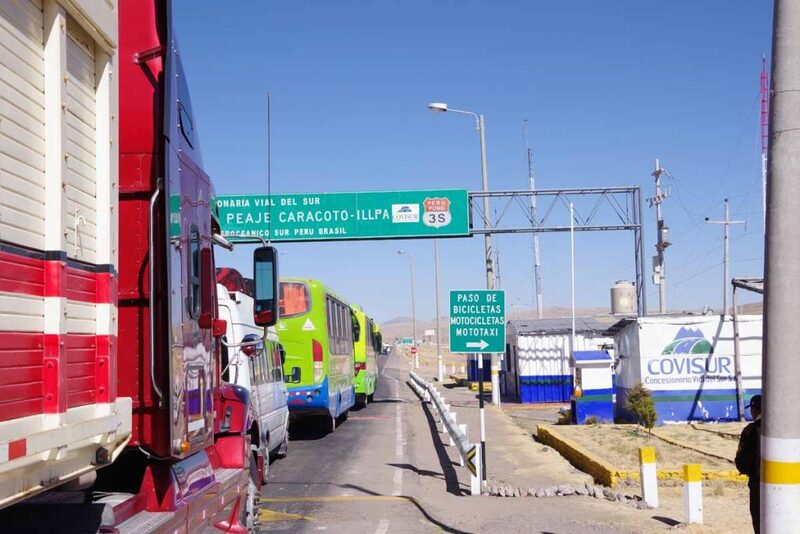 As you may recall, came through Piura some 1900 kilometers ago. 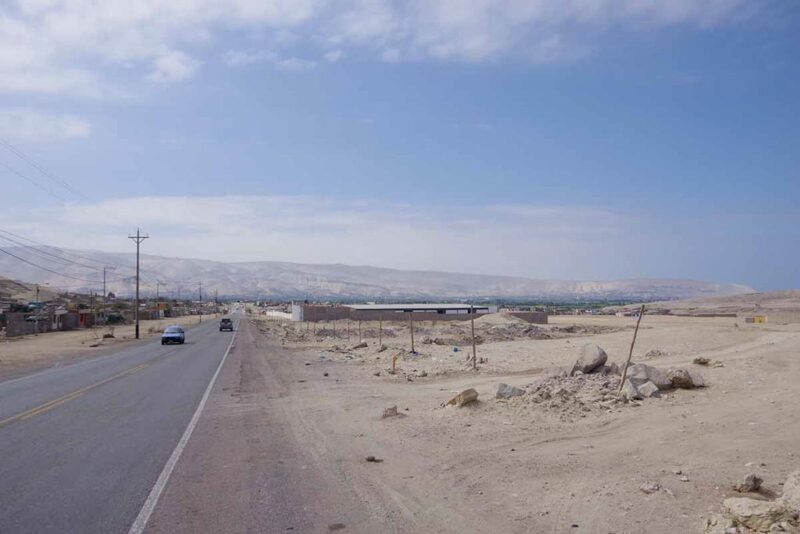 Tacna is going to make it a walk of some 2500 kilometers. Another of the towns. This one had a nice looking hostal. It also had a nice community garden. Not a huge amount of plants and the ones there were protected by these wind breaks. There was an alternate route for light vehicles. This is what it looked like. I decided to stick with the regular road. This was the valley that contained Ocona. The road first descended to a bridge and then came back to the town. I saw a hostal near the bridge but first decided to go to town. 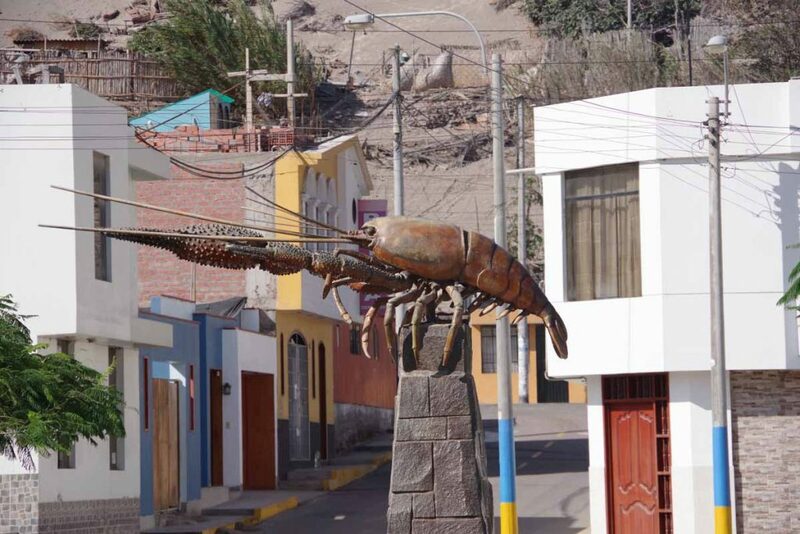 This crawfish was symbol at the town square. I couldn’t find a hotel here despite asking several folks. Decided to cycle back two kilometers to the previous hostal only to discover it wasn’t in business anymore. Now I went into search mode. Found a guest house after some looking. No wifi though, so this report will wait until I do have an internet connection. Interesting hotel/hostal last night. The owners eventually showed up and one woman was suprisingly loud as she was talking in animated voice over the phone. Someone else decided to start watching TV at 4am and the turkeys next door (actual turkeys not people) were also gobbling in the night. 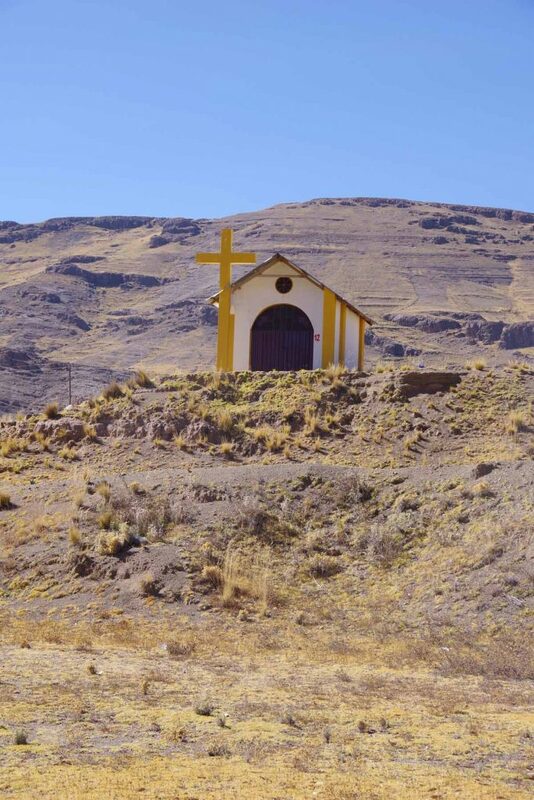 It was the lowest price I paid for lodging in Peru and reflected this. Back on the road this morning. 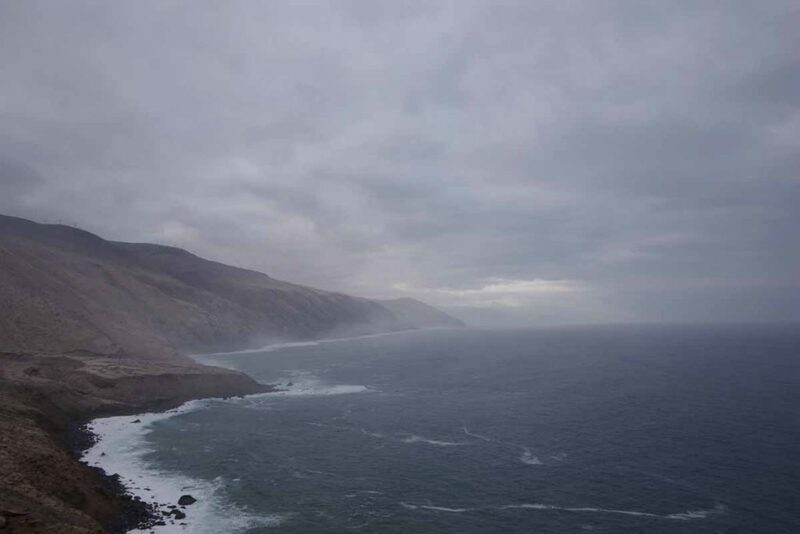 The coast was much less spectacular today with less climbing and a bit more wind. Here on the outskirts, the building tells us it is reserved for expansion of the urban area. They have plenty of room. The route started with a 300m climb up a large hill and away from the coast. 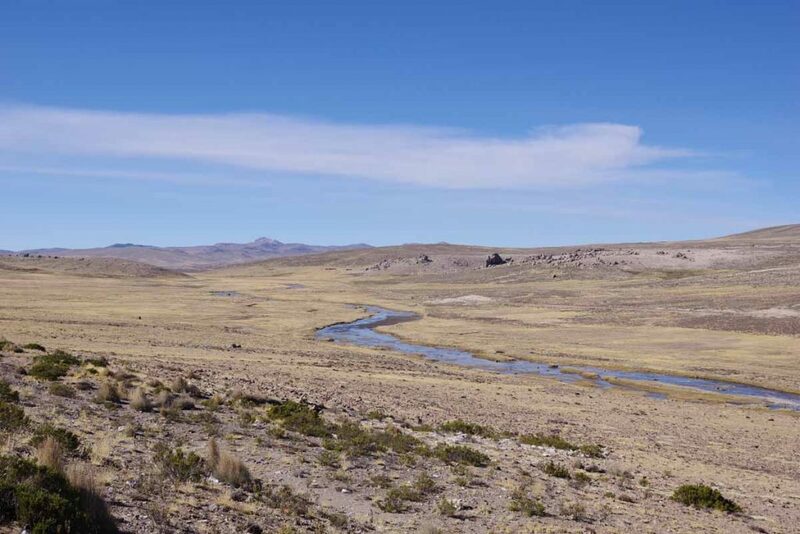 It ducked out and away through mostly barren areas before coming back at 26km. 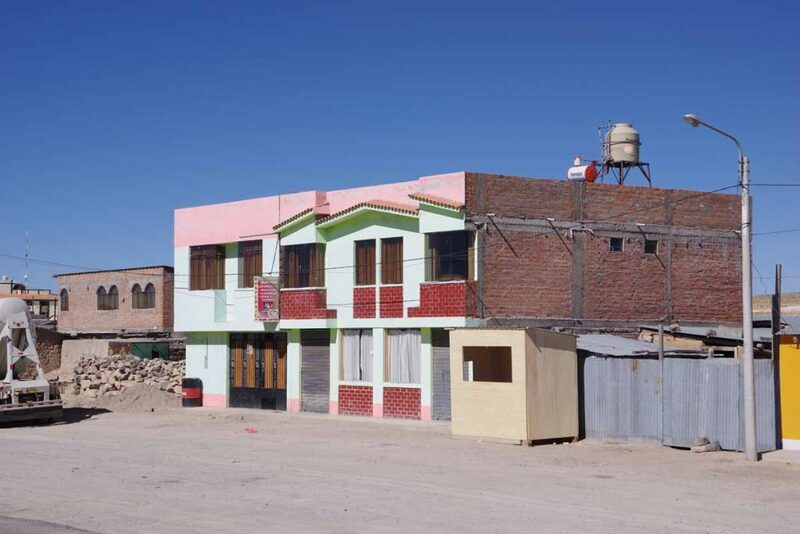 There was a sequence of villages here including one that had this German/Peruvian association building. 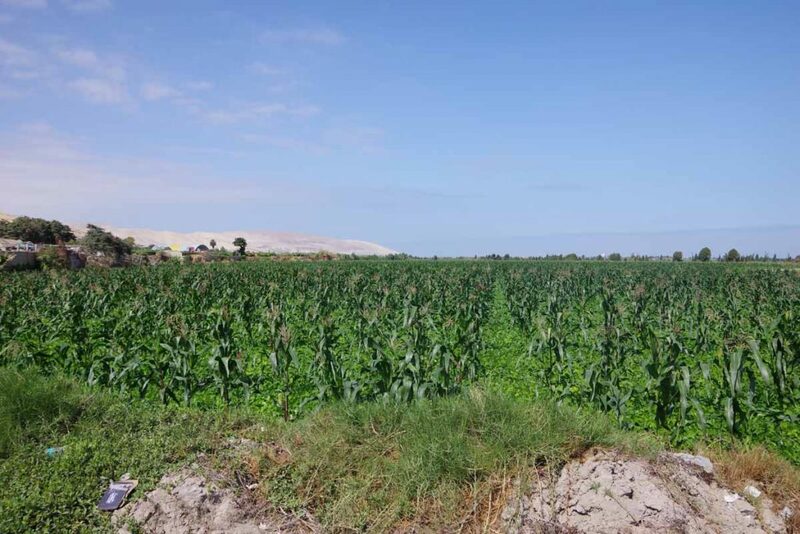 On the right, next to the ocean were agricultural fields and then the road with the villages. Camana itself was in a larger valley with fields. Corn and beans were planted in the same field. The corn was neatly lined in rows. 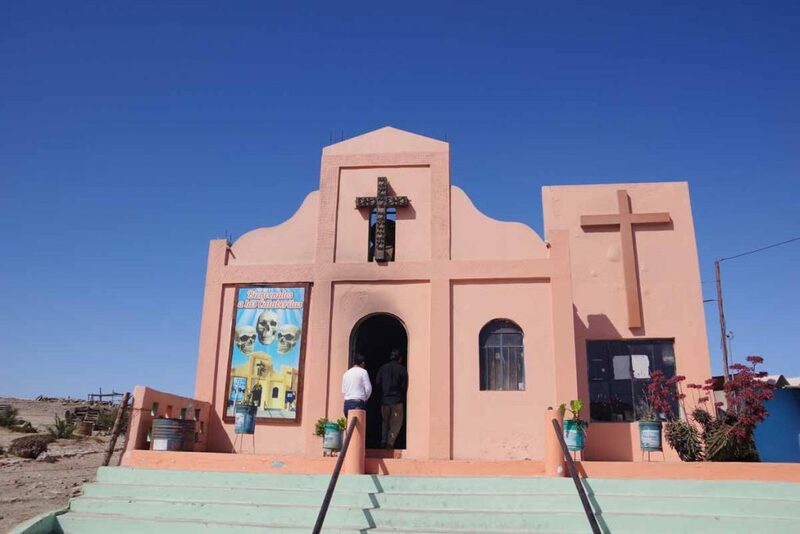 I made my way to the main square where I found this church as well as a reasonable hotel. 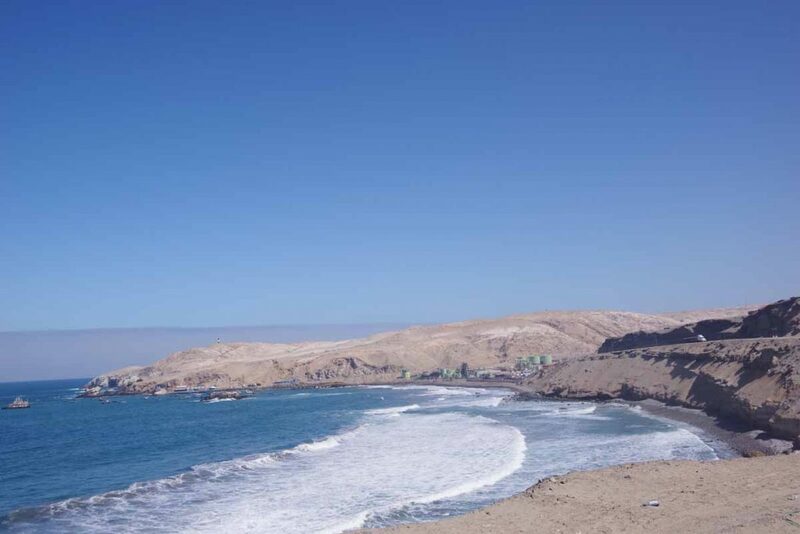 Apparently Camana is a resort area where people from Arequipa can come to the sea. 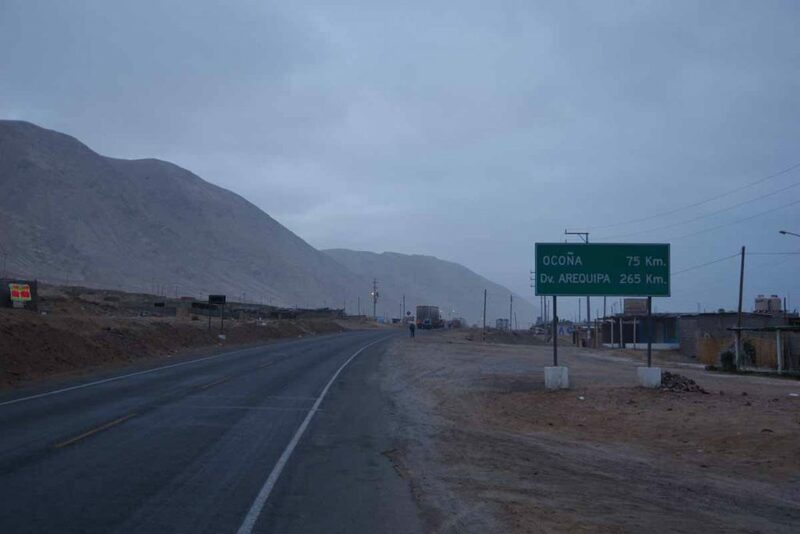 Arequipa itself is another ~180km away and further up the hill. 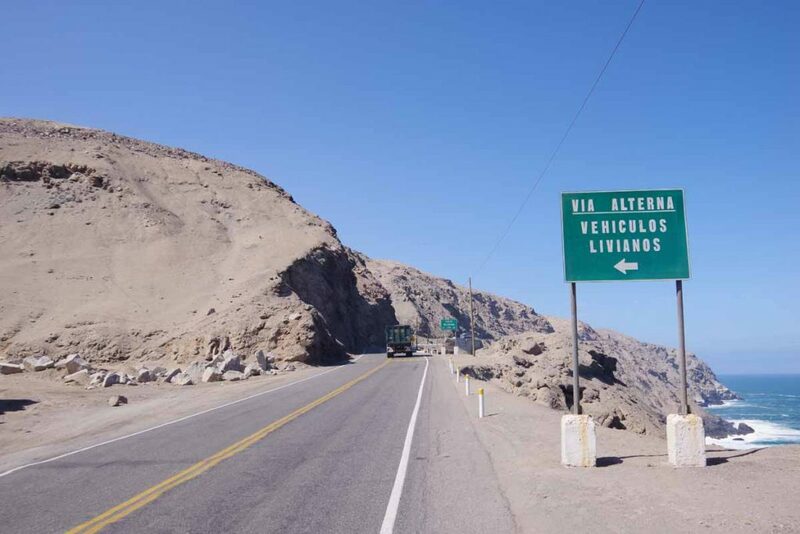 From here I have another 10km of coast before starting my climb first to Arequipa (elevation 2300m, 7600ft) and then up the Altiplano (highest elevation 4500m, 14,800ft). Once I leave the coast, do not expect to come back to the ocean until Puerto Montt. Surprisingly dry. 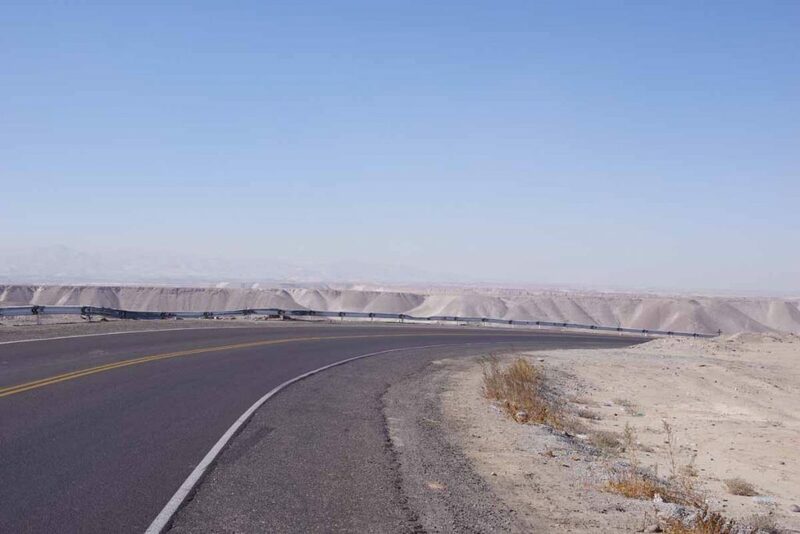 Mostly desert and in much of it, not even enough water to grow plants. 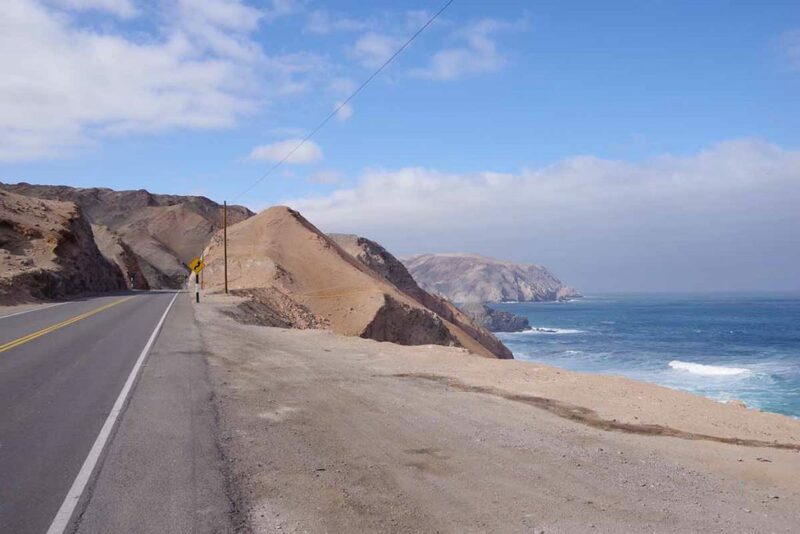 Overall, I enjoyed riding the coast but now also looking forward to a change as I see the Altiplano. 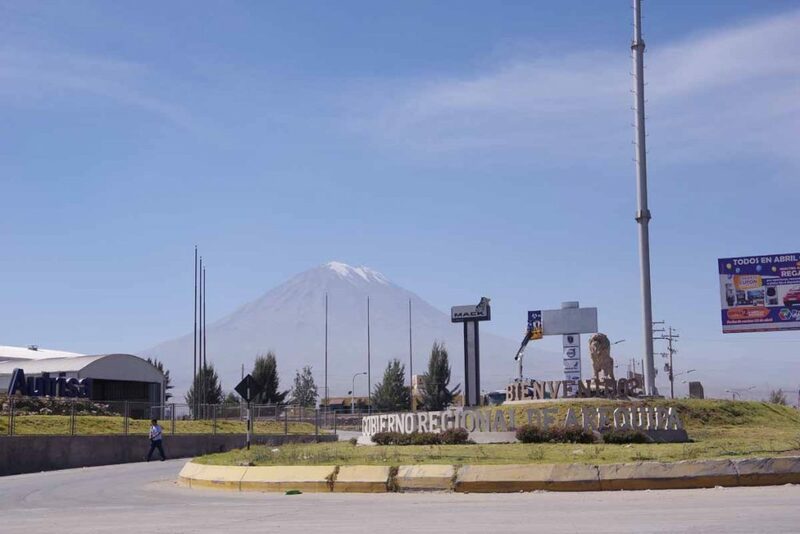 I’ll probably take a few rest days in Arequipa as it is the major town before the climb. Also get a chance to let my body adjust to a little bit more altitude. I also expect a bigger day/night swing in temperatures so will need to learn to stay in the warm tent for a bit rather than trying to ride right at sunrise. La Paz is pretty much due east of here so the days will stop being shorter and instead both sunrise and sunset will shift earlier. 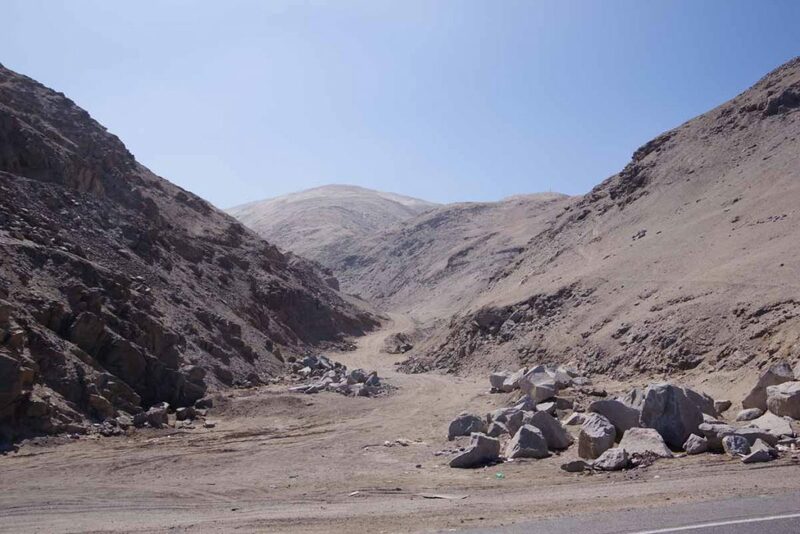 First several tough days of climbing to get just to 2700m and to Arequipa. Not sure how much internet I’ll find along the way. 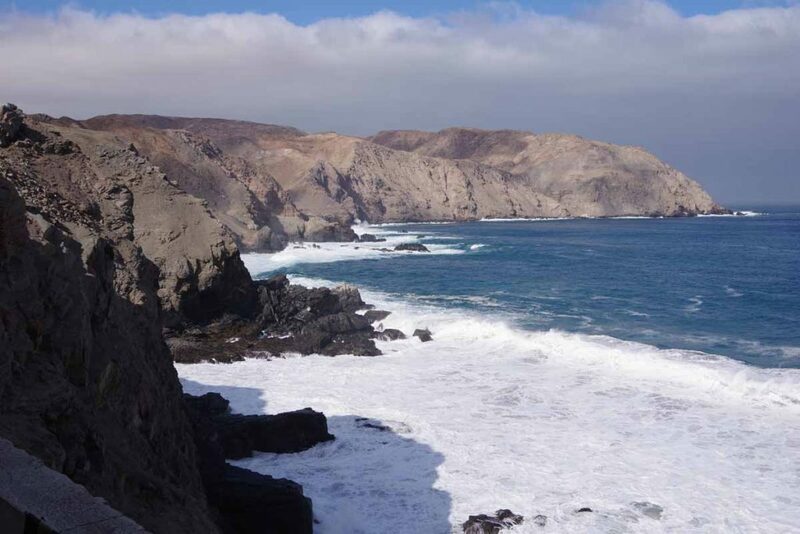 When I woke up in Chala, the wind was already blowing. 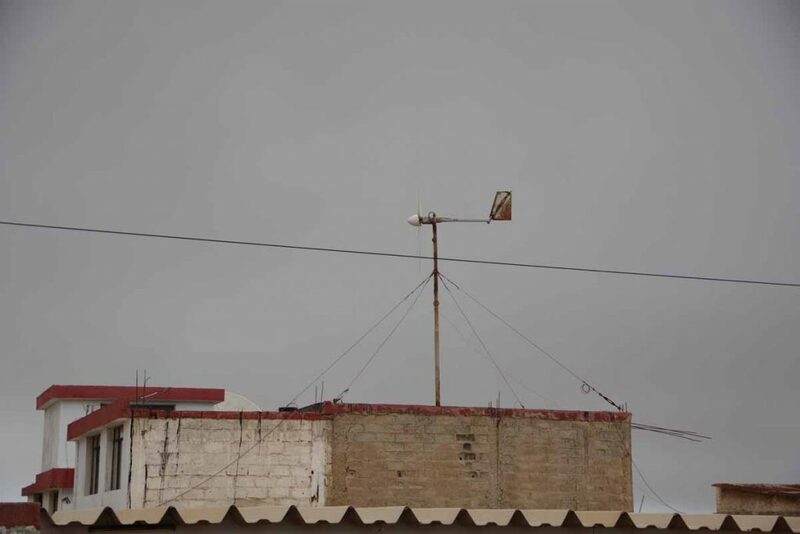 The weather vane was spinning along as I passed. The road climbed up over a 200m hill in the first ten kilometers. After that, rest of the day was always within 100m of sea level, but still with occasional ups and downs. Saw this sign about avoiding fruit flies, but didn’t see much in way of fruit trees today. 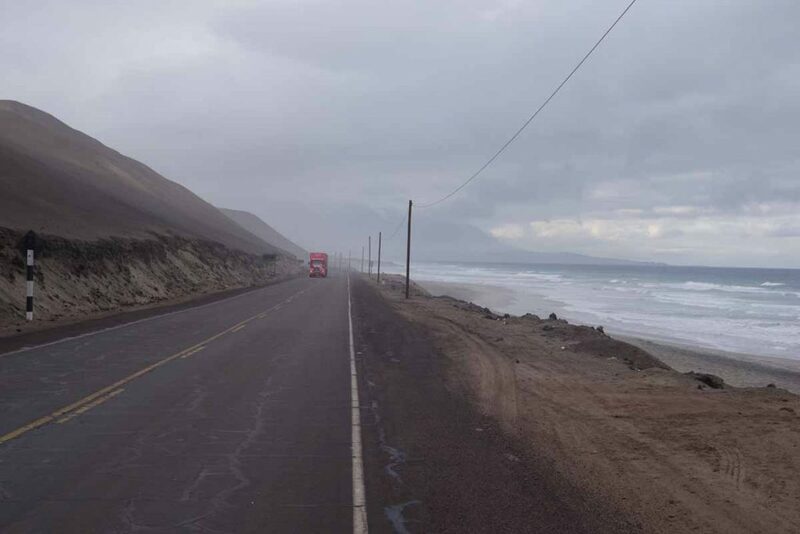 After climbing the first hill, the road came along the ocean. There was a moderate wind and got stronger by mid-morning. My cycle computer behaved a bit weird by giving me an elevation below sea level. At 33km I stopped at a restaurant and let the computer turn off and on. After that, it gave a better elevation. Skies were sunny by mid-morning and then clouded almost to drizzle at end of the day. Met these two cyclists zooming along with nice tailwind. I missed exactly where they were from but either Italian or South American (I had asked one in Spanish if he was German based on a clothing item he had, but I think we misunderstood each other since I don’t think they were German). 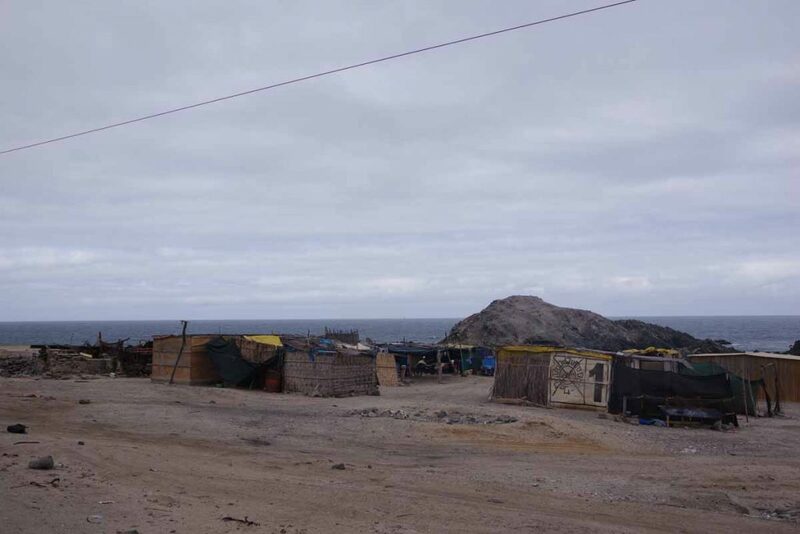 There were these shacks along the ocean. Not sure how many are temporary living vs. permanent, but had dogs come out several times to run after the bike. I’d stop and they would also stop. I’d then point and say “no” and most of them would look around and eventually go back. 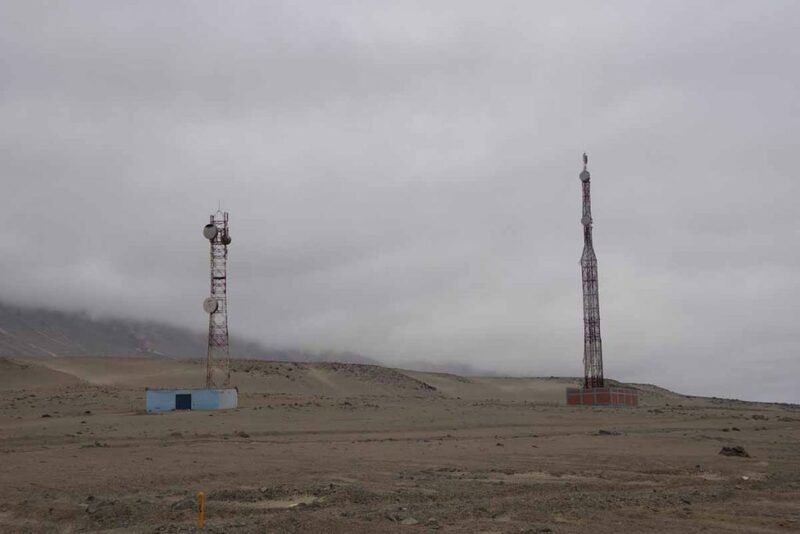 The wind was often strongest as I’d come around these towers. This was the only little town I came through today before Atico at the end. Hooray! Nice to finally get to Atico. My average for the day was only 11km/h but nice to cross the distance rather than camp somewhere along the way. Planning a rest day tomorrow and booked a hotel for two nights. There isn’t much here in Atico, but the next 74km have a lot of climbing (~2800m according to Google Maps). Not sure if I’ll cross it in a day, but will be in better position with fresh legs.